Swarovski crystals and metal charms. 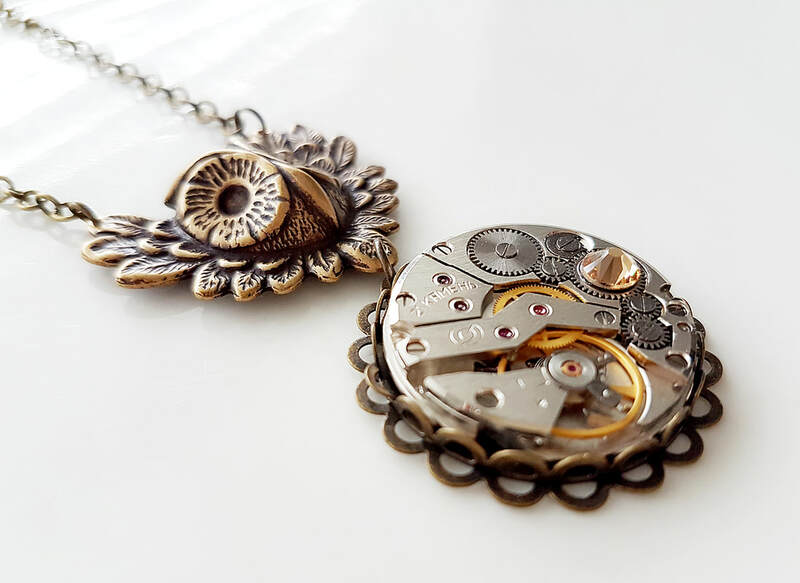 All Watch movements shown here are now unique beautiful pendants, they are no longer "time keepers"
Gorgeous Lace Choker - Victorian Inspired. 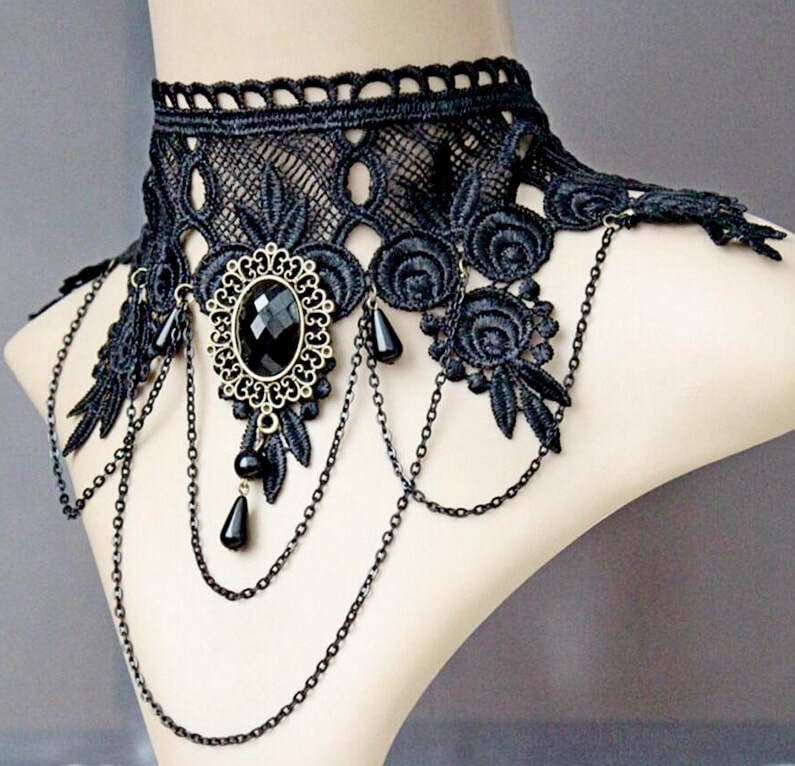 This gorgeous Black lace Victorian Inspired Choker is fabulous in its detail. A generous adjustment chain at the back assists in a perfect fit. 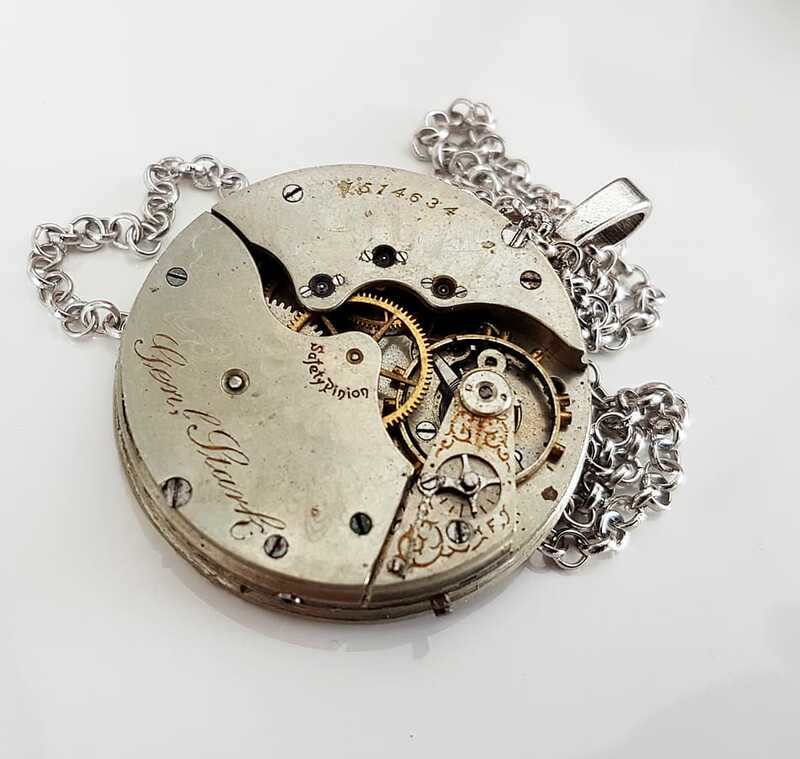 Feel free to contact me if you would like to discuss options of having a small watch movement added as a centre dangle rather than the tear drop bead, or any other bespoke alterations you would like. 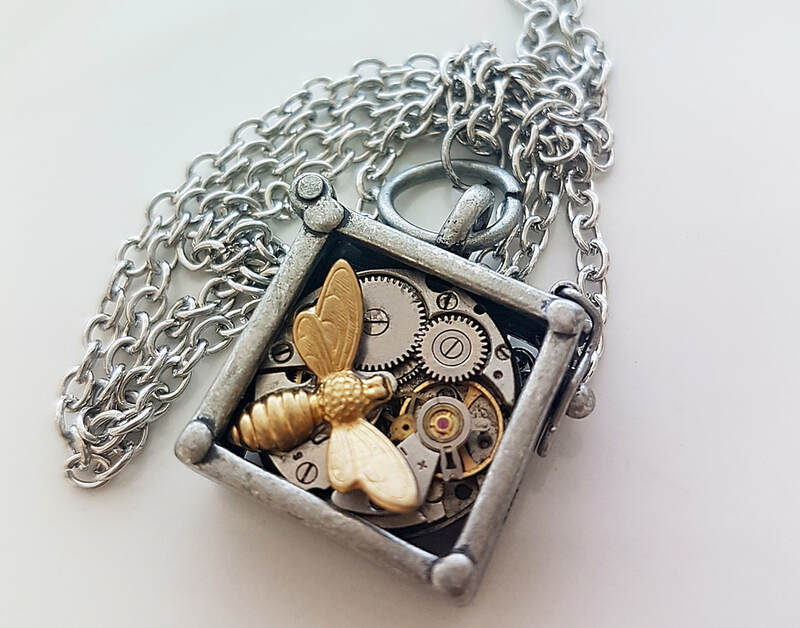 This 2x2cm Industrial Chic top hinged Locket holds a small vintage watch movement and a gorgeous detailed polished brass bee. Comes strung on 60cm of cable chain, but I can adjust this to any length, just leave me instruction at checkout. 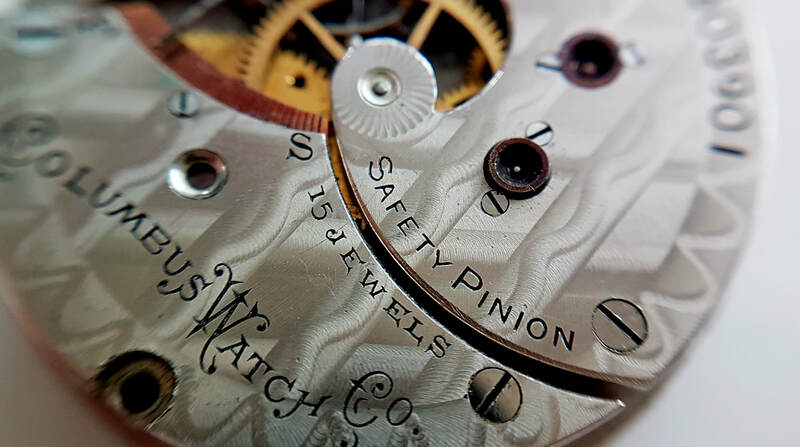 Two-Tone movements were reserved for premium watches due to the extra time and attention during the manufacturing process, resulting in some of the most beautiful movements ever produced. 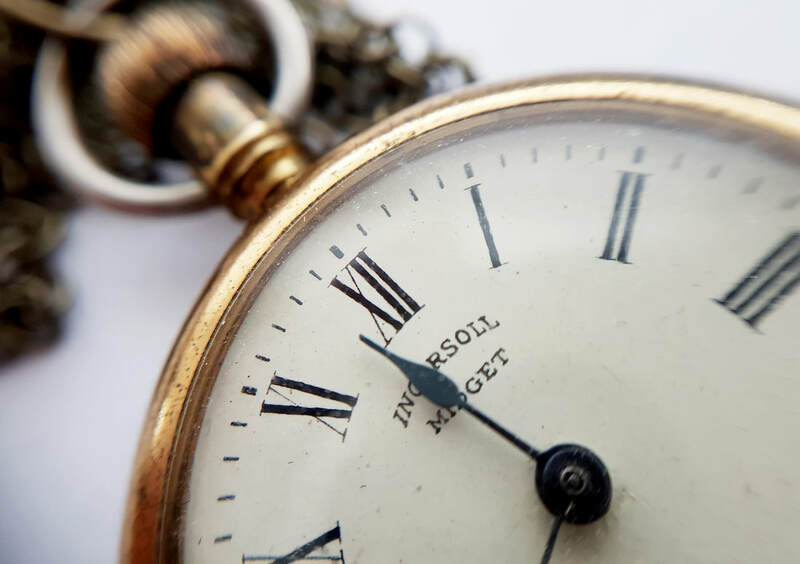 The Seth Thomas Clock Company was very prosperous into the 20th century and was considered to be one of the premiere American clock manufactures, even by their competitors. This beauty has amazing guilloche tooling and layered gilt gold tone work. It measures approx 35mm across and manufactured around 1892! Its strung from a sturdy top bale and 80cm of dark silver belcher chain. I have glazed the back to protect the enamel face and avoid snags to clothing. These are extremely hard to find. Contact me if you have any questions. 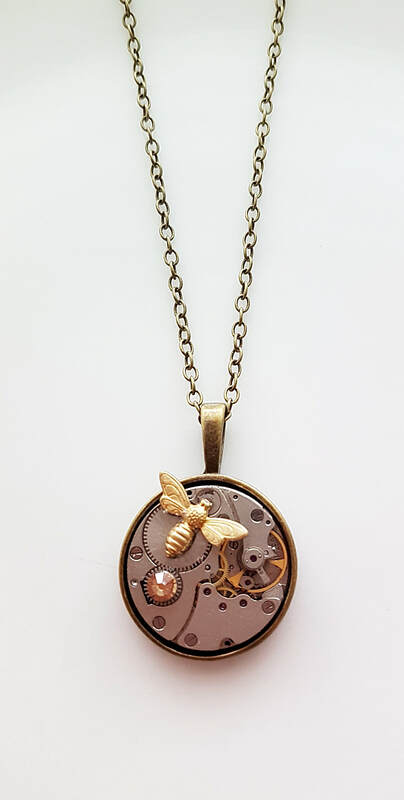 This small vintage ruby jewelled watch movement is nestled into a 33mm dark polished metal locket with a stunning brass honey bee. 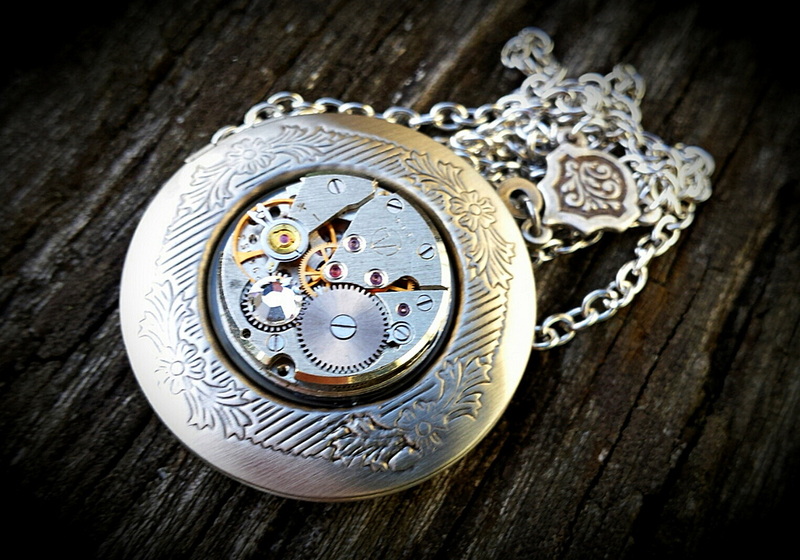 The side hinge allows it to be opened to store two round photos, a lock of hair or some other small memento. 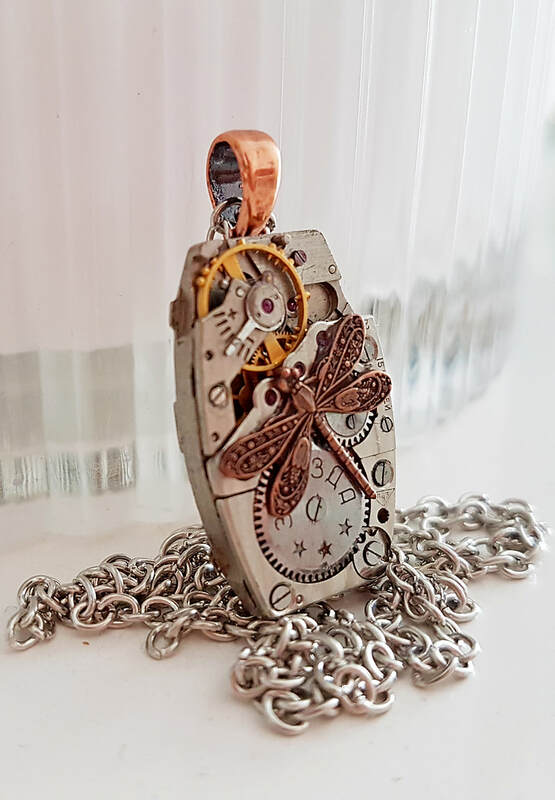 A funky unique memory keeper that hangs from a gorgeous 3 point connector and approx 70cm of matching cable chain. 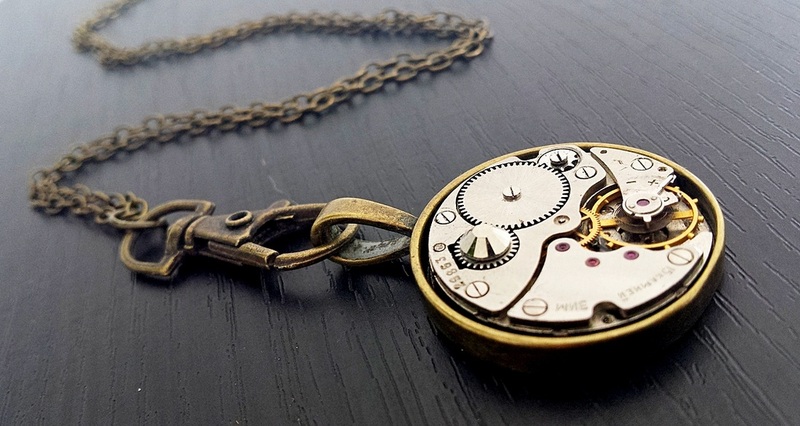 This beautiful 35mm Pocket Watch Movement was manufactured in the USA at around 1900. That makes this late Victorian stunner almost 120 years old. Although it doesn't "tick" anymore, its in fabulous condition for its age. 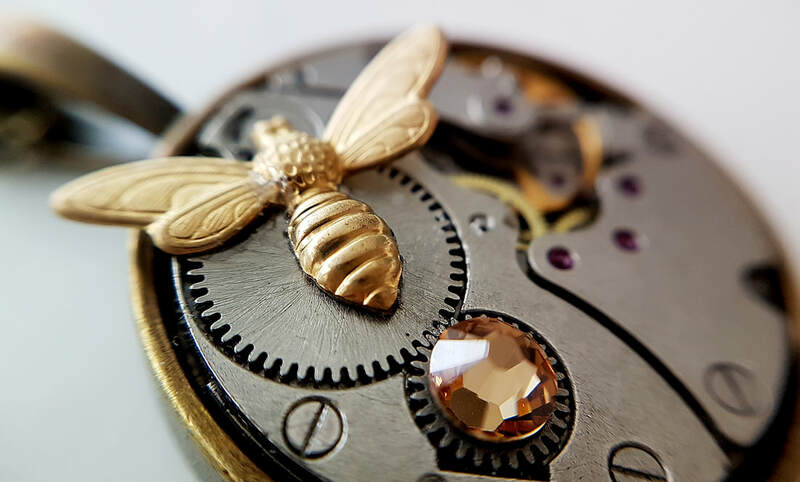 The intricate "Guilloche" (a french term dating back to the 1770's for machine or tool engraving) is just simply stunning and adds a lovely shimmer to the surface. I've glazed the back to protect the remaining delicate hand and beautiful enamel face. Strung on approx 80cm of dark silver tone cable chain from a sturdy top bail. I can adjust the chain length, leave instruction or contact me. 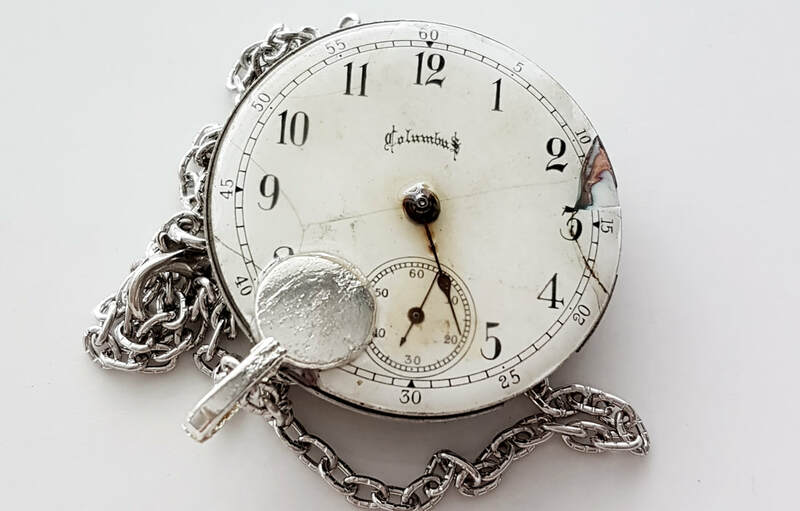 This very old Pocket watch movement produced around 1917 is fascinating in all its detailing and gorgeous intricate guilloch'e engraving. The "Geneva Waves" give a gorgeous shimmery ripple effect even though the face is smooth. It measures an impressive 4.5cm across and is strung from a sturdy top bail and about 80cm of chunky dark silver belcher chain. I have glazed the back to protect the original enamel face. 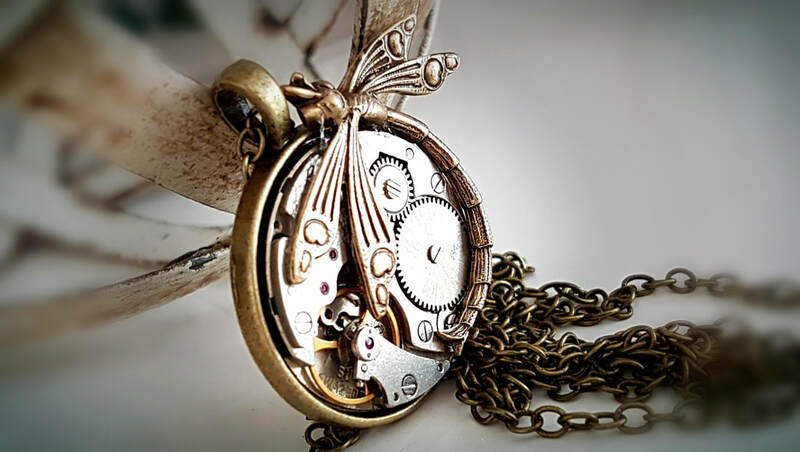 Movements of this type are hard to find and will eventually be dinosaurs lost to the digital age. Funky historic mechanical chic. 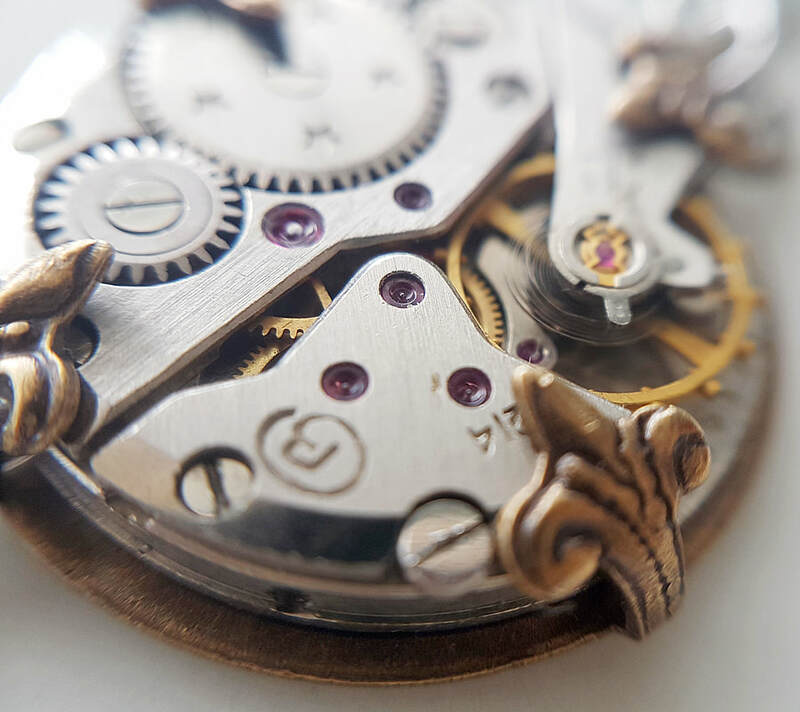 The intricate "Guilloche" (a french term dating back to the 1770's for machine or tool engraving) is just simply stunning and adds a lovely shimmer to the surface. I've glazed the back to protect the remaining delicate hands and original enamel face. 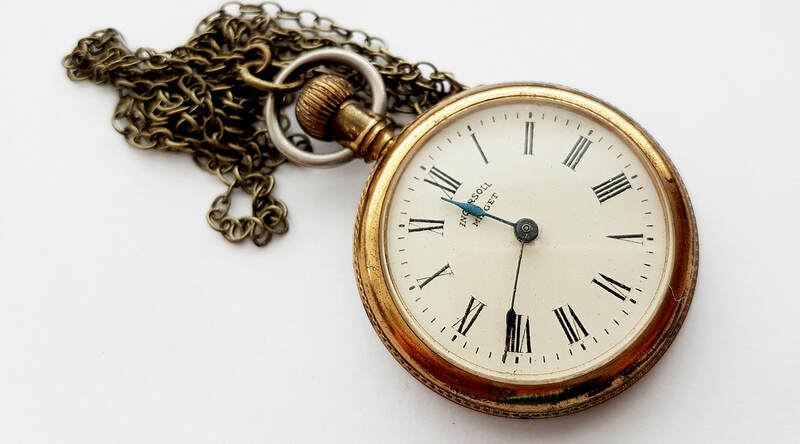 This pocket watch was manufactured somewhere between 1890 & 1930. The "Geneva Waves" give the face a funky rippled look even though the steel is smooth. Measuring approx 3.5 cm across with a glazed finish over the original enamel face. Strung from about 80cm of matching cable chain and a chunky textured top loop. Feel free to contact me with any questions. 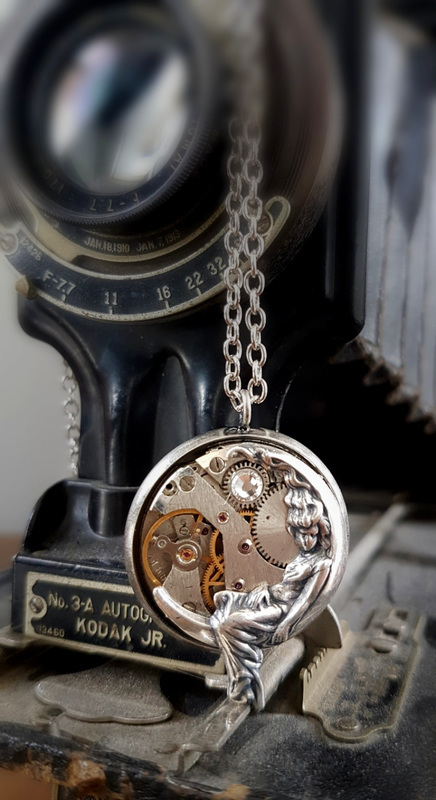 This detailed wee watch movement sits recessed into a 28mm silver tone bezel. So many cogs, gears and red rubies are now exposed. The two Indigo Blue Austrian crystals add to the unique industrial beauty. Strung from about 60cm of matching cable chain and a lovely scroll detailed connector. 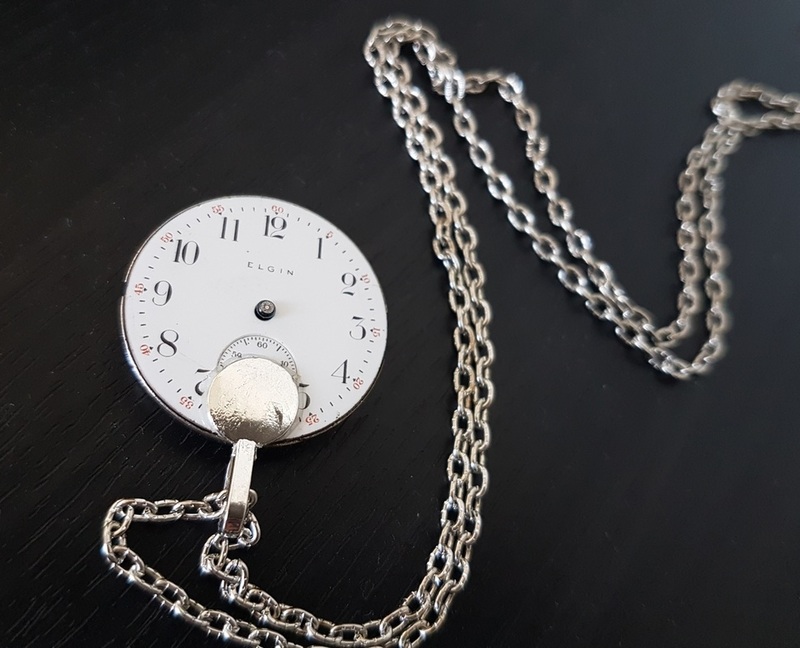 This amazing 44mm Vintage Giant Pocket Watch Movement was manufactured around the year 1914. I have not embellished this as the "Guilloche" (a french term dating back to the 1770's for machine or tool engraving) is just simply stunning on its own. It is quite difficult to photograph well. A sturdy top bail has been attached and is strung with 80cm of dark silver cable chain. I have glazed the back to protect the original enamel watch face. 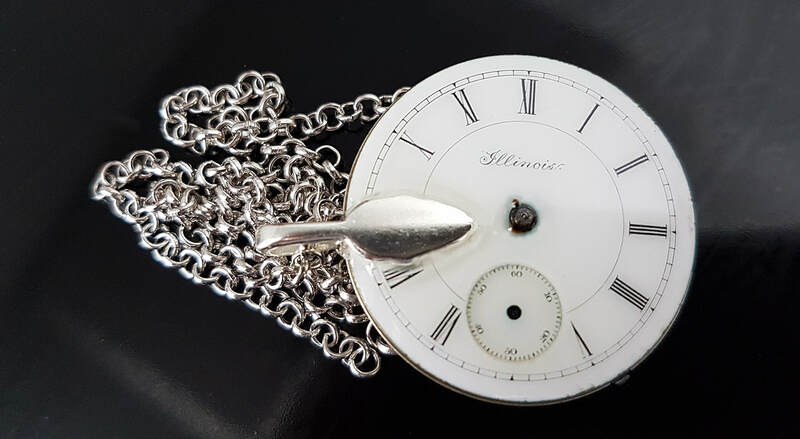 This is a fabulous 3cm Vintage Pocket Watch Movement was manufactured around the year 1900. I have not embellished this as the "Guilloche" (a french term dating back to the 1770's for machine or tool engraving) is just simply stunning on its own. It is quite difficult to photograph well. A sturdy top bail has been attached and is strung with 80cm of dark silver cable chain. I have glazed the back to protect the original enamel face and delicate hands. These timeless relics are only going to get harder and harder to find, lost to the digital age. Click on the images to zoom for more detail. 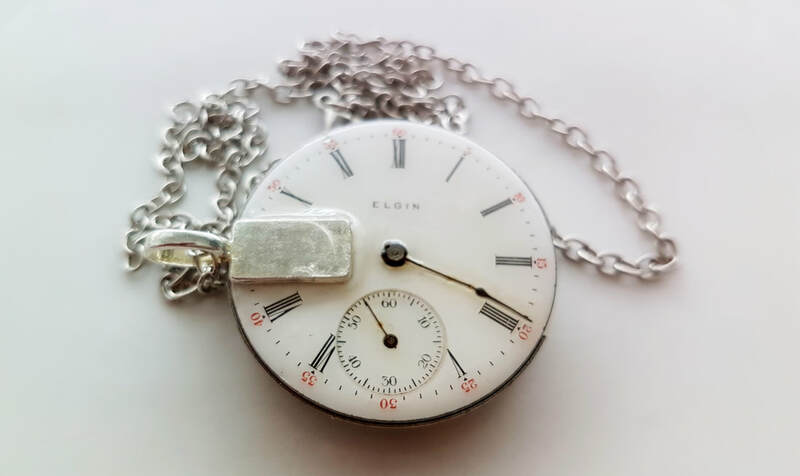 This wee Oris Swiss pocket watch obviously doesn't tell the time anymore, but that doesn't stop it becoming a gorgeous unique double sided pendant. 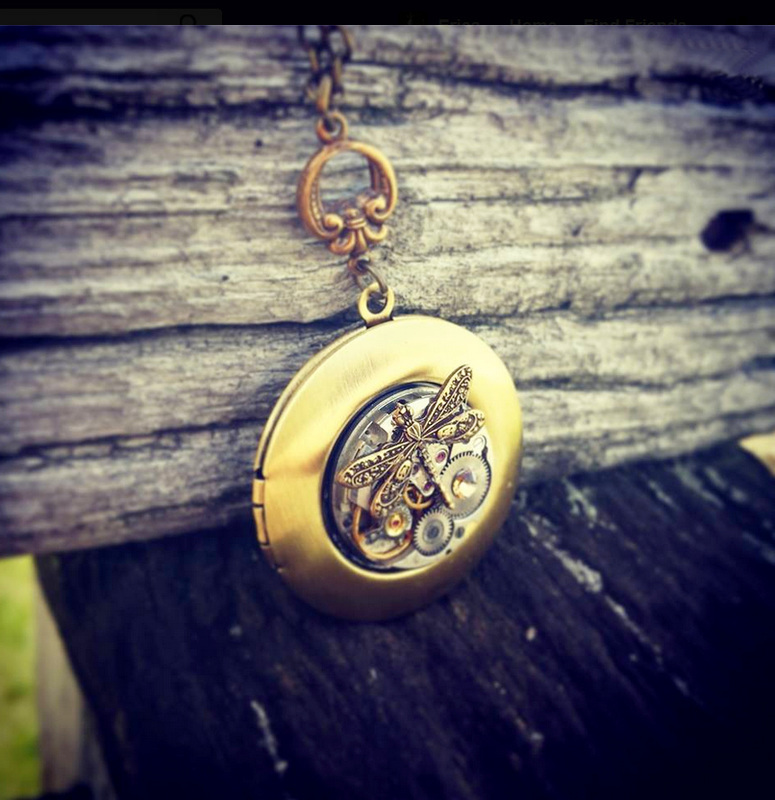 The beautifully detailed and textured case measures about 28mm across and about 40mm long including the top loop. Strung from approx. 80cm of antiqued cable chain to complete the vintage vibe. 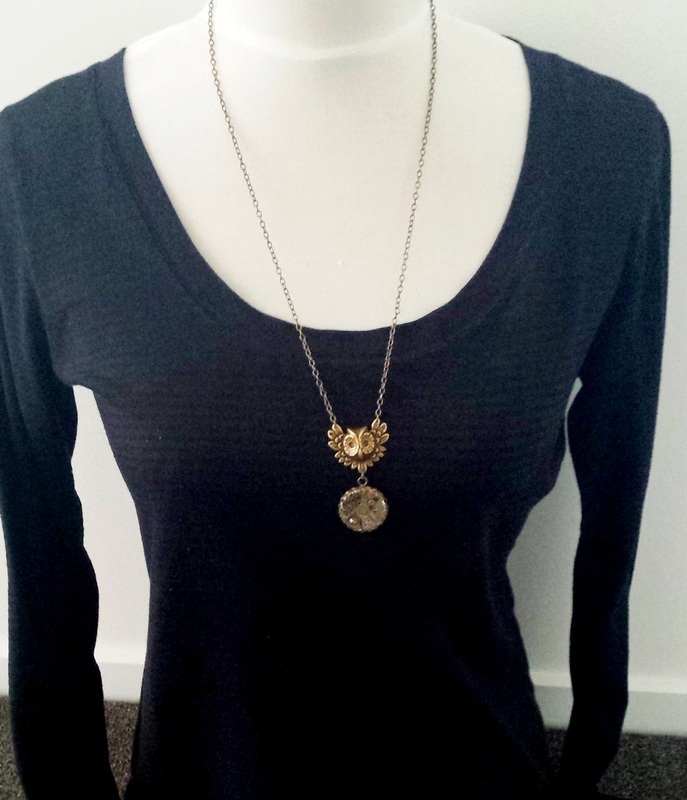 This can be worn with either side showing for two totally different looks. Contact me if you want the chain length altered or have questions. 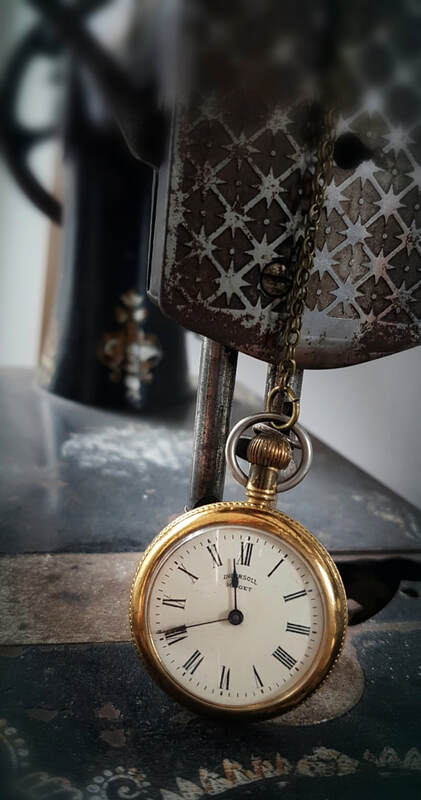 This handsome 40mm brass pocket watch was manufactured over 100 years ago. 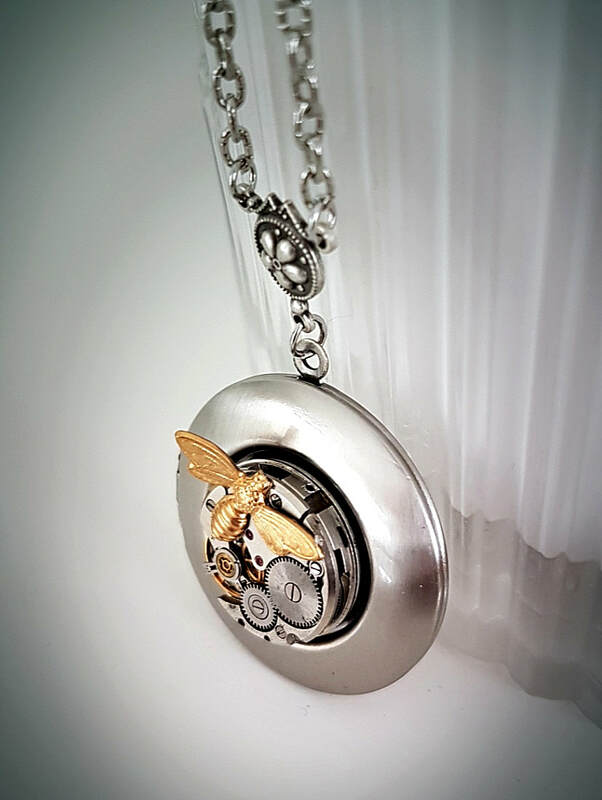 Now that it doesn't keep the time anymore, it is re-purposed as a stunning double sided pendant. The glass front is in tact but the back has been removed to show some of the original mechanical workings. 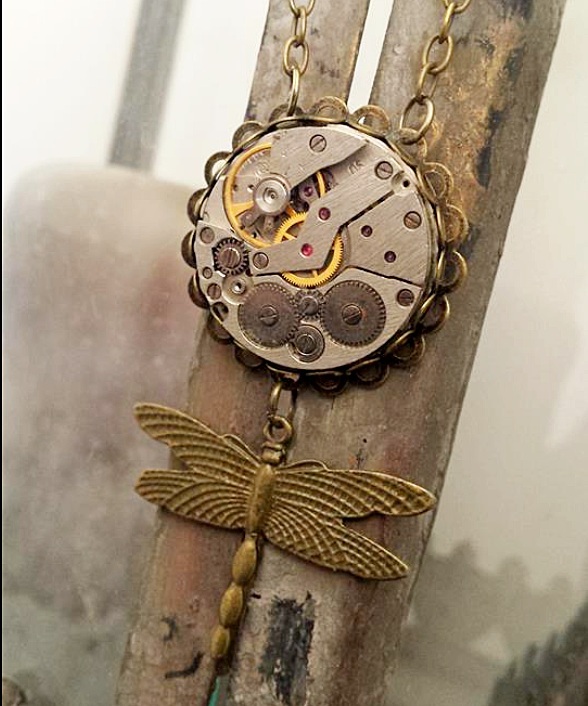 I've adorned the movement with a stunning detail brass dragonfly and strung this unique beauty from approx 80cm of antiqued brass cable chain. Contact me if you have questions. 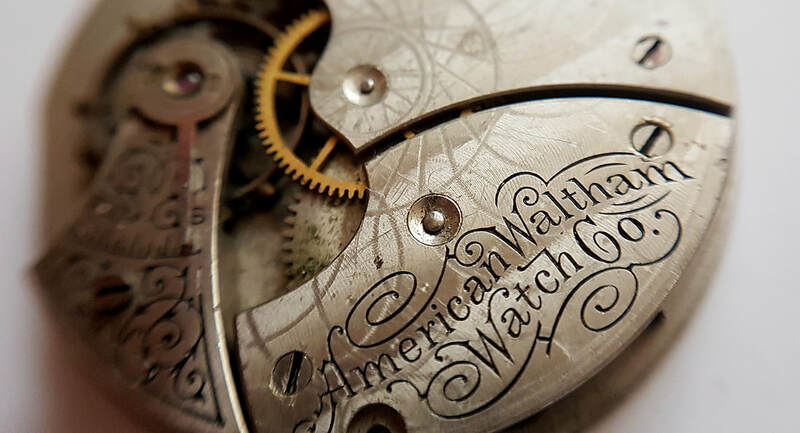 I have not embellished this as the intricate "Guilloche" (a french term dating back to the 1770's for machine or tool engraving) is just simply stunning on its own. I have glazed the back to protect the original enamel face and remaining hands. A sturdy top bail has been attached and strung with 80cm of cable chain. 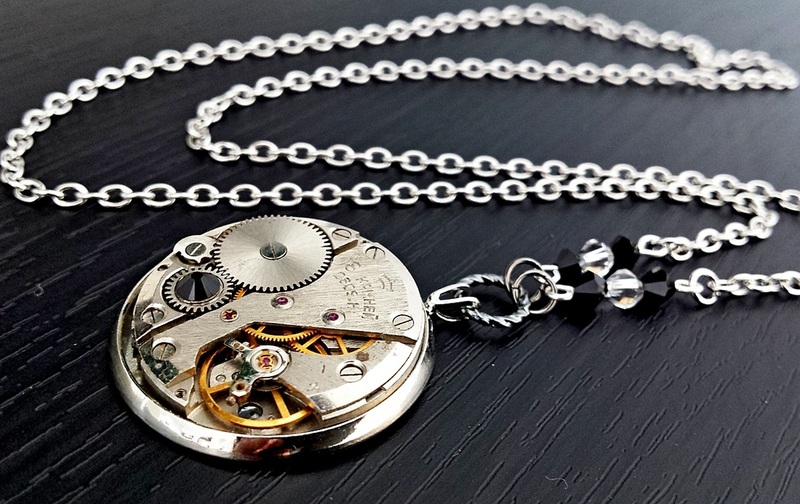 Beautiful mechanical movements like this are becoming dinosaurs to the digital age. 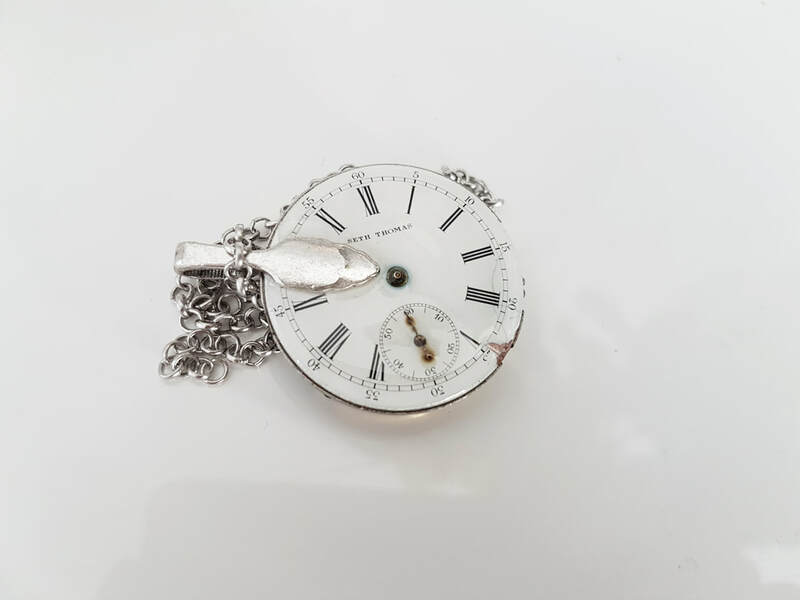 This is a beautiful 29mm Pocket Watch Movement dated at around 1911. I have not embellished this as the intricate "Guilloche" (a french term dating back to the 1770's for machine or tool engraving) is just simply stunning on its own. A sturdy top bail has been attached and strung with 60cm of matching silver tone cable chain. I've glazed the back to protect the delicate hands, the original enamel face and to avoid snags to clothing. 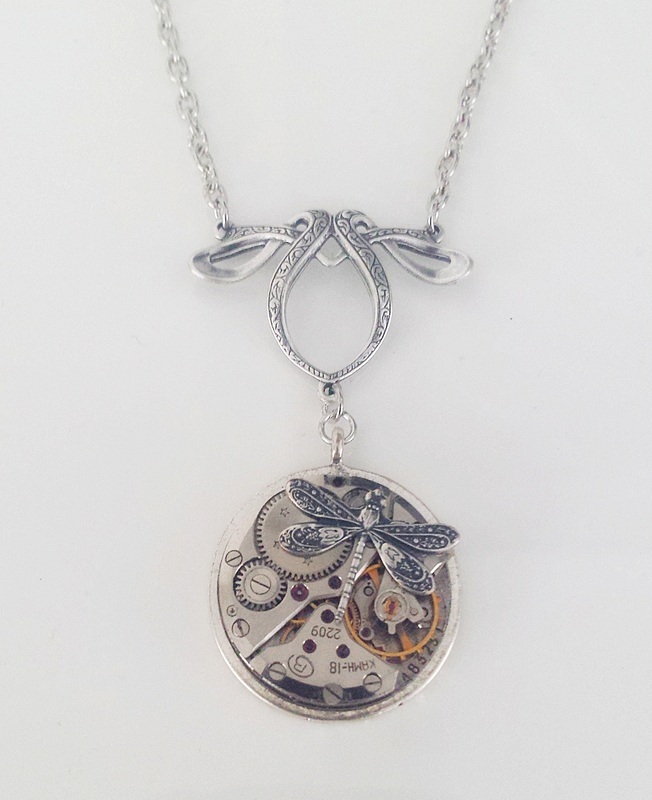 I can adjust the chain length, just leave instruction at checkout, or contact me. 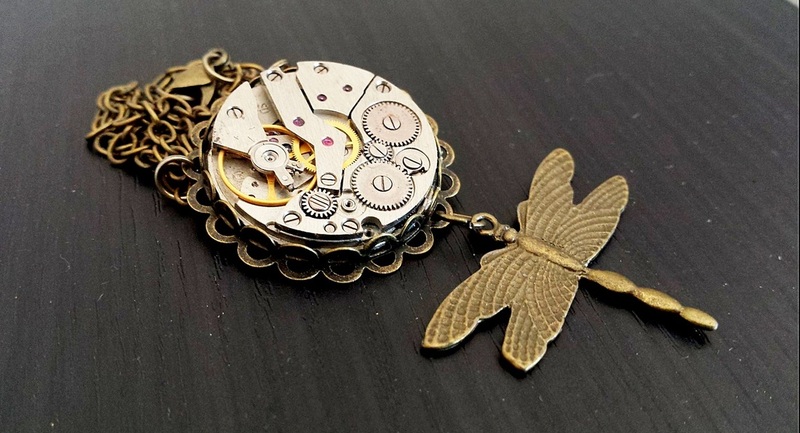 This funky old 35mm pocket watch has been adorned with a large antiqued brass Butterfly. 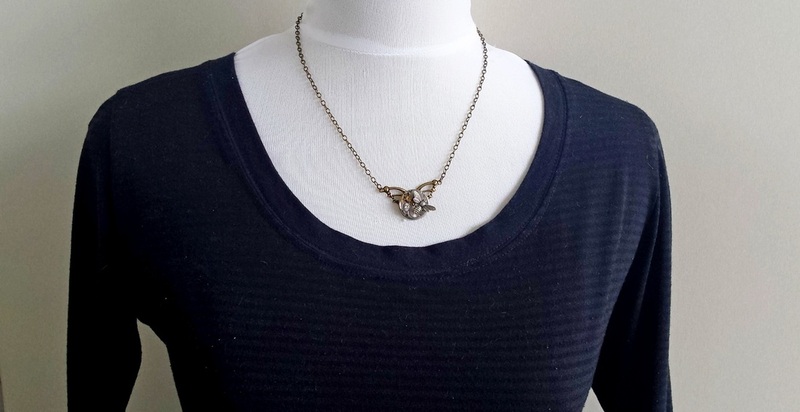 Four gorgeous sparkly gold coloured Swarovski Crystals add to the detail of the wings. 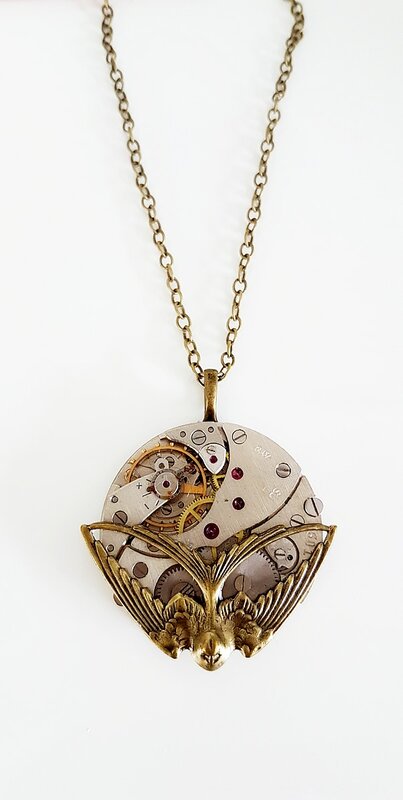 A pendant of unique beauty and intrigue. Strung from about 80cm of matching antiqued brass cable chain. The length can be altered on request if you leave a message at checkout or contact me. 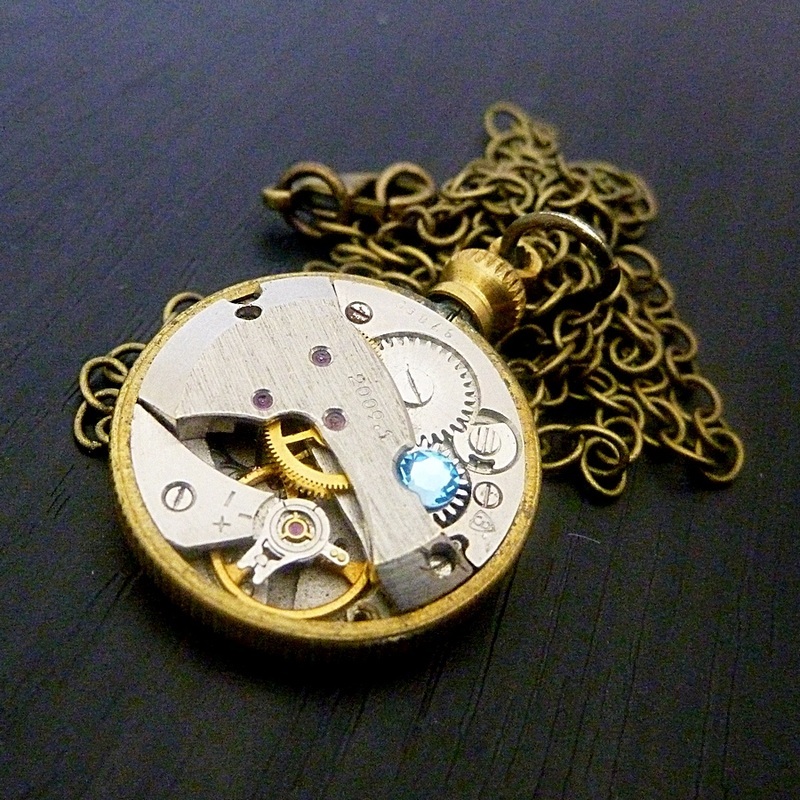 This is a lovely 28mm "Molly Stark" Gilt Pocket Watch Movement manufactured around 1903. In honour of Molly whom was married to one of George Washington's Generals & opened her home as a hospital to nurse wounded soldiers. 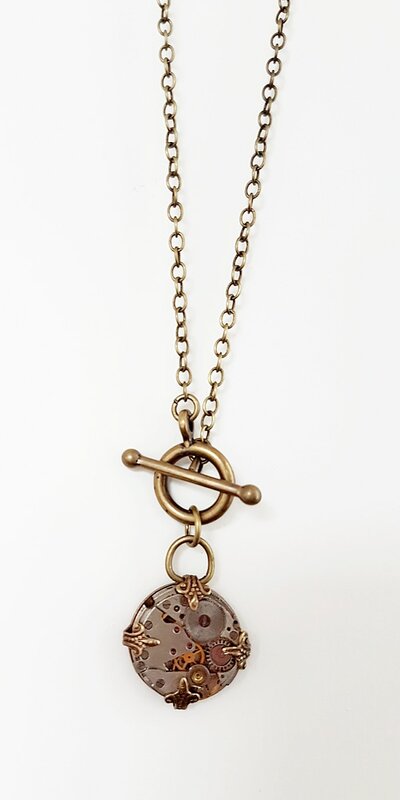 A sturdy top bail has been attached and strung with 60cm of antiqued brass cable chain. I've glazed the back to protect the original enamel face & remaining delicate hand. 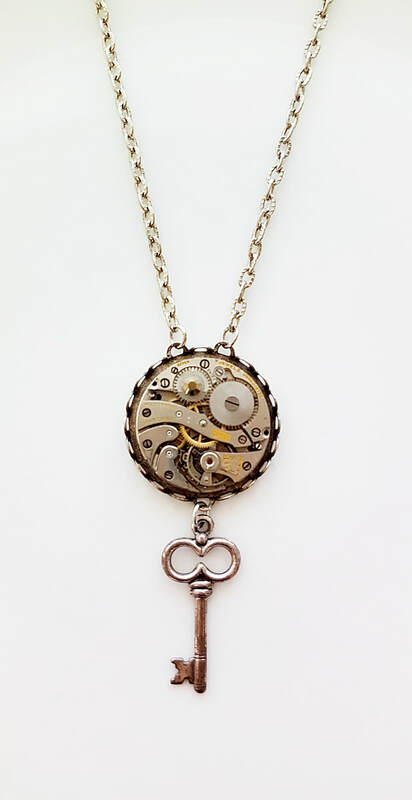 I can adjust the chain length, just leave instruction at checkout, or contact me. 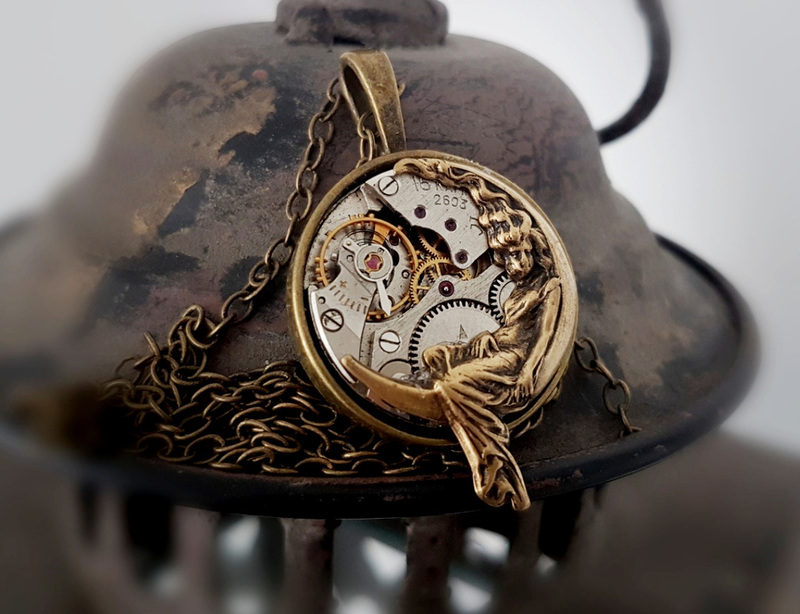 This lovely old pocket watch movement was named in honour of John Stark, A prominent American General hailed as a hero during the American Revolution. He was married to "Molly" who was also honoured by the Hampden Watch Company (see smaller watch above). 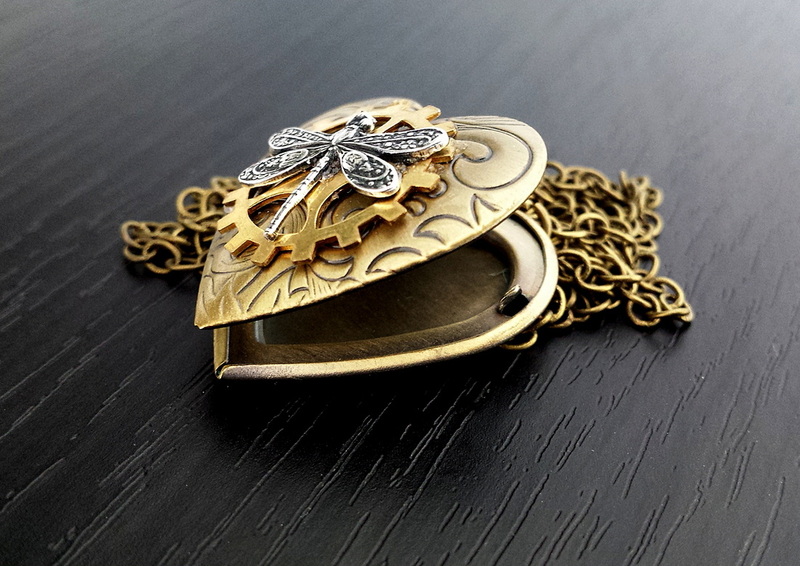 This movement is about 4cm wide and has an intricate tooled design with gold detailing. I have attached a sturdy bail and approx 80cm of dark silver belcher chain. 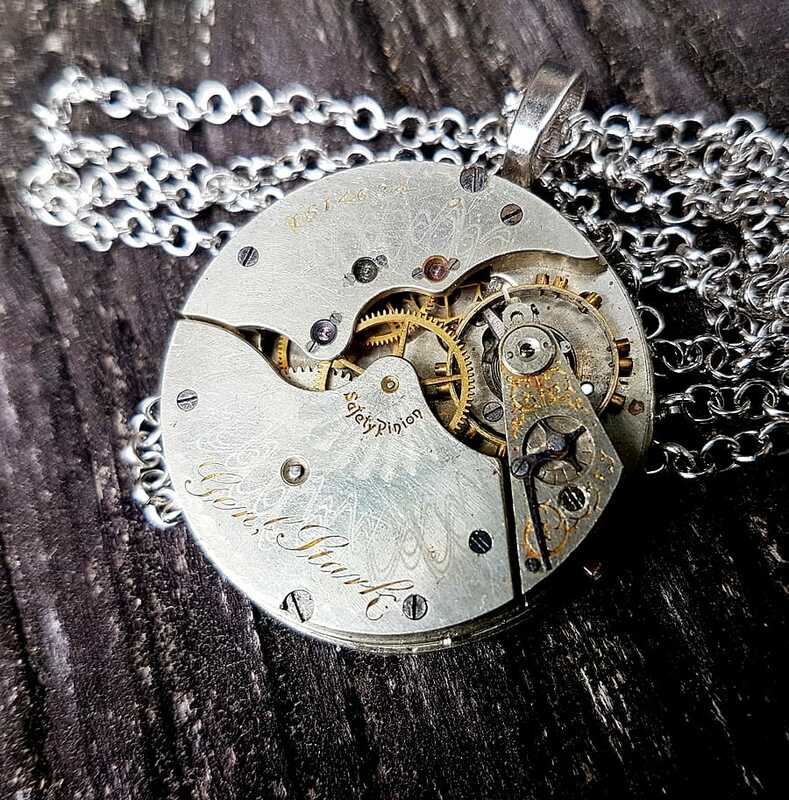 This is a beautiful 35mm Pocket Watch Movement manufactured around 1902. (click on pics to enlarge) A true beauty from another Century. I have not embellished this as the intricate Guilloche tooled patterns are just simply stunning on its own. The "Geneva Waves" also give the illusion of shimmery ripples. A sturdy top bail has been attached and strung with 60cm of dark silver cable chain. 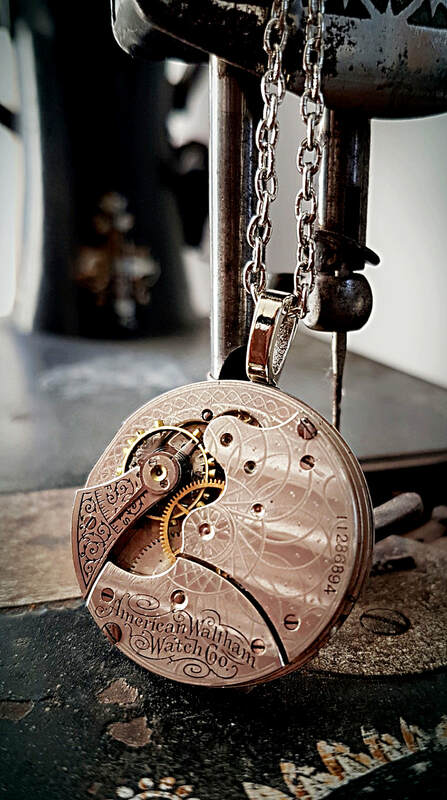 This is a lovely 28mm "Molly Stark" Guilloche Tooled Pocket Watch Movement crafted around 1911. In honour of Molly whom was married to one of George Washington's Generals & opened her home as a hospital to nurse wounded soldiers. I've glazed the back to protect the original enamel face and remaining hands. Strung from a sturdy top bale and approx 60cm of matching cable chain. Contact me or leave instruction at checkout if you would like the chain length altered at no extra cost. 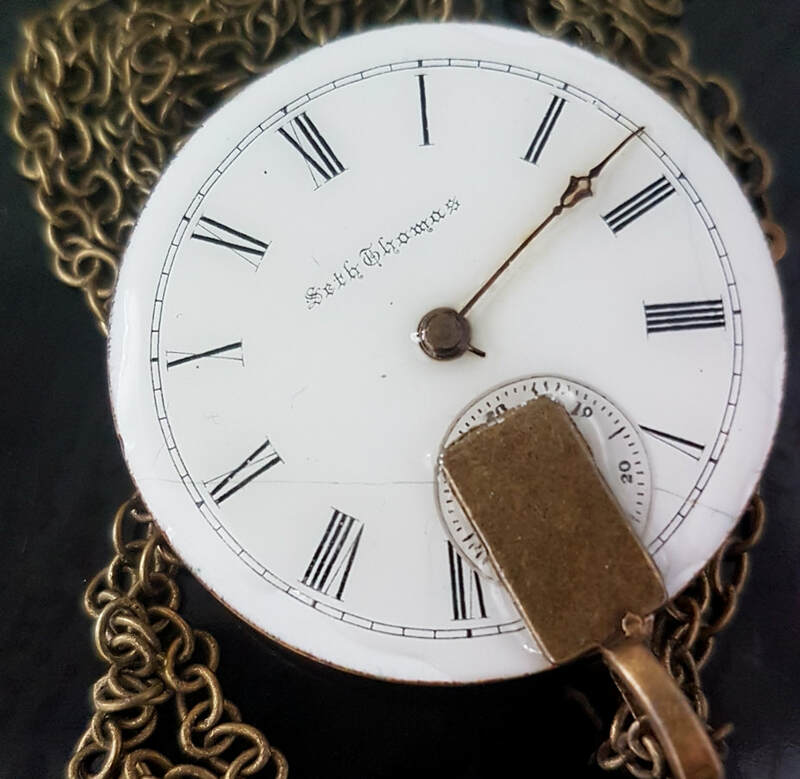 This Gilt Pocket watch movement is in amazing condition considering its about 130 years old. 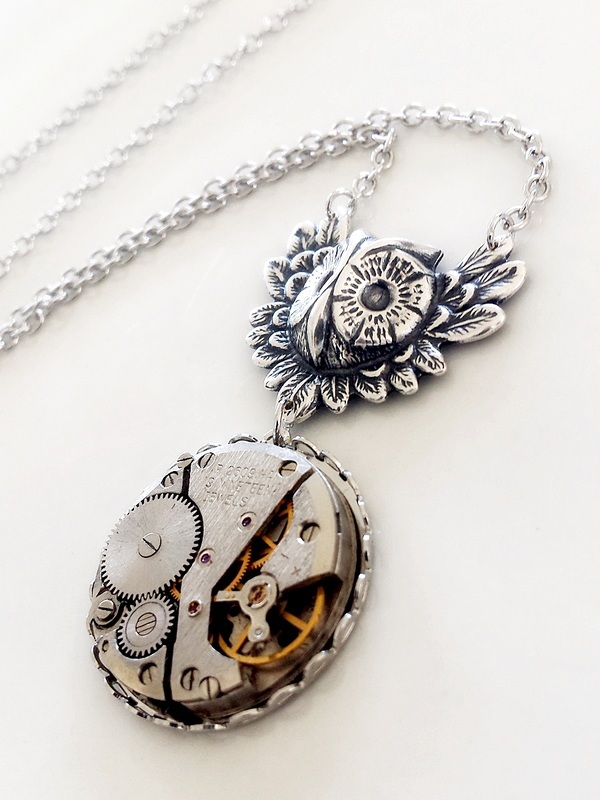 The intricate cogs, gears and engraving is fabulous. 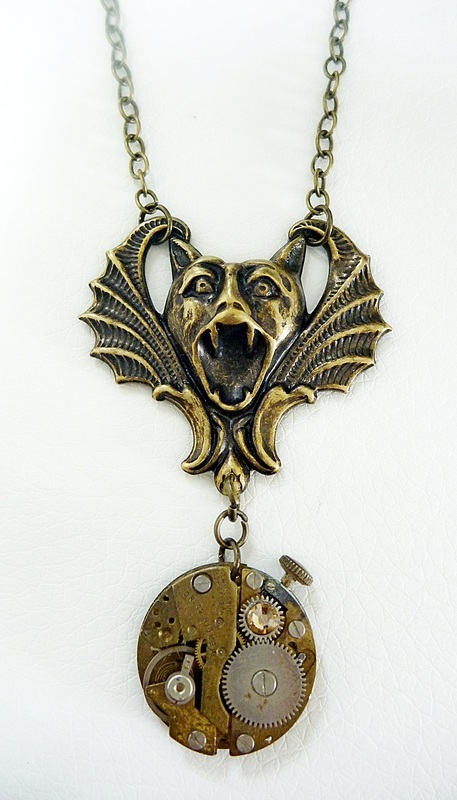 It is about 3 cm across and strung from an Antiqued brass bail and 60cm of matching cable chain. I have glazed the back to protect the original enamel face & remaining delicate hand. Leave instruction at checkout if you would like the chain at a different length. Contact me with any questions. 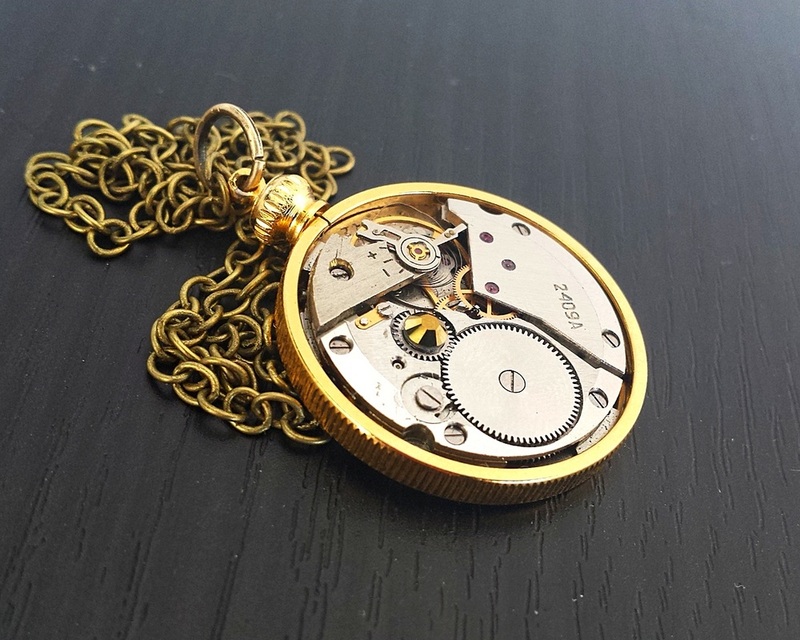 This beautiful 35mm Pocket Watch Movement is over 125 years old. 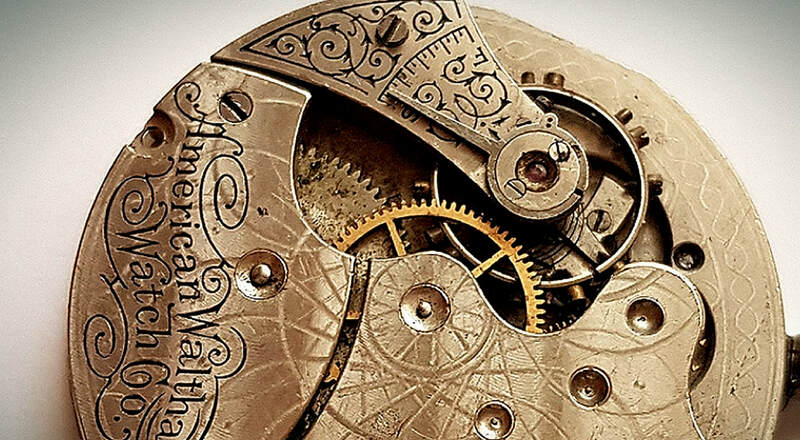 I have not embellished this as the intricate "Guilloche" (a french term dating back to the 1770's for machine or tool engraving) is just simply stunning on its own. A sturdy top bail has been attached and strung with 80cm of dark silver tone belcher chain. I've glazed the back to protect the original enamel face and to avoid snags to clothing. 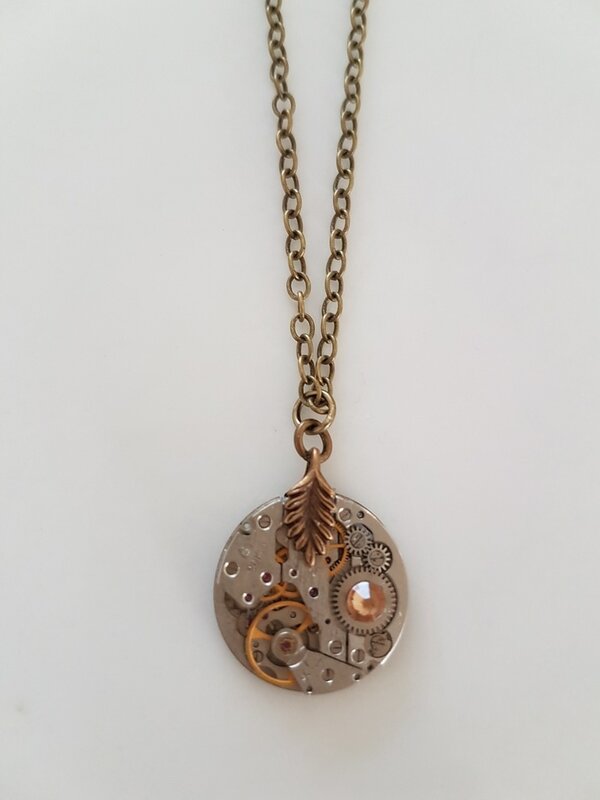 I can adjust the chain length, just leave instruction at checkout, or contact me. 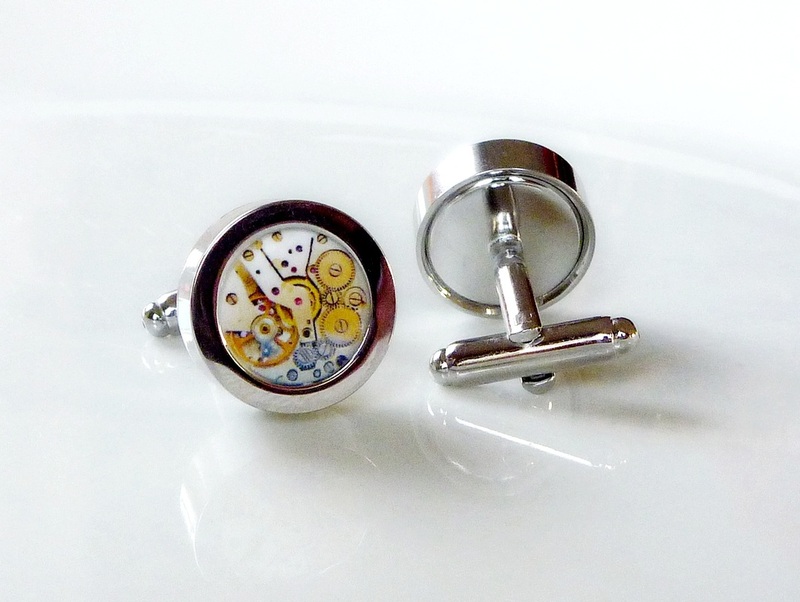 These are very sturdy chunky size silver tone cufflinks with funky detailed images. Choose Cogs or 'Tash. 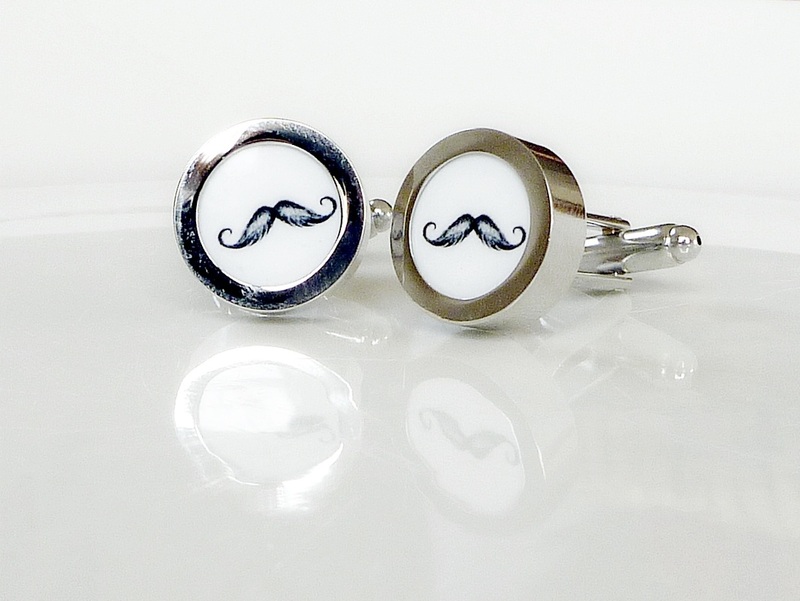 Classic in silver for that crisp business shirt or to just add fun to a casual shirt. Contact me if you would like something custom made. These unique rings need to be treated as "Cocktail" Rings. They will not endure the knocks, bangs and snags of an everyday ring. Please make your choice at checkout. Reduced in price, one off designs. 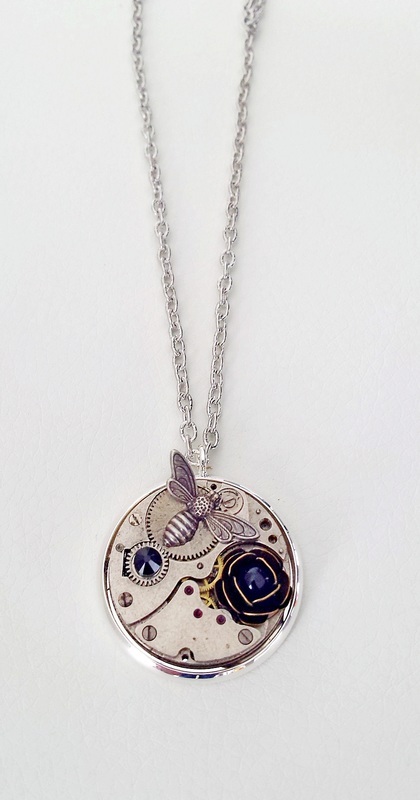 Top Left - Cured black dome holding an antiqued bee and 3 clear Swarovski crystals. 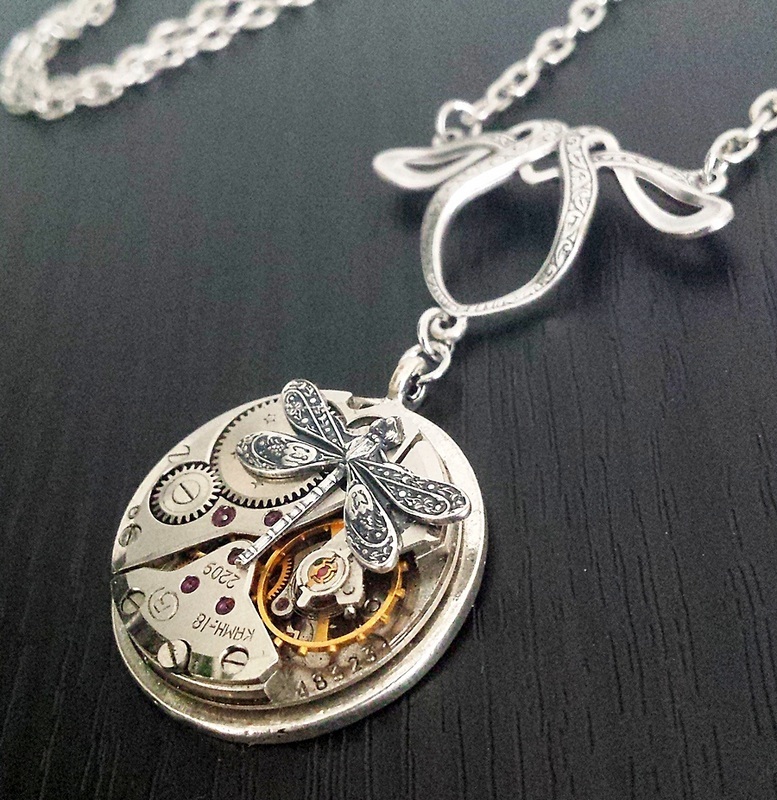 Top Right Round watch movement with a clear Swarovski crystal. 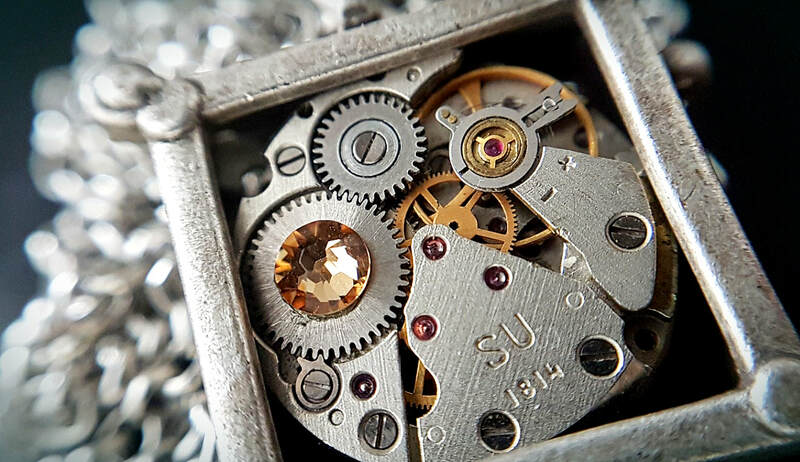 Bottom Left - Rectangular watch movement with a blue & clear Swarovski Crystal. 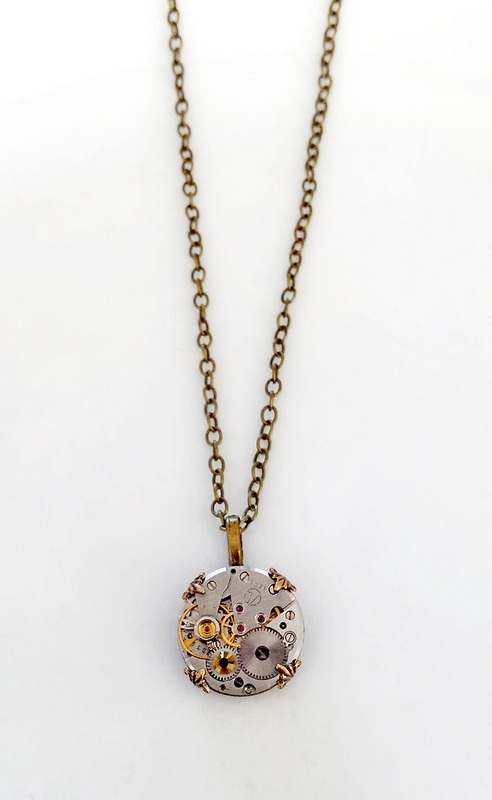 Bottom Right - Rectangular watch movement with a red and small metallic gold Swarovski crystal. 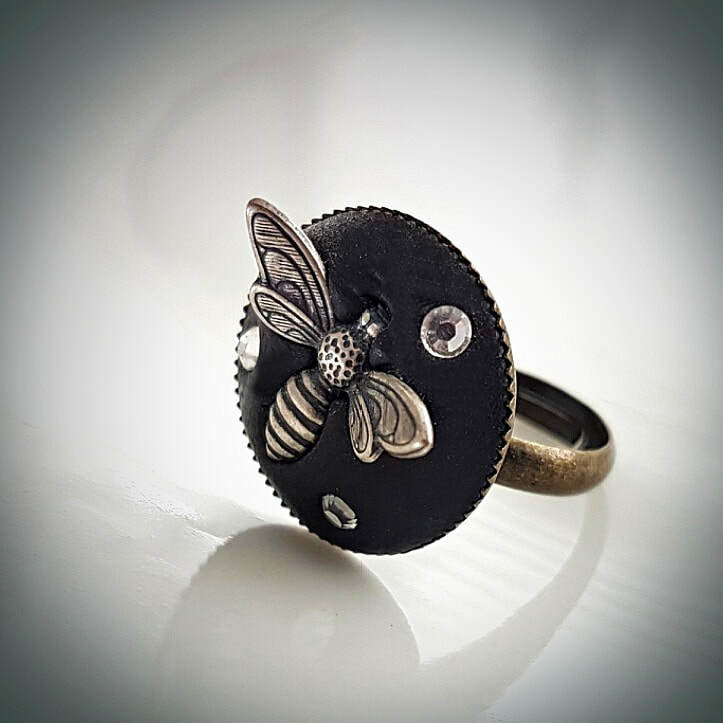 These funky filigree rings are pops of fun. 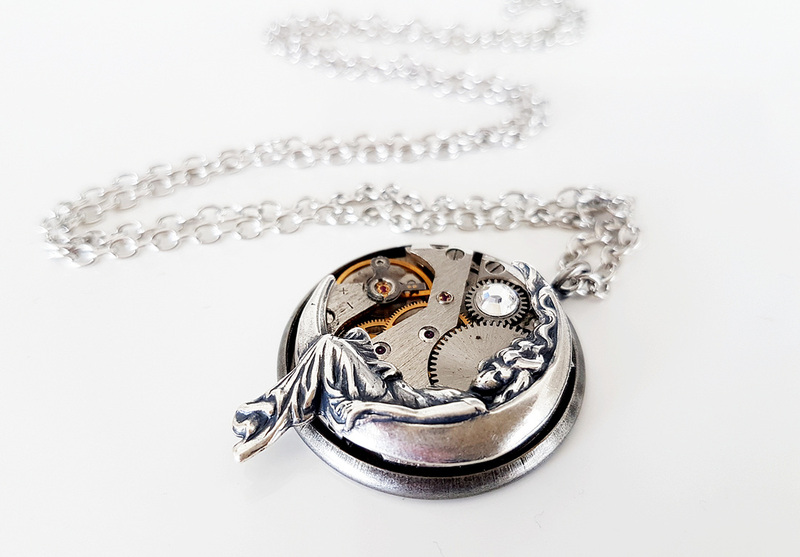 The image and crystal clear glass dome are set into a gorgeous 20mm lace edged bezel. The filigree band is nice and flexible for easy adjustment to fit most fingers. Choose your design at check out. 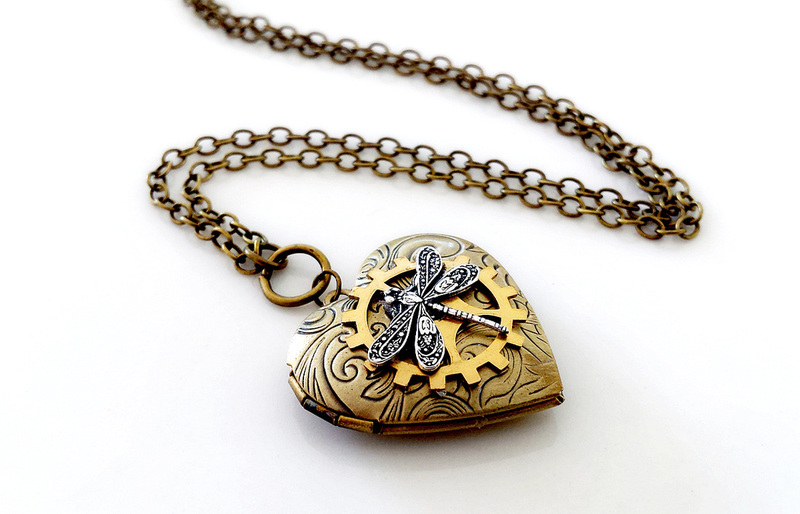 This lovely Polished Solid Brass Locket is about 3cm wide and opens to store photos or some other small memento. I have formed and cured a clay black dome which holds tight a gorgeous textured Octopus with a tiny gold Swarovski crystal on his forehead. Strung from a funky chunky connector and about 60cm of lead & nickle free antiqued brass chain. Contact me or leave instruction if you want the chain length or anything altered. 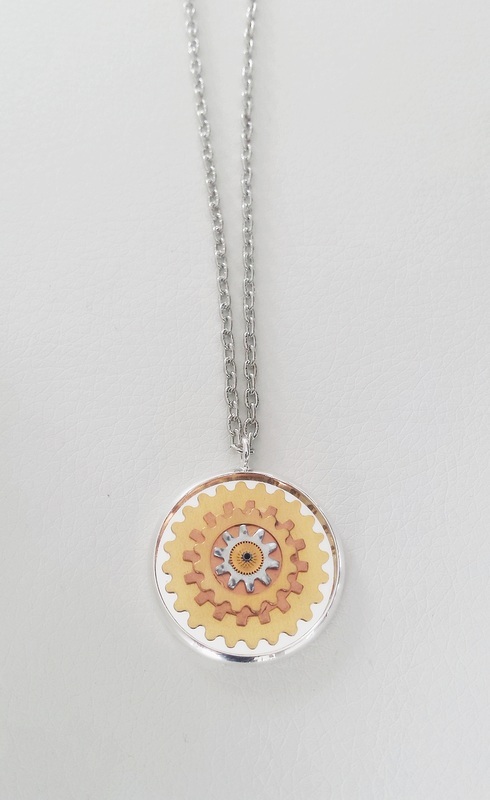 Stacked inside this 30mm silver bezel is a quirky combination of copper, brass and steel cog stampings. 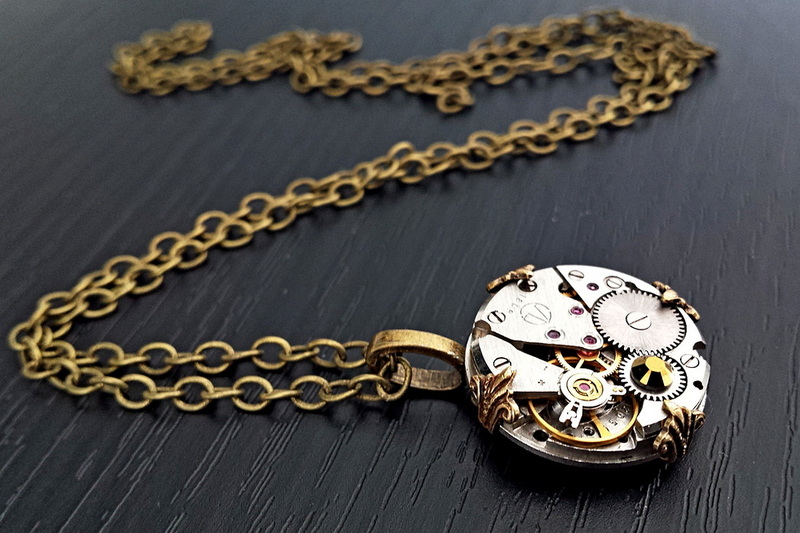 A genuine brass cog from a vintage mechanical watch sits in the centre. Strung from about 60cm of textured cable chain. 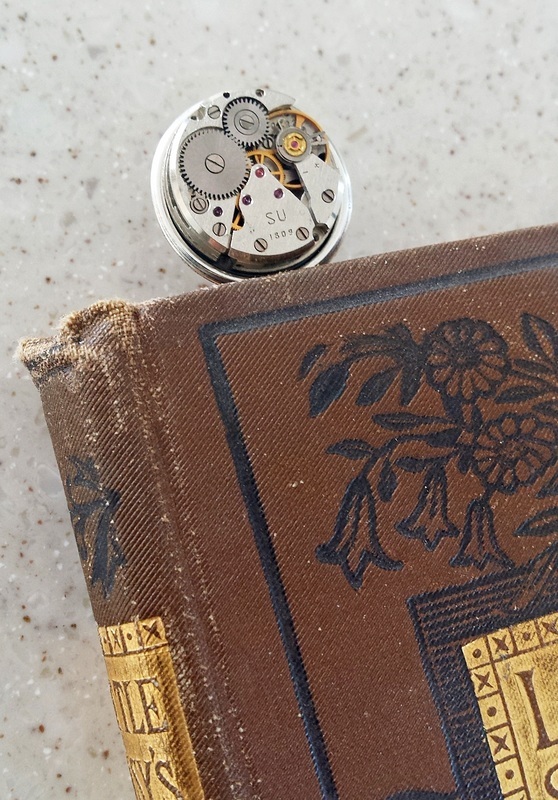 This small 2cm long book style antiqued silver locket is side hinged and can hold two tiny photos, a lock of hair or some other tiny memento. 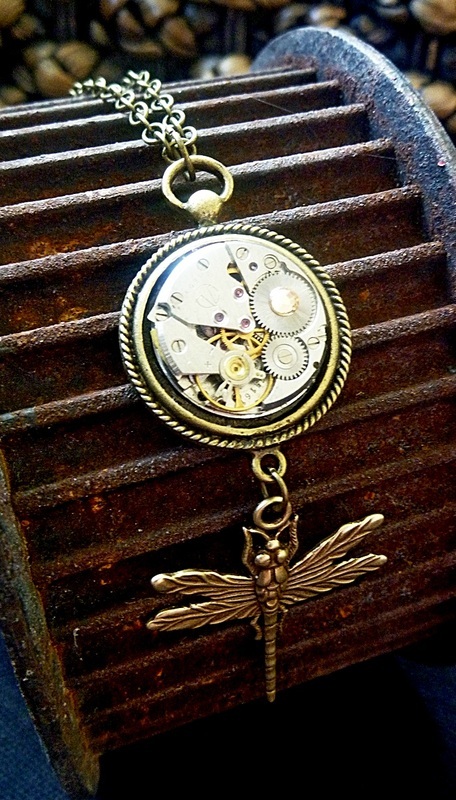 Attached to the front is a solid brass replica cog and a beautifully detailed antiqued Dragonfly. Strung from a 3 point connector and approx 80cm of smooth cable chain. I can shorten this on request, just leave instruction at checkout or contact me. 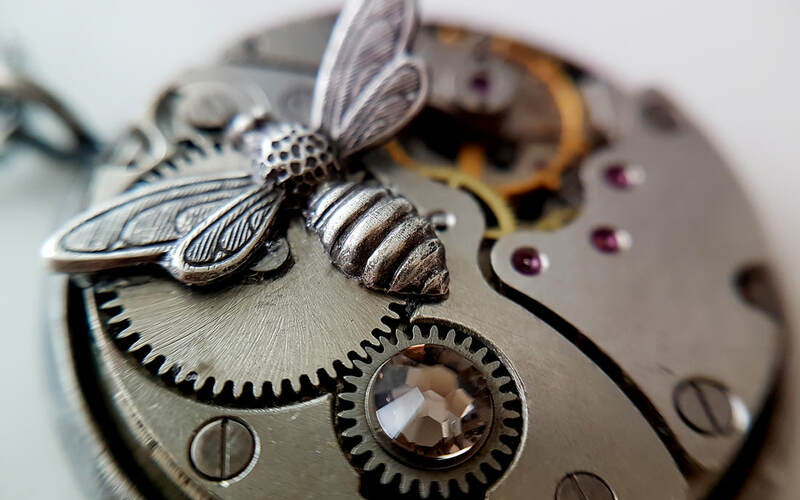 This vintage mechanical watch movement has been embellished with a gorgeous detailed antiqued bee and a sparkly grey beige Swarovski crystal. All of this is recessed into a 3cm antiqued dark silver tone bezel. Strung on about 80cm of matching cable chain. I can adjust this length on request. Just leave a message at check out or contact me. 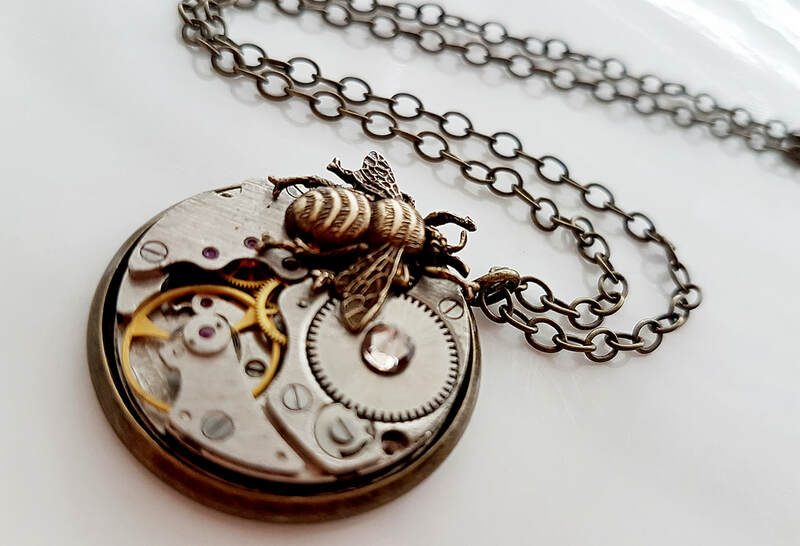 The Wee Bee - S.P. 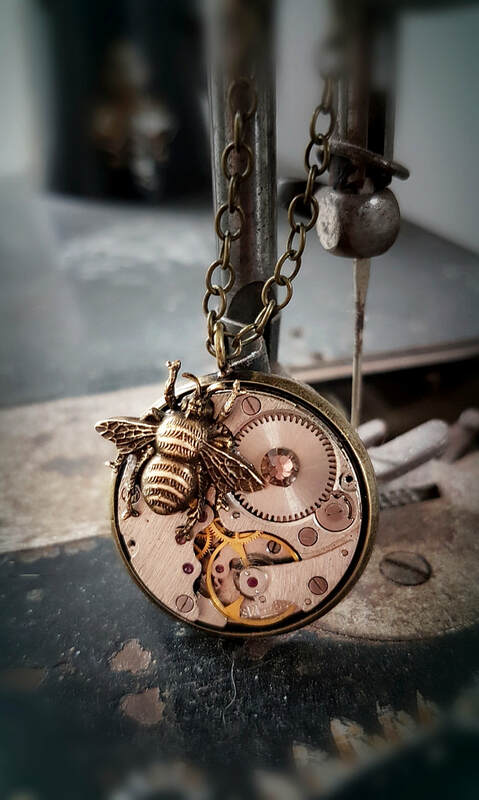 This vintage mechanical watch movement has been embellished with a gorgeous detailed raw brass bee and a sparkly golden Swarovski crystal. All of this is recessed into a 3cm antiqued brass bezel. Strung on about 80cm of matching lead free cable chain. 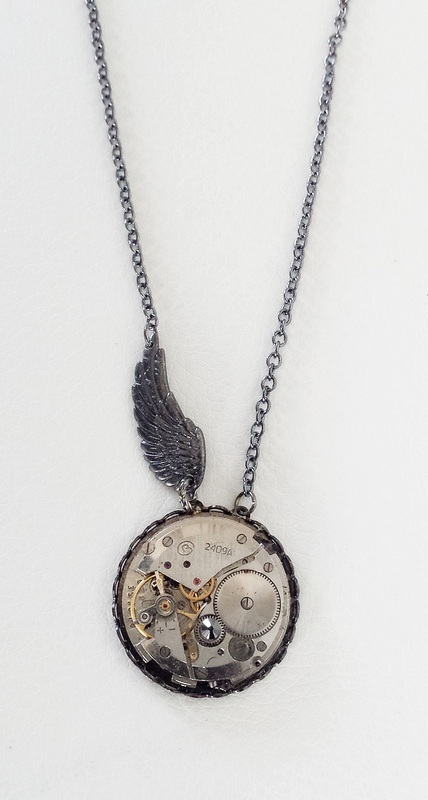 This gorgeous oblong watch movement has amazing detail with cogs, gears and red industrial ruby jewels. 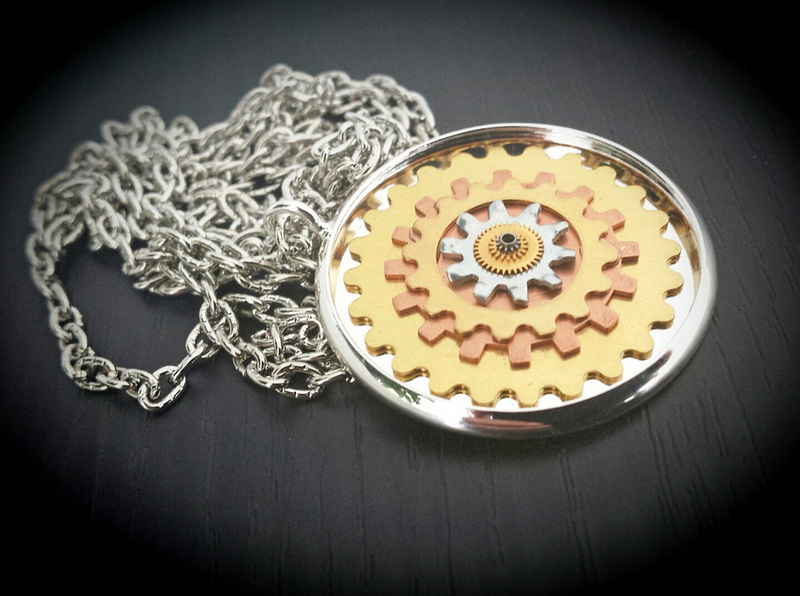 I have added an extra cog and a stunning wee clear Swarovski crystal. The "Geneva Waves" give the face a shimmery ripple effect, even though completely smooth. Comes strung on about 60cm of antiqued brass cable chain. I can alter this length. Contact me or leave instruction at checkout. 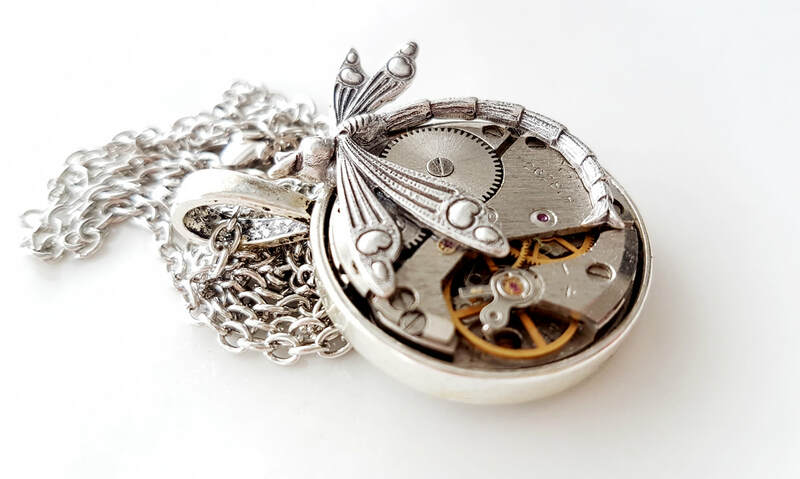 This gorgeous oblong watch movement has amazing detail with cogs, gears and red industrial ruby jewels. 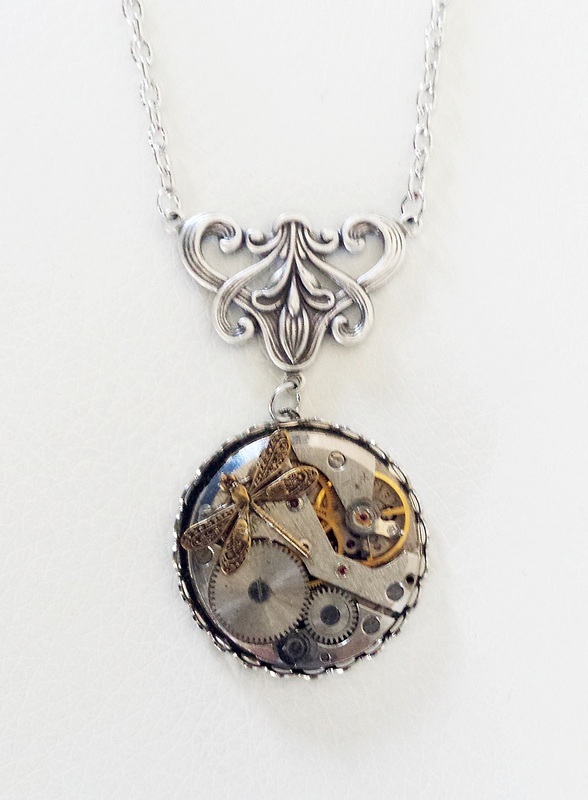 I have added 2 extra cogs and a clera crystal. The "Geneva Waves" give the face a shimmery ripple effect, even though completely smooth. Comes strung from a top bale and about 60cm of cable chain. I can alter this length. Contact me or leave instruction at checkout. 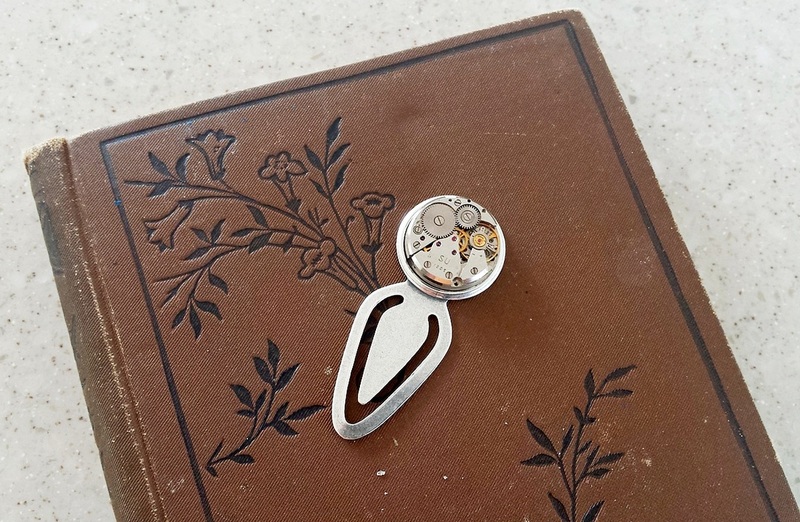 This funky wee watch movement is about 2cms across and set in a gorgeous 4 claw setting with a wee Austrian crystal and 3 point connector. 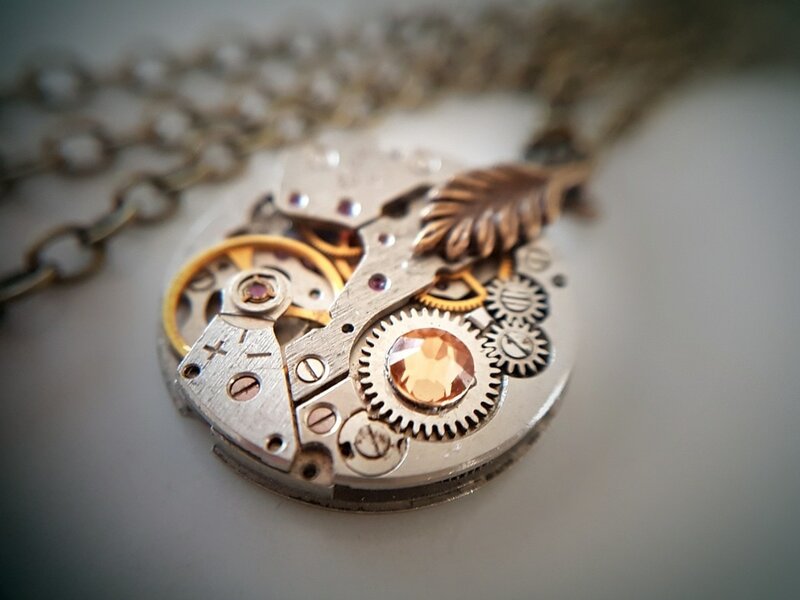 The fascinating cogs, gears and tiny red ruby jewel pivot points are now exposed and the hero of this piece. I have strung it on 70cm of cable chain, but I can adjust this to any length. Just leave me a message as you check out, or contact me. This funky wee watch movement is about 18mm wide and set in a gorgeous 4 claw setting with a stunning dark metallic gold Austrian crystal. 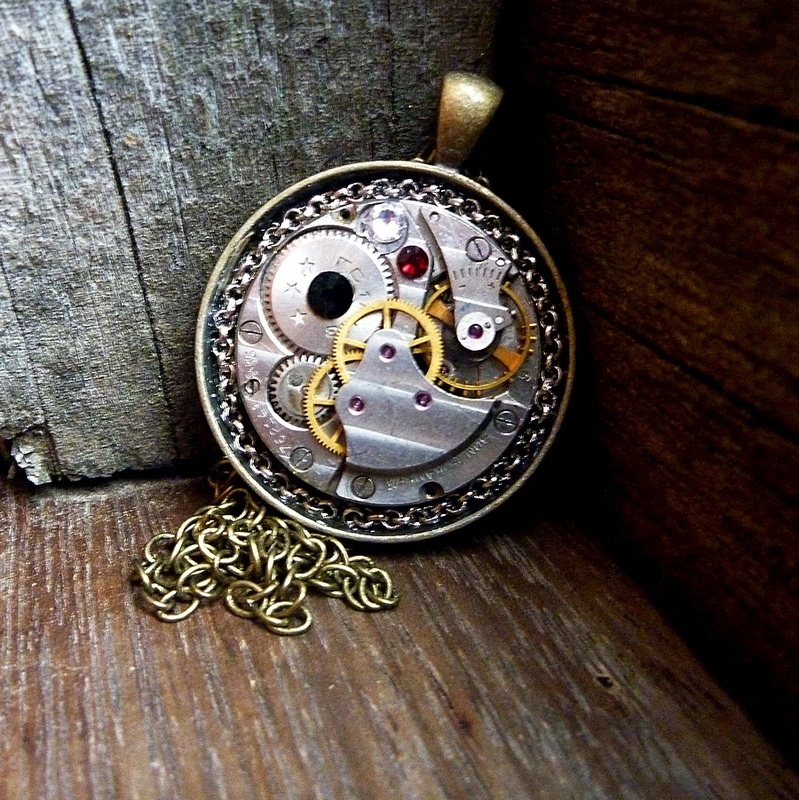 The fascinating cogs, gears and tiny red ruby jewel pivot points are now exposed. I have strung it on 48cm of matching antiqued brass cable chain to sit above most scoop necked tops, but I can adjust this to any length you require. Just leave me a message as you check out, or contact me. 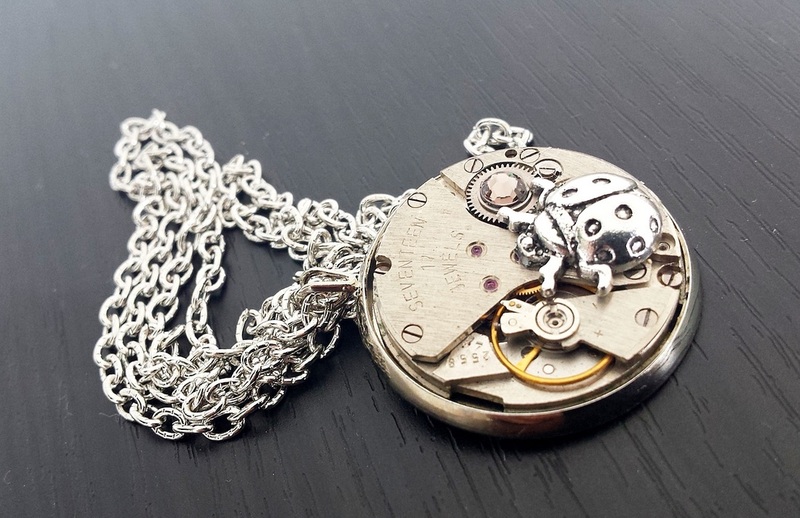 This funky wee watch movement is about 20mm wide and set in a gorgeous 4 claw setting with a front toggle clasp. 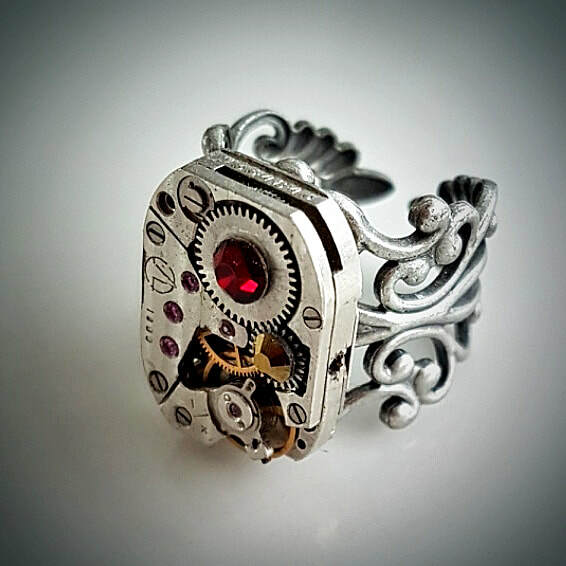 The fascinating cogs, gears and tiny red ruby jewel pivot points are now exposed. 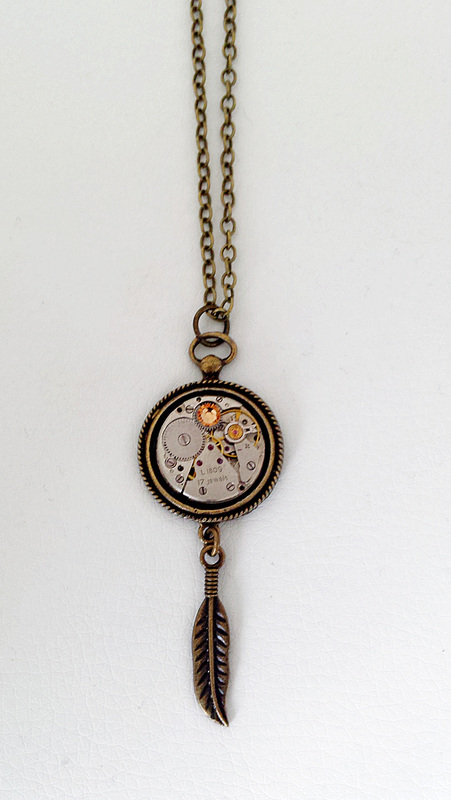 I have strung it on 60cm of matching antiqued brass cable chain, but I can adjust this to any length you require. Just leave me a message as you check out, or contact me. 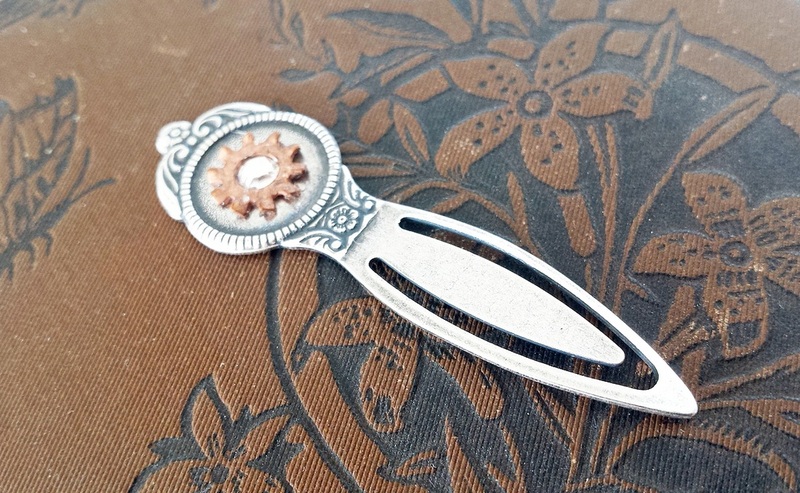 Gorgeous Antiqued Sterling Silver plated Bookmark. 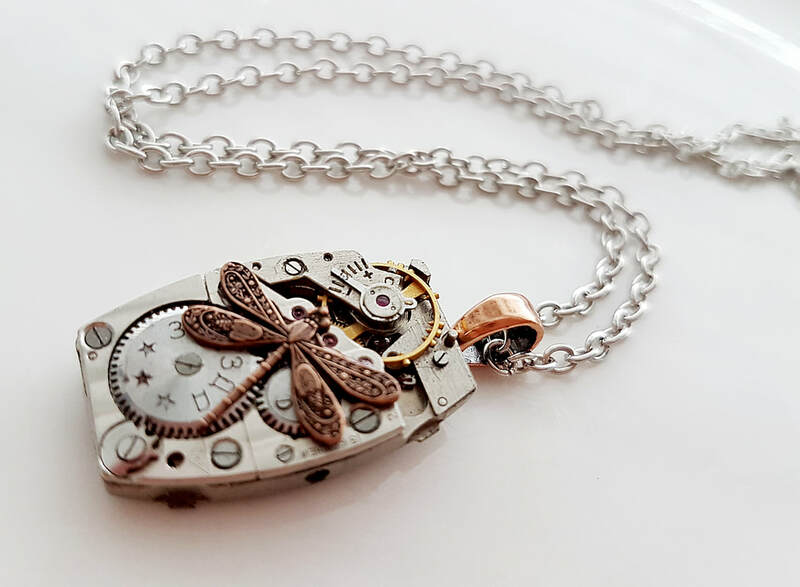 Approx 5.5cm long with a copper cog and clear Swarovski crystal adding to its Steampunk inspired beauty. A gorgeous gift for your favourite vintage book collector. 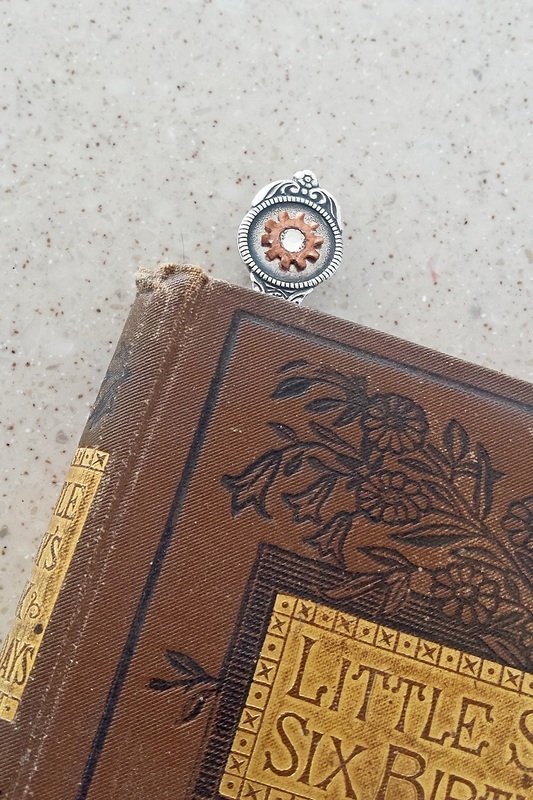 Gorgeous Antiqued Sterling Silver plated Bookmark. 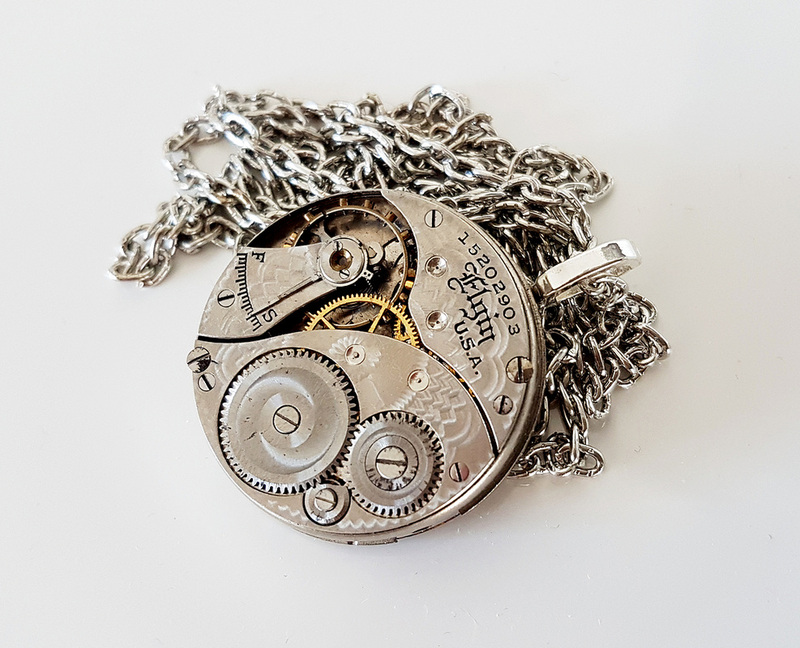 Approx 5.3cm long with a 16mm vintage watch movement with its cogs, gears and ruby jewels exposed.. A gorgeous gift for an avid reader your favourite vintage book collector. 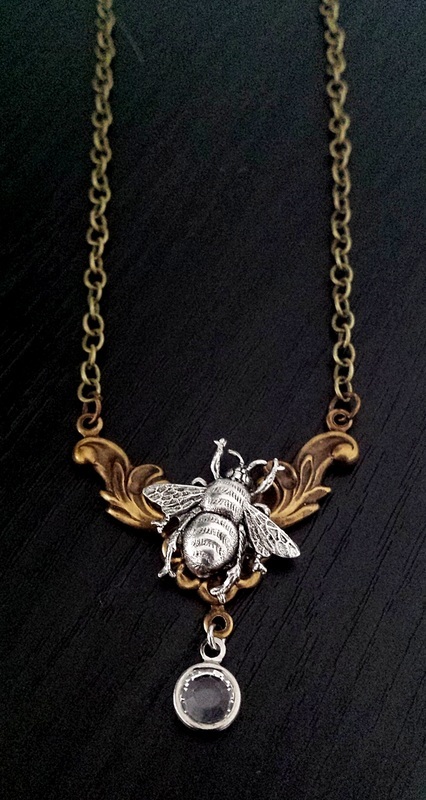 This fabulous 35mm wide Antiqued Brass Rococo style connector homes a gorgeous detailed antiqued silver Bumble Bee and a stunning channel set Austrian Swarovski crystal dangle. Strung on 45cm of matching chain. This length can be altered on request, just leave instruction when checking out. 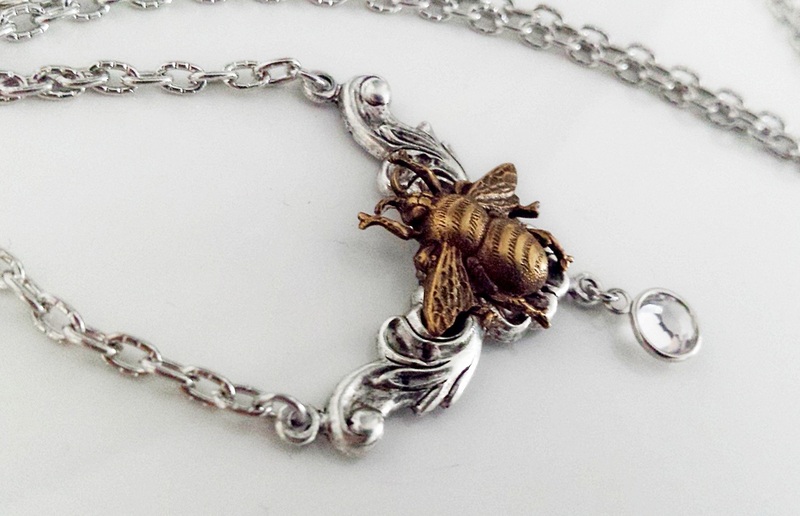 This fabulous 35mm wide Antiqued Silver Rococo style connector homes a gorgeous detailed antiqued brass Bumble Bee and a stunning channel set Austrian Swarovski crystal dangle. Strung on 45cm of matching chain. This length can be altered on request, just leave instruction when checking out. 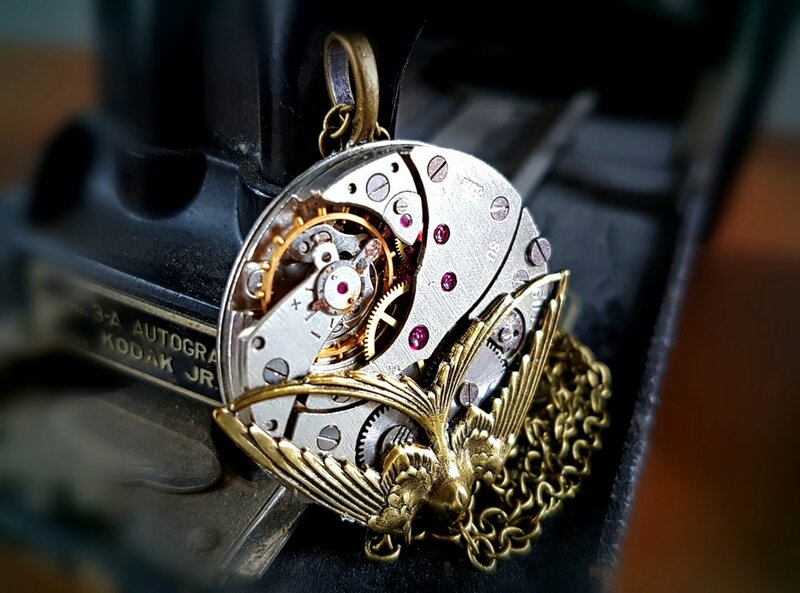 This intricate mechanical watch movement now exposes its cogs, Geneva waves and deep red ruby jewel pivot points. 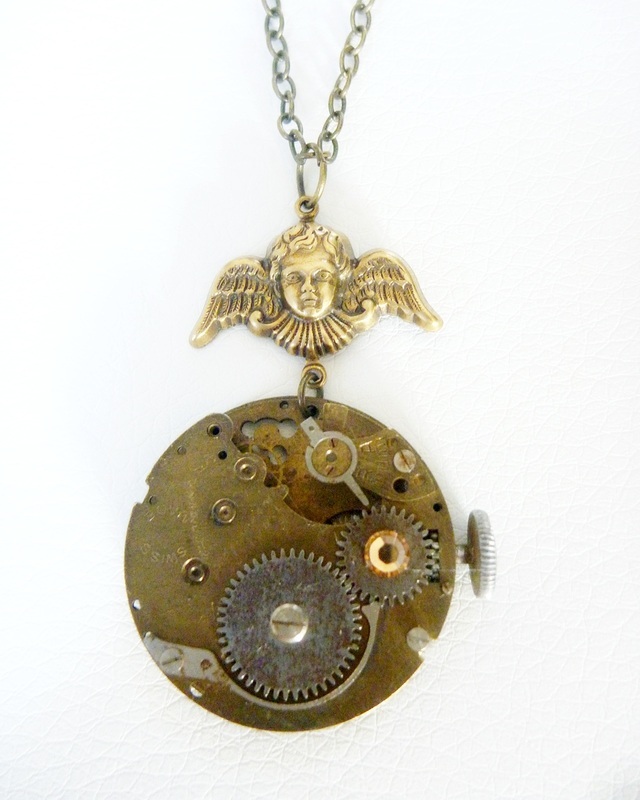 I have recessed it into 3cm wide deep sided brass bezel hung from a funky chunky hook. A sparkly clear wee Metallic look Swarovski crystal gives a touch of bling. 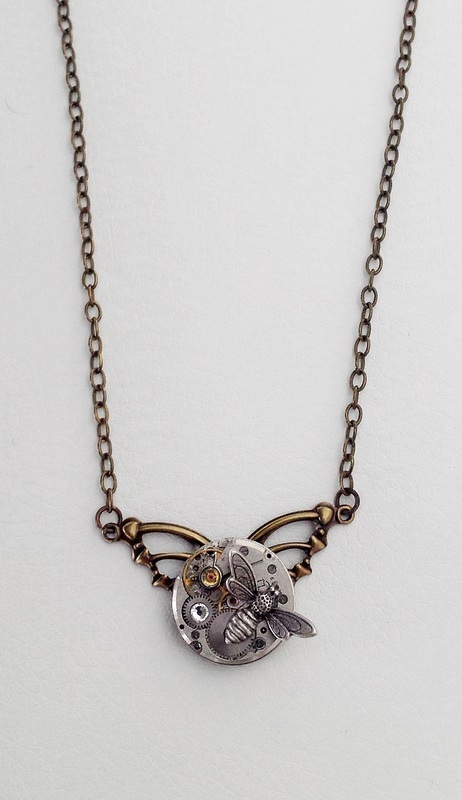 Strung from approx 80cm of lead & nickel free antiqued brass chain. I can adjust this length on request. Just leave instruction at check out. 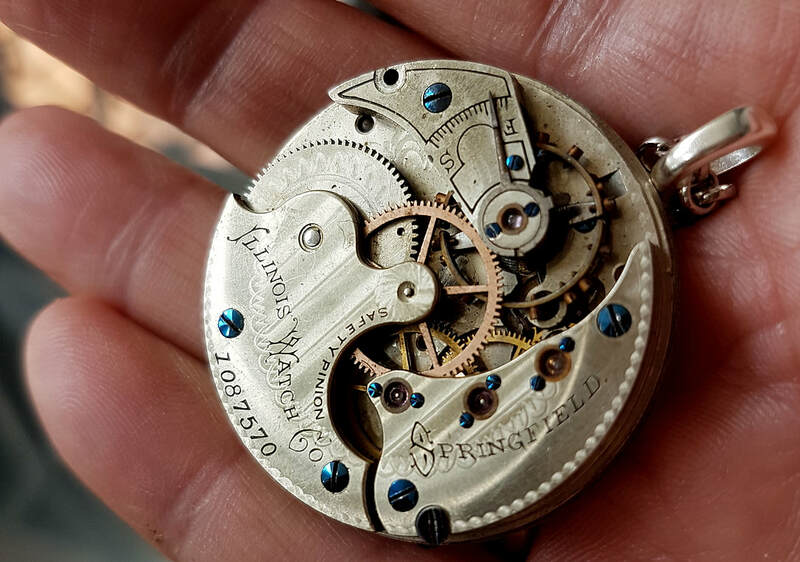 This amazing Vintage Pocket Watch Movement is approx 35mm across. 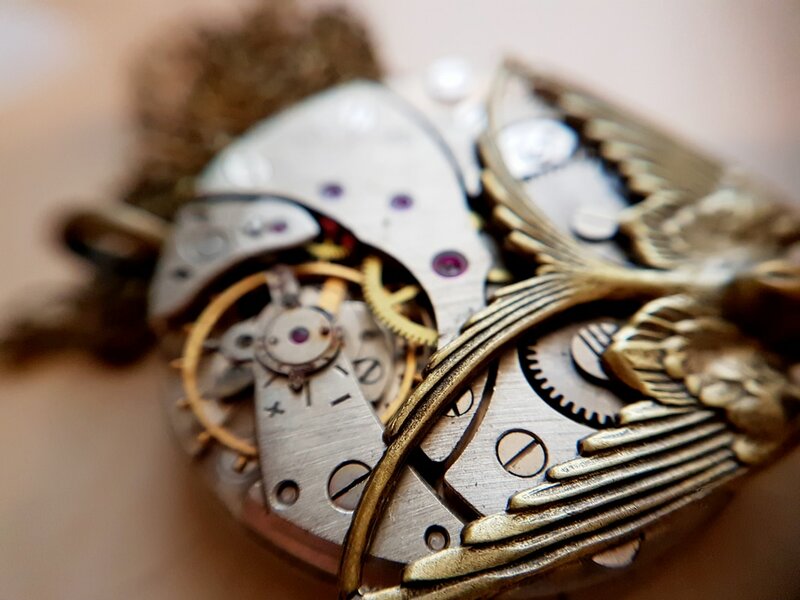 The intricate gears, cogs and ruby jewelled pivot points are fabulous. 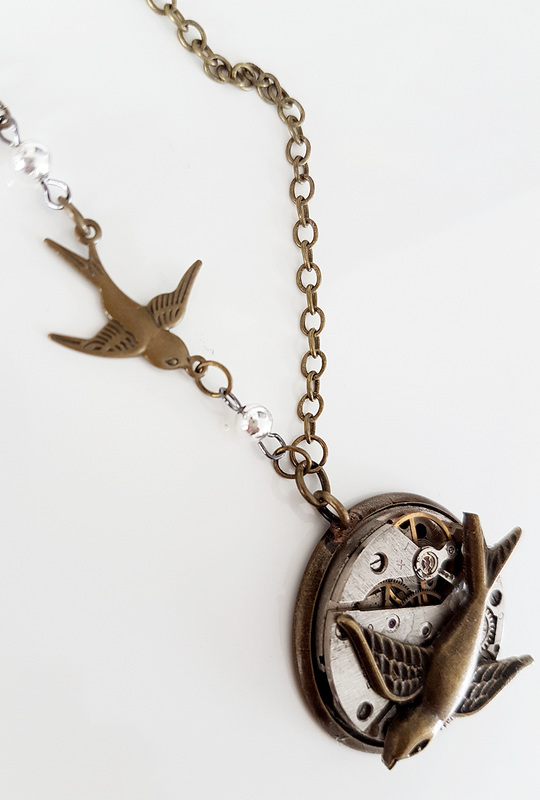 I have added a wonderfully detailed antiqued brass swallow that curves gracefully across the steel. This is strung from a solid brass bale and approx 80cm of matching lead & nickle free cable chain. Contact me if you want something personalised or changed. This is an amazing (hard to find!) 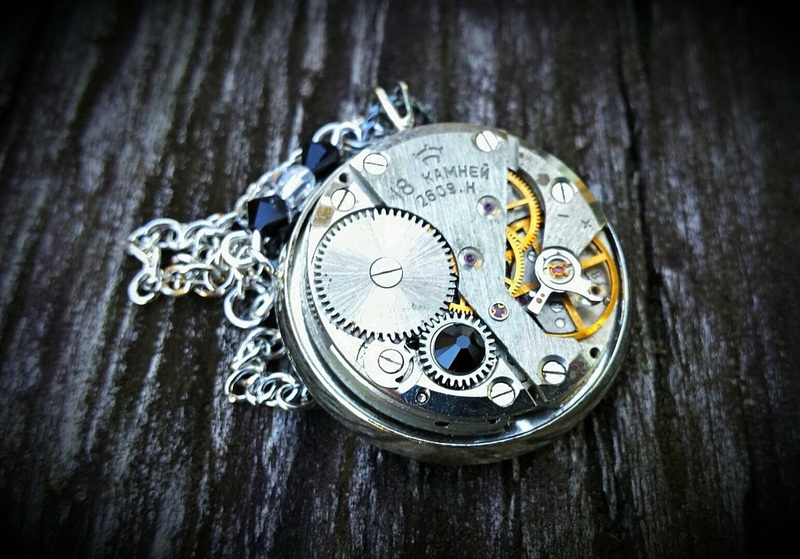 35mm Vintage Pocket Watch Movement. 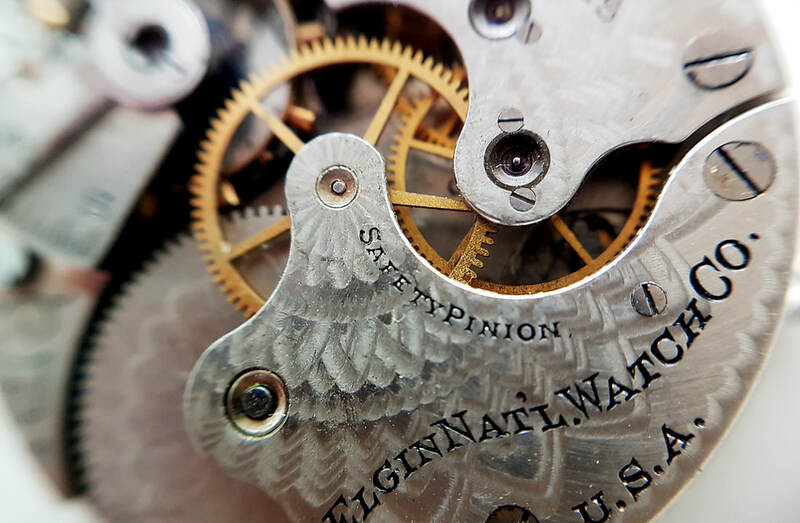 The intricate gears, cogs and ruby jewelled pivot points are fabulous. 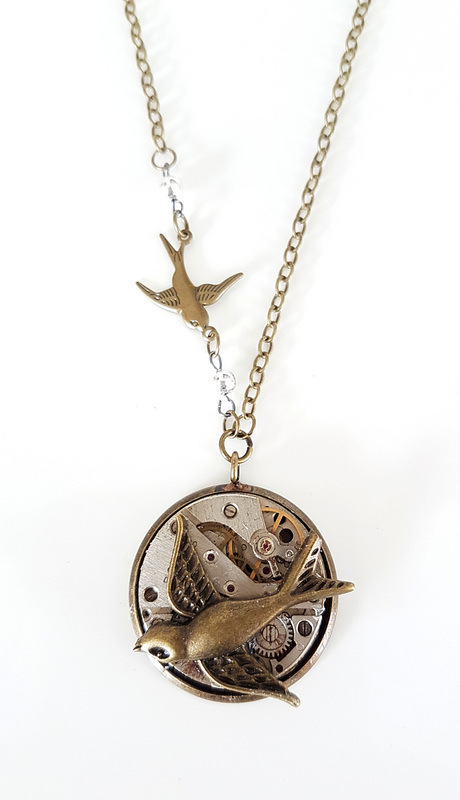 I have added a wonderfully detailed diving swallow that curves gracefully across the steel. This is strung from approx 80cm of platinum silver tone cable chain. Just leave instruction at checkout if you want this length altered or contact me. 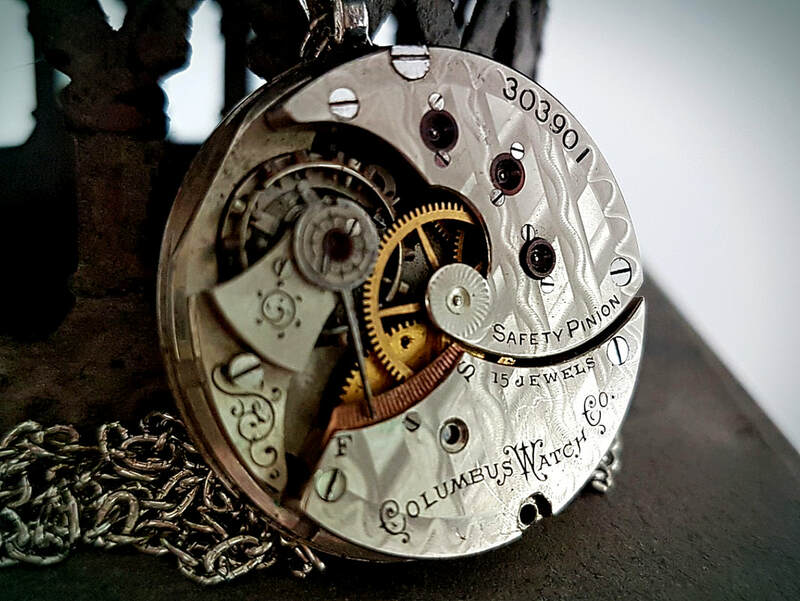 This intricate 25mm wide vintage watch movement now shows off its cogs gears and red ruby jewel pivot points. 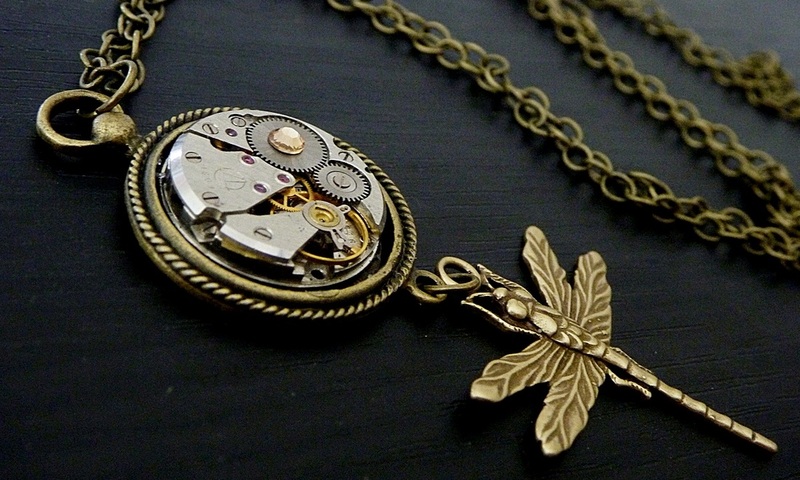 A large detailed antiqued Brass dragonfly with a 48mm wide wing span adorns this mechanical beauty. This is an amazing (hard to find!) 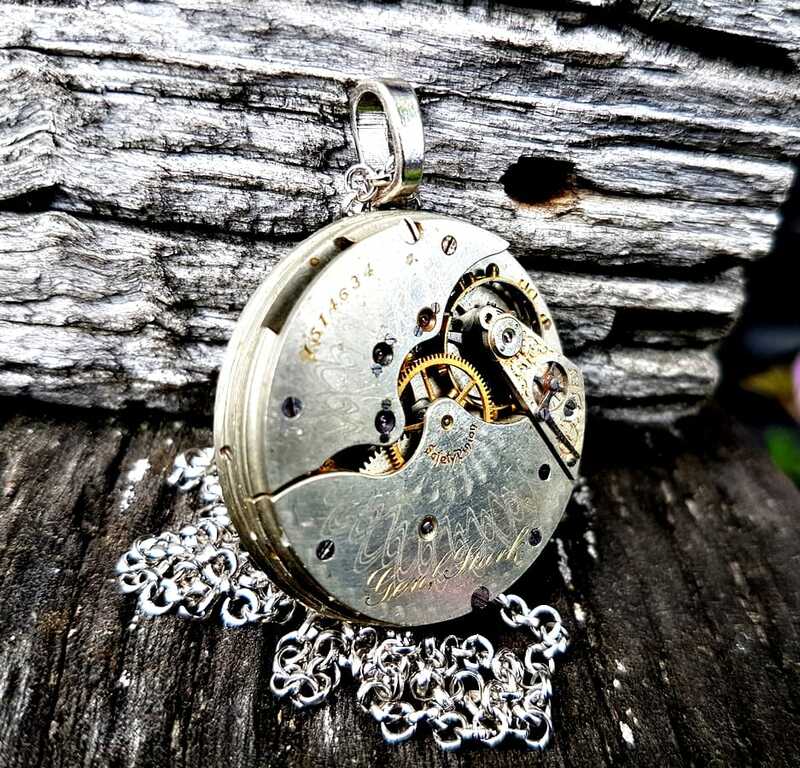 35mm Vintage Pocket Watch Movement. 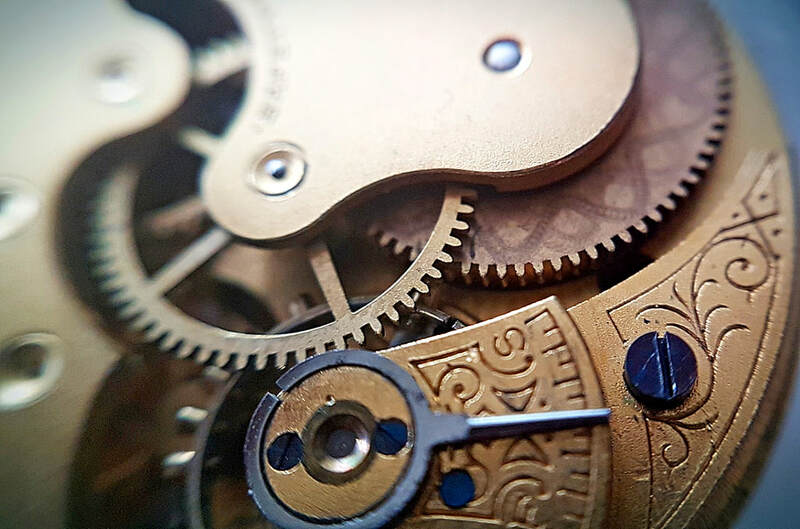 The intricate gears, cogs and deep red ruby jewel pivot points are fabulous. 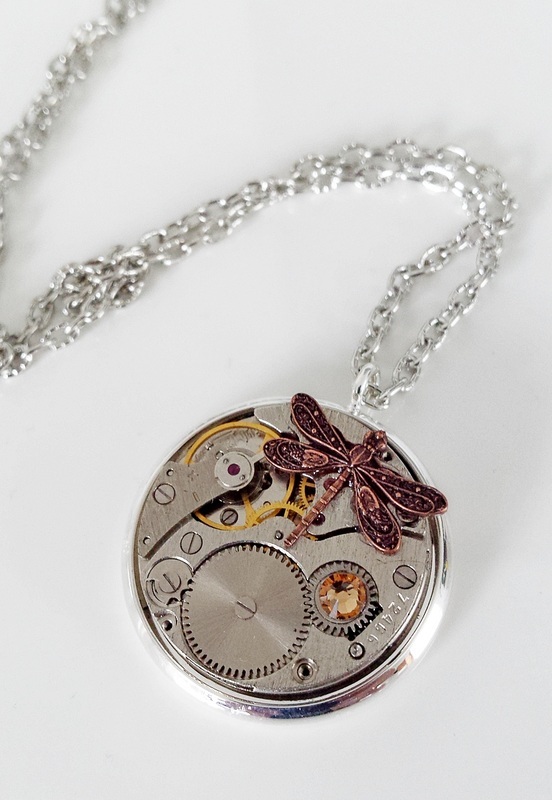 I have added a wonderfully detailed antiqued dragonfly that curves perfectly across the steel. This is strung from about 80cm of darkened silver belcher chain. I can make the chain to any length, just leave instruction at check out. 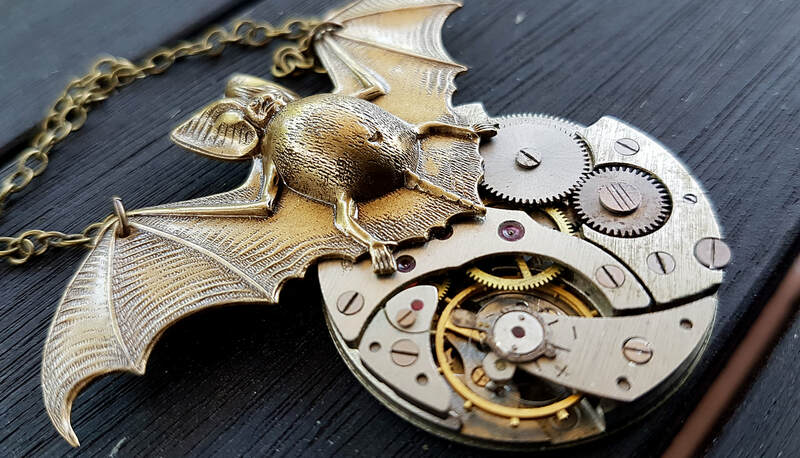 This 35mm Vintage Pocket Watch Movement has been adorned with a wonderfully detailed solid brass fat bellied Bat. His wing span is an impressive 7cm across. 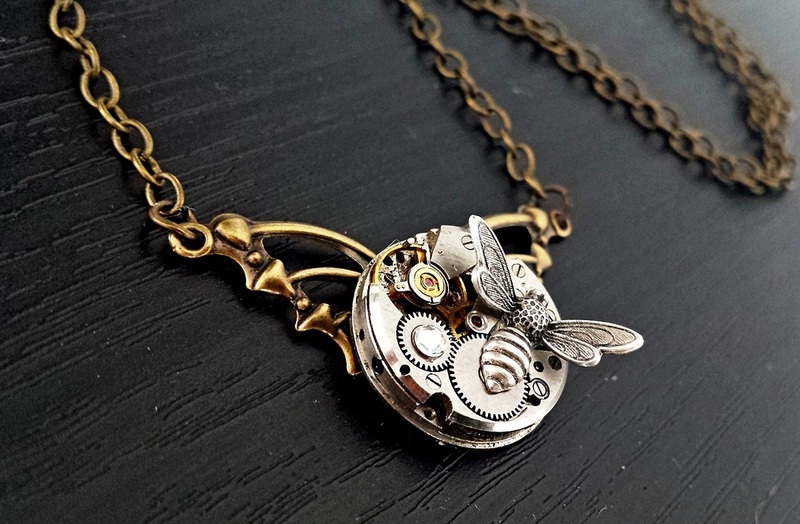 A stand out piece for those that love quirky and unique. Strung from about 80cm of matching antiqued brass chain, I can swap this to a silver tone chain on request. Leave instruction at checkout or feel free to contact me. 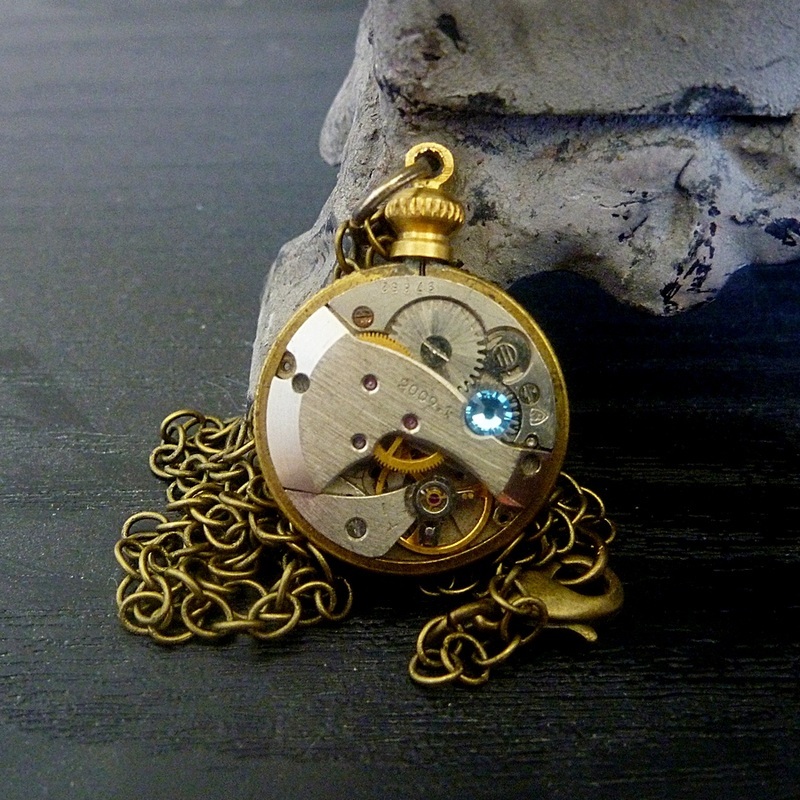 This is a 4cm industrial chic Vintage Brass Pocket Watch Movement. The now exposed internal workings and natural oxidization is fabulous. 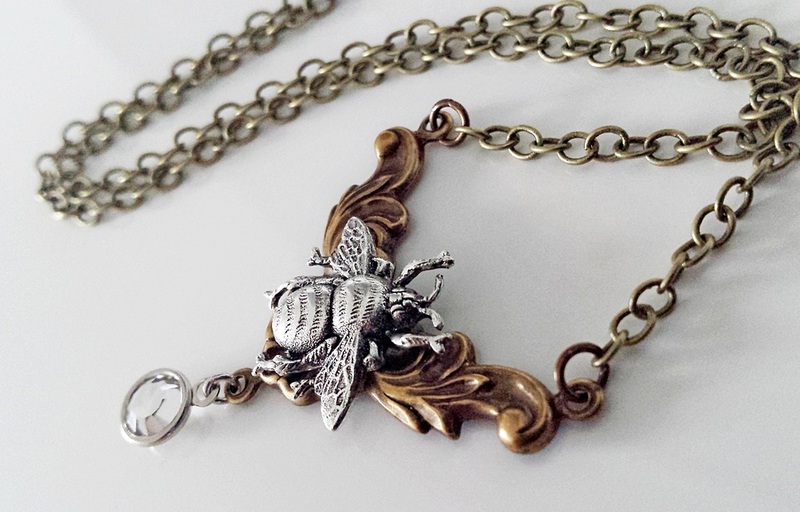 I have added a wonderfully detailed antiqued brass bumble bee. Strung from a chunky bale and about 160cm of doubled matching chain. (About an 80cm length) I can make the chain to any length, just leave instruction at check out. 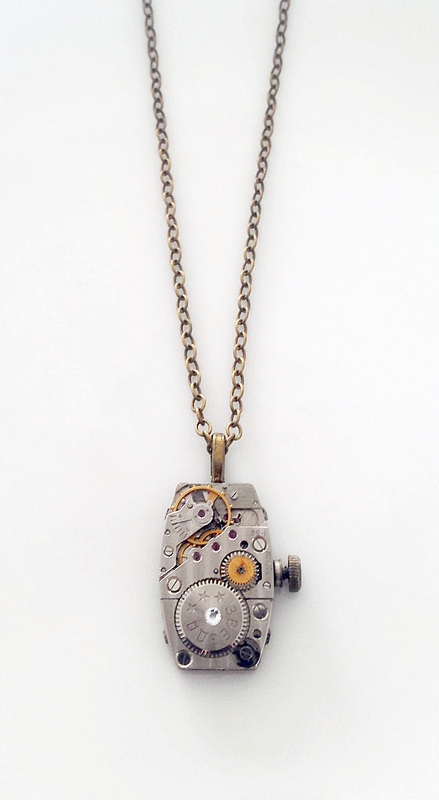 This funky 3cm oblong watch movement has intricate cogs, gears and Industrial ruby jewel pivot points. 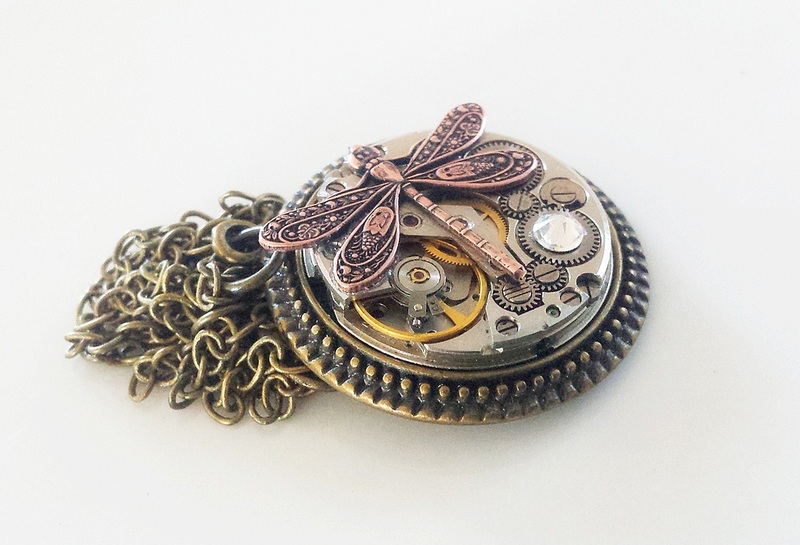 I have added a copper top loop and a beautifully detailed antiqued dragonfly . Comes strung on about 60cm of cable chain. I can alter this length. 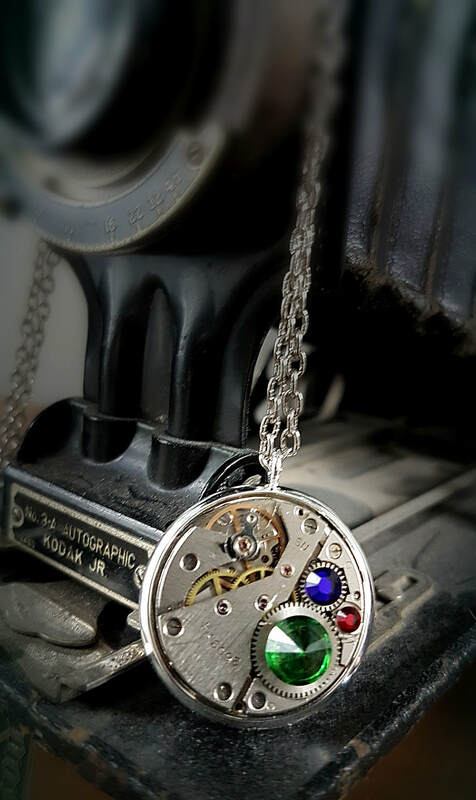 All the cogs, gears and red ruby jewels make for a unique pendant. I have added a genuine wee sky blue Swarovski crystal. 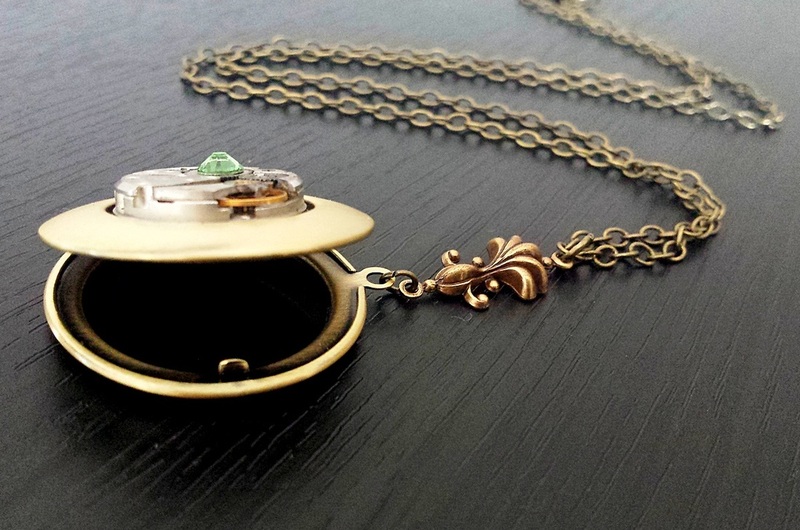 It all sits held within a 2cm wide vintage brass coin holder . I have strung this from 60cm of antiqued brass chain - Lead & Nickel free. I can adjust this length at no extra cost, just leave instruction at checkout. 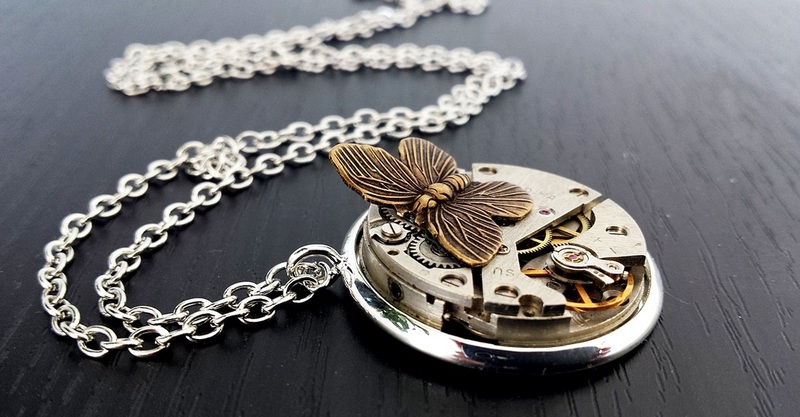 This intricate vintage watch movement is a beauty. 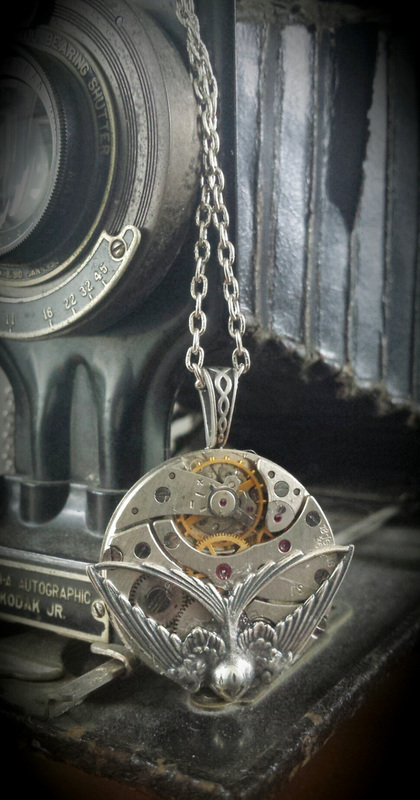 The exposed cogs, gears and red ruby jewels make for a unique pendant. 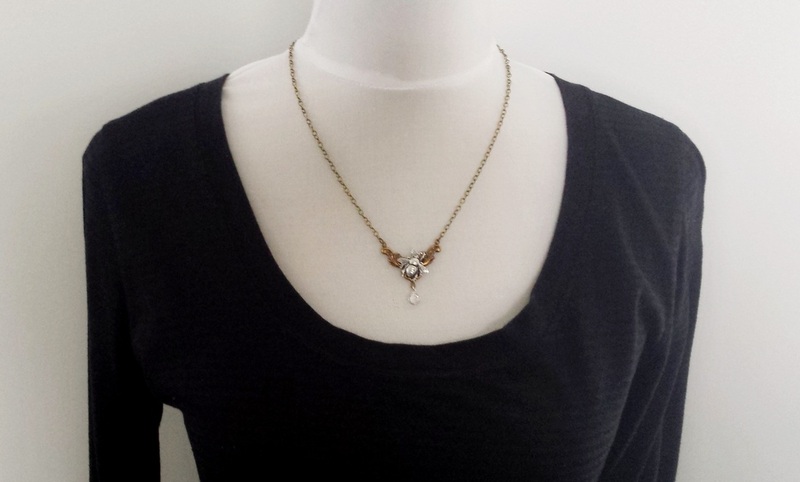 I have added a genuine golden metallic Swarovski crystal. 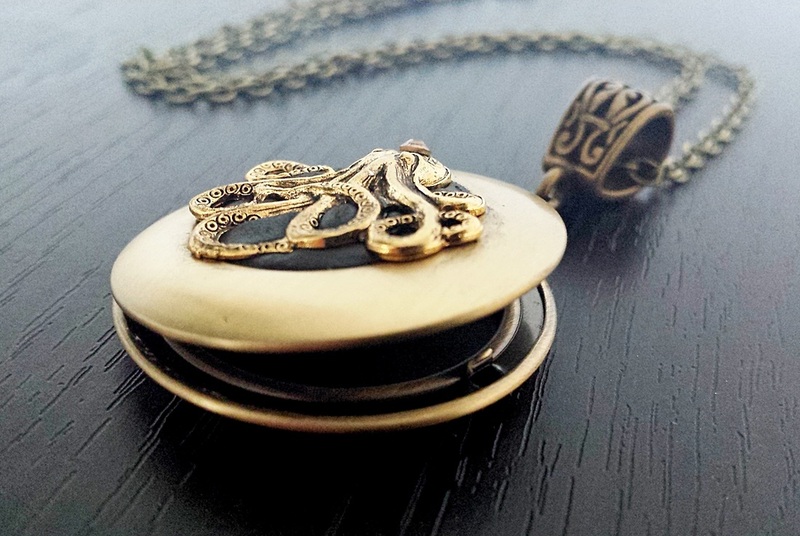 It all sits held within a 2.8cm wide vintage brass coin holder. I have strung this from 60cm of antiqued brass chain - Lead & Nickel free. I can adjust this length at no extra cost, just leave instruction at checkout. 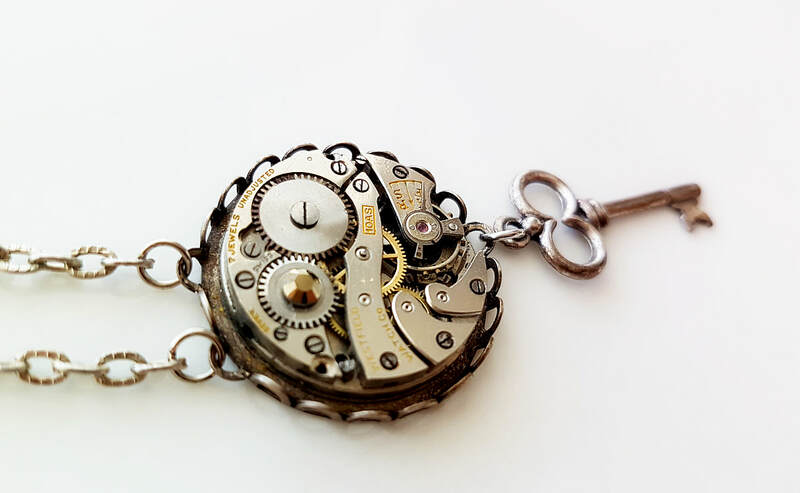 This lovely wee vintage watch movement has fabulous detailed gears, cogs and ruby jewel pivot points. It fits snugly in a 2x2cm antiqued silver frame and is embellished with a sparkly golden coloured Swarovski Crystal. Strung on 60cm of belcher chain. I can change this length on request, just leave me a message at check out. I can also make one with a different crystal, just check if I have your preferred colour. contact me. 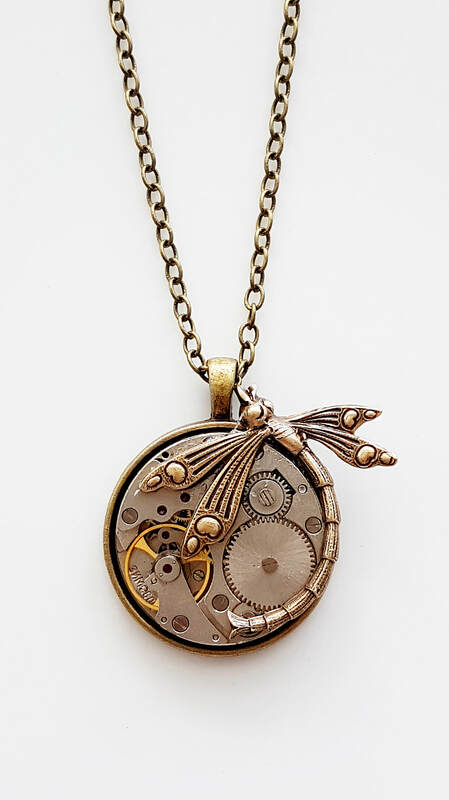 This intricate watch movement is set in a 25mm 4 claw brass setting. 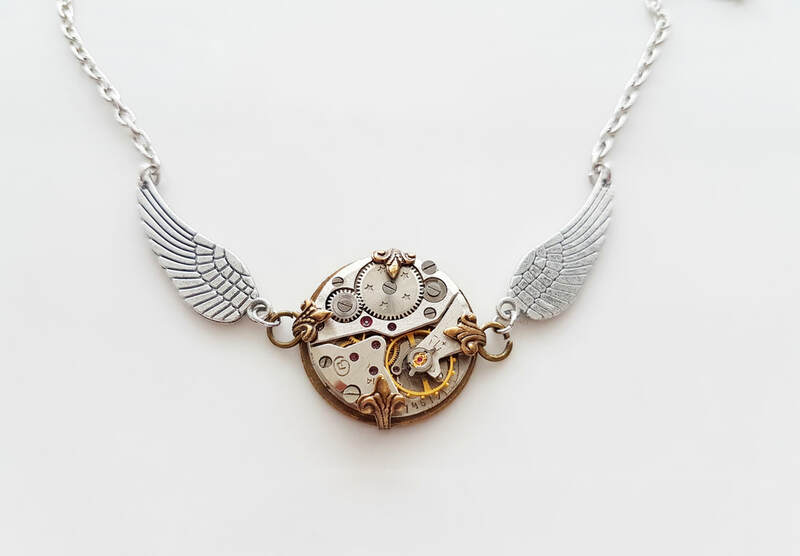 Strung between a pair of detailed wings and fine silver tone cable chain. 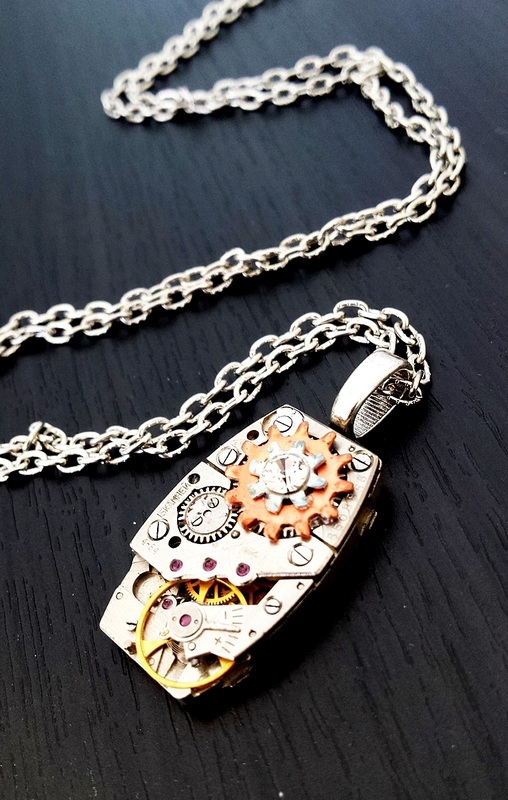 Cogs, gears and industrial red rubies are now part of this unique pendant. 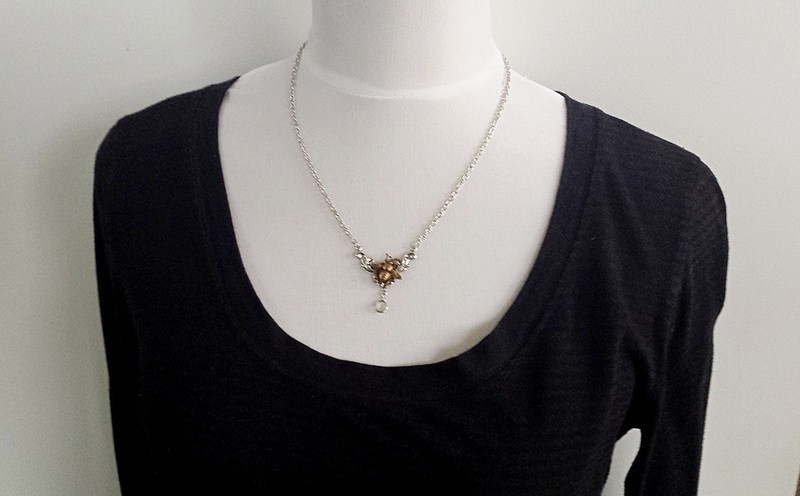 On a shorter chain to sit against your décolletage. 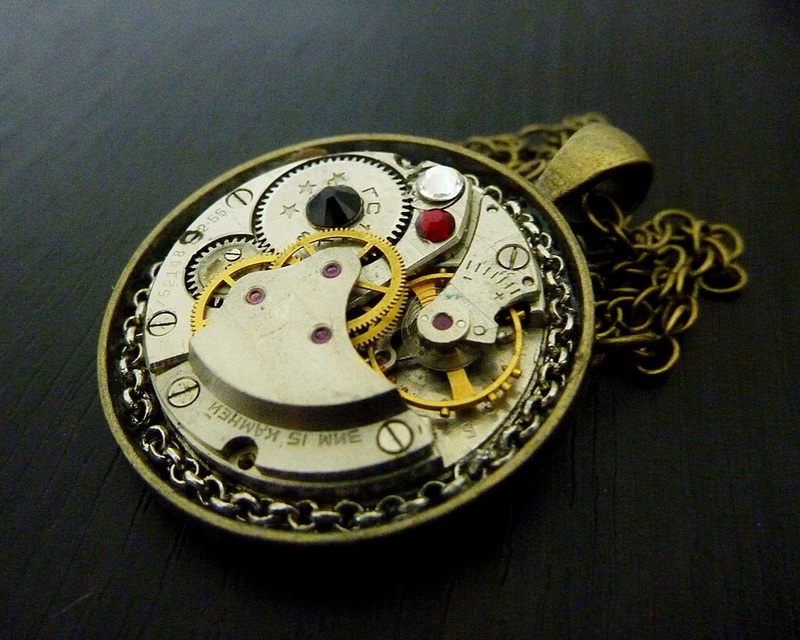 This amazing vintage watch movement is packed full if fascinating cog, gears and red ruby jewel pivot points. 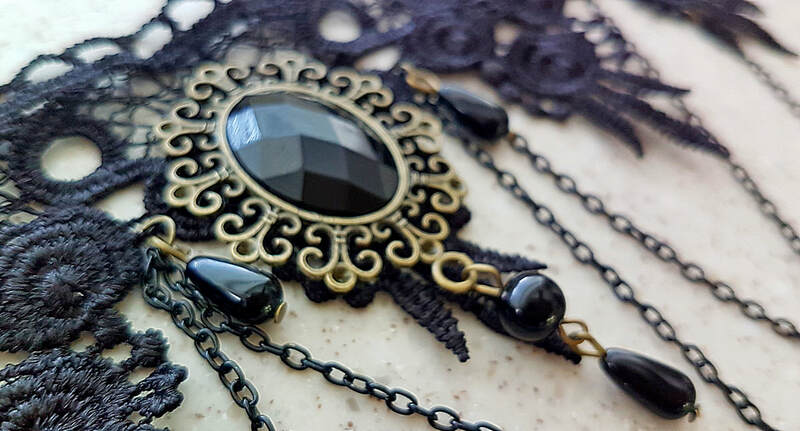 I have recessed it into a 3cm bezel, added jet black Swarovski crystals and strung it from approx 60cm of cable chain and 6 extra crystals.. Leave instruction at checkout if you would like the length changed. 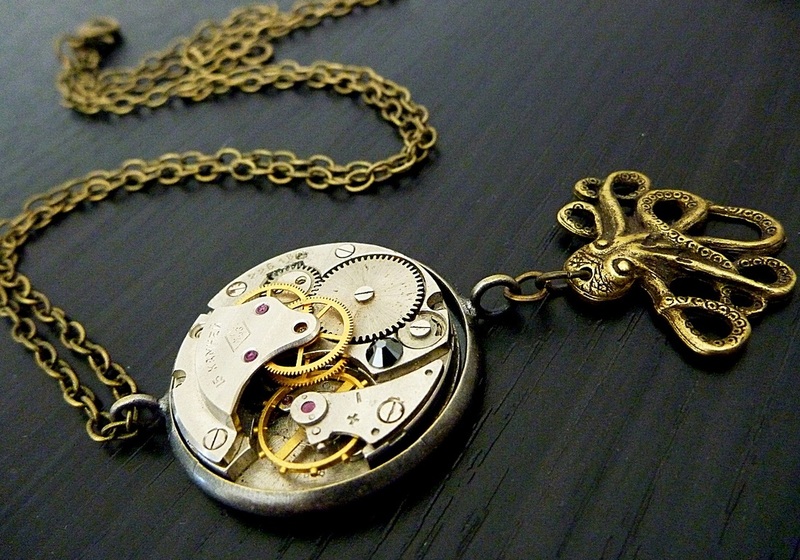 This lovely wee vintage watch movement now exposes its cogs, gears and red ruby jewels. 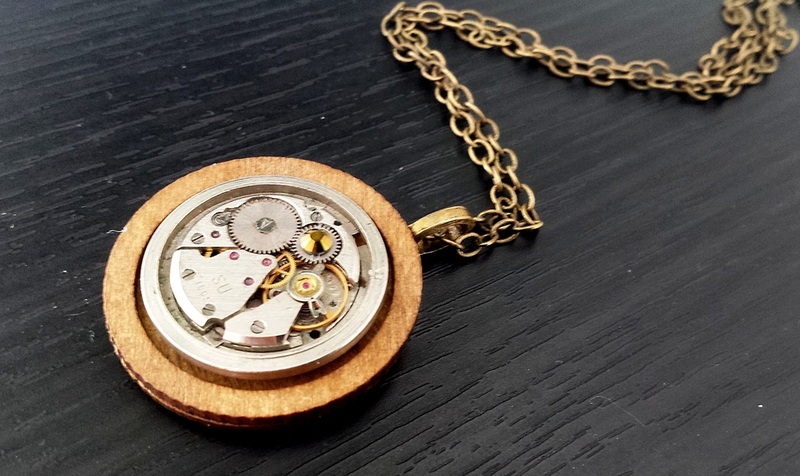 I have recessed it into a lovely layered wood bezel and a Dark Metallic gold Swarovski crystal sits towards the top of the movement. 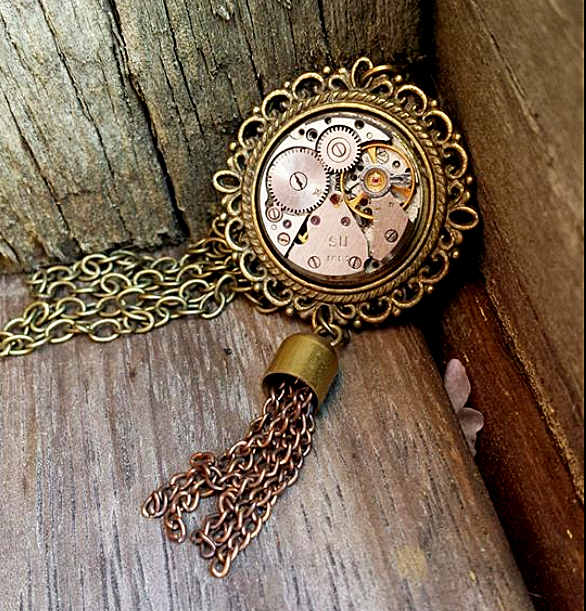 Strung on about 60cm of lead and nickle free antiqued brass chain. Contact me if you would like a shorter or longer chain length or something custom made. 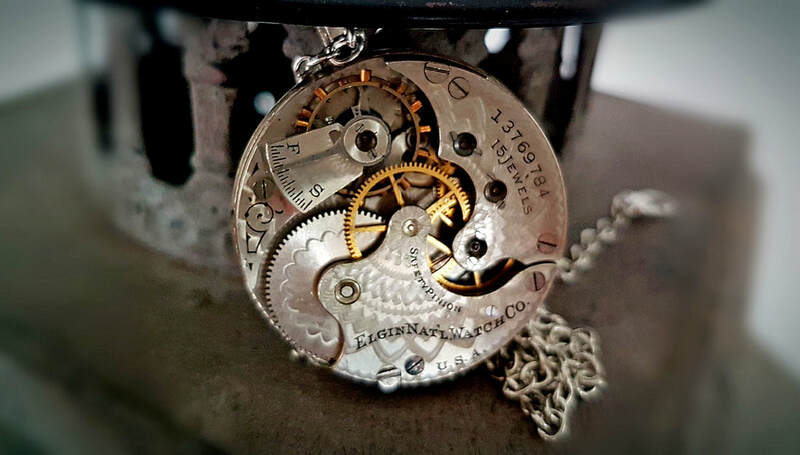 This old mechanical watch movement is nestled into a 30mm antiqued brass bezel. 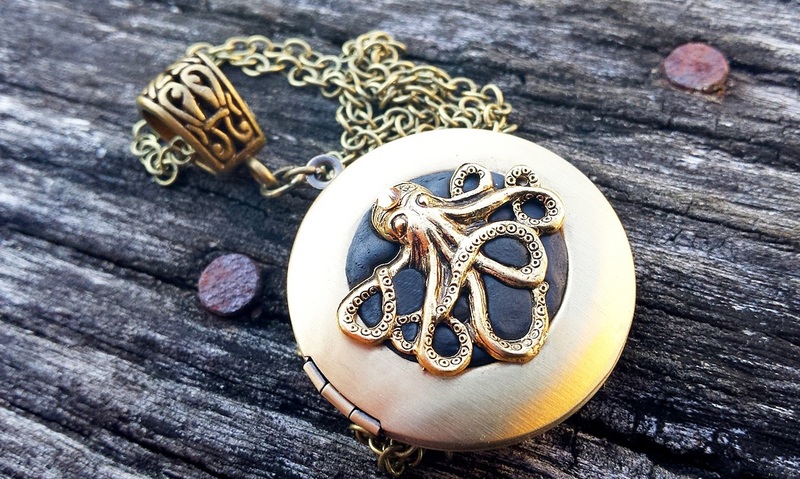 Invading this space is a wonderfully detailed funky Octopus with a wee metallic gold Austrian crystal on its forehead. Strung on about 60 cm of matching lead and nickel free antiqued brass cable chain. Contact me if you want this length altered or a bespoke piece made. 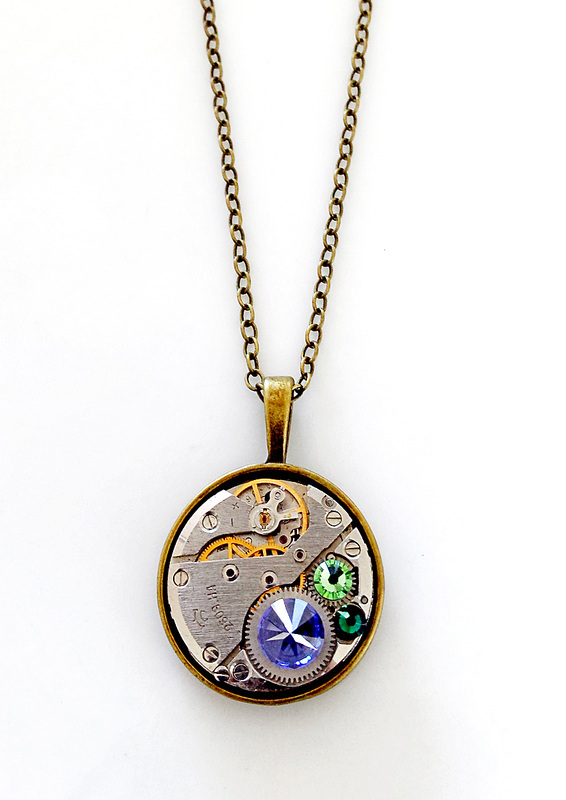 This Pendant is a funky combination of a vintage watch movement, a Cubic Zirconia and two genuine Swarovski Crystals. The CZ forms a peak with a gorgeous sparkle and several of the Red Ruby Jewel pivot points are also now visible. 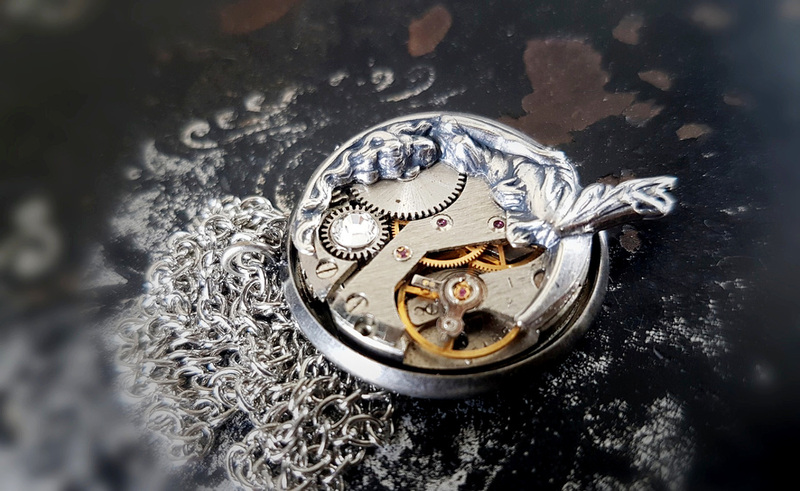 The movement is recessed into a 3cm wide bezel and the "Geneva Waves" give off a lovely shimmery rippled effect even though the surface is smooth. Strung from approx 60cm of cable chain. 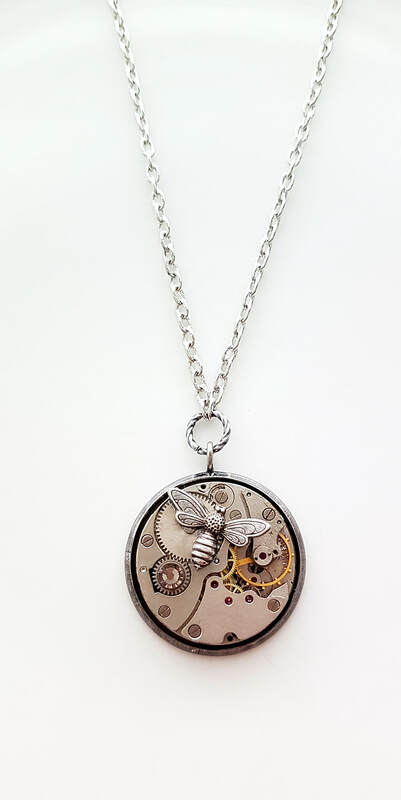 I have adorned this gorgeous petite vintage watch movement with a stunning wee detailed bee and a sparkly Swarovski crystal. It sits on brass wings that span about 3.5cm. 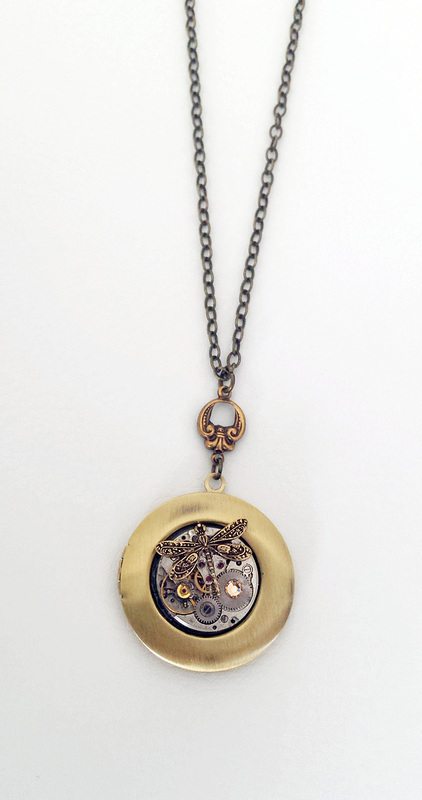 A gorgeous combination that comes on lead and nickle free antiqued brass cable chain. ﻿Leave instruction if you want the chain to a specified length, otherwise it should sit as per the photo. 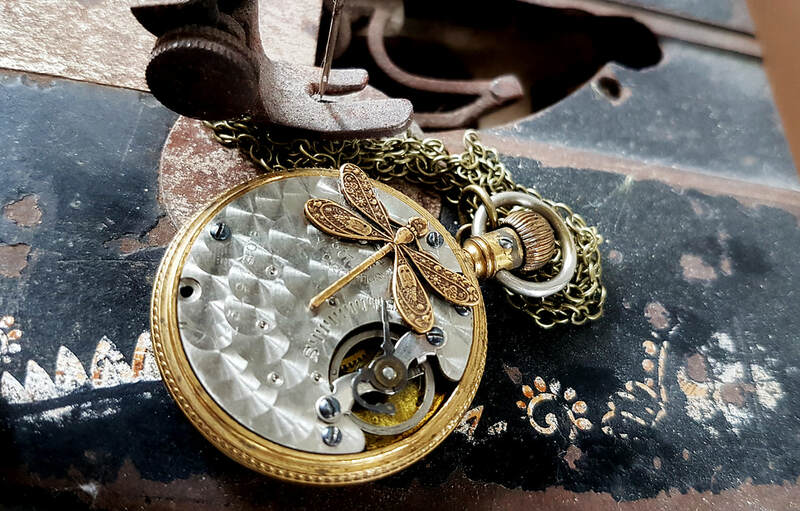 This wonderfully detailed antiqued Copper Dragonfly sits across a vintage watch movement along with a clear Swarovski Crystal. 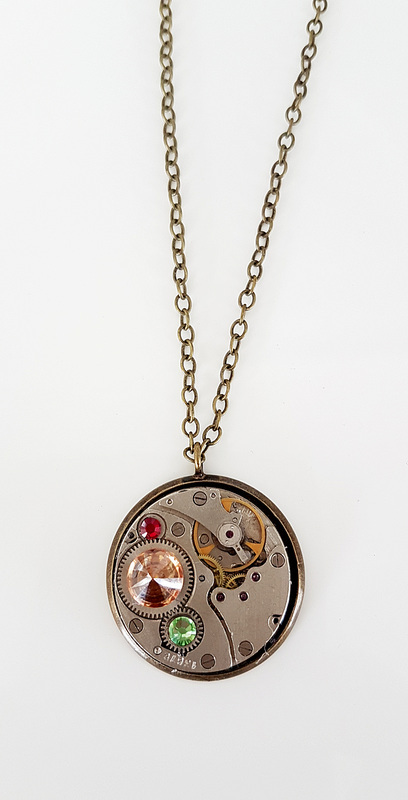 The intricate ruby jewelled movement is recessed in to a 3cm wide antiqued brass setting with 60cm of matching lead and nickel free chain. This length can be altered on request. Just leave instruction at checkout or contact me. 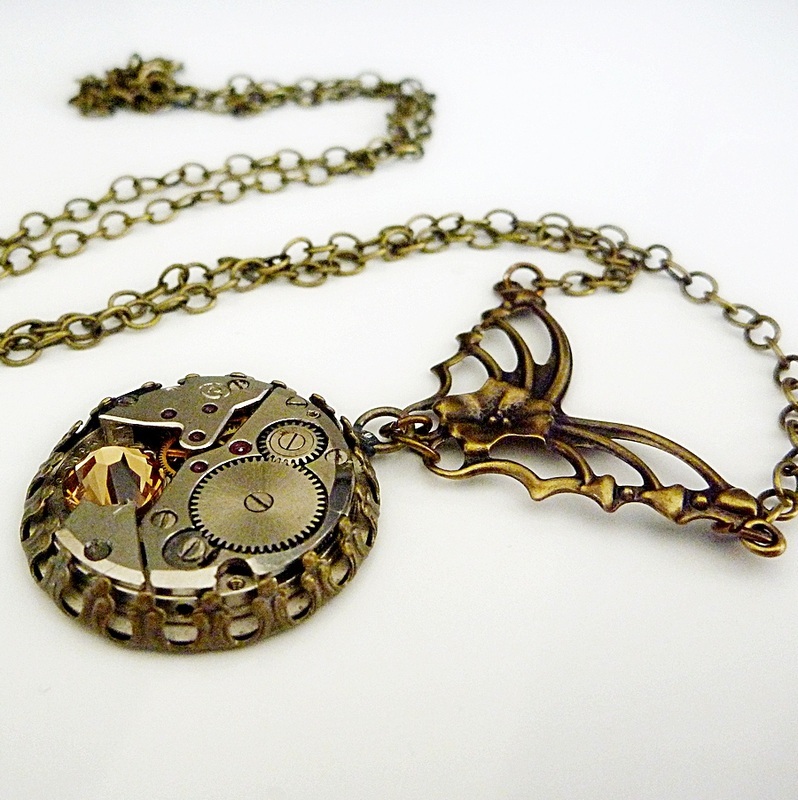 This 25mm wide Vintage watch movement is in funky Antiqued Brass Lace Edged setting. 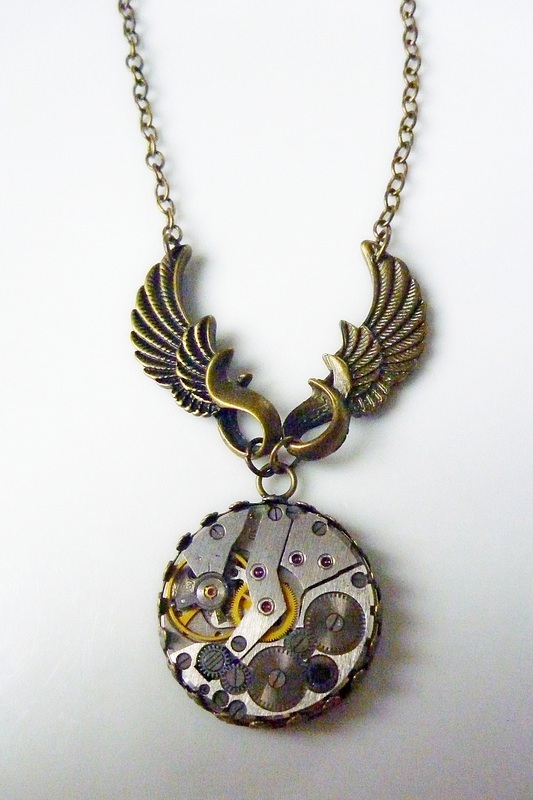 The intricate cogs, gears and red ruby jewels are now exposed. 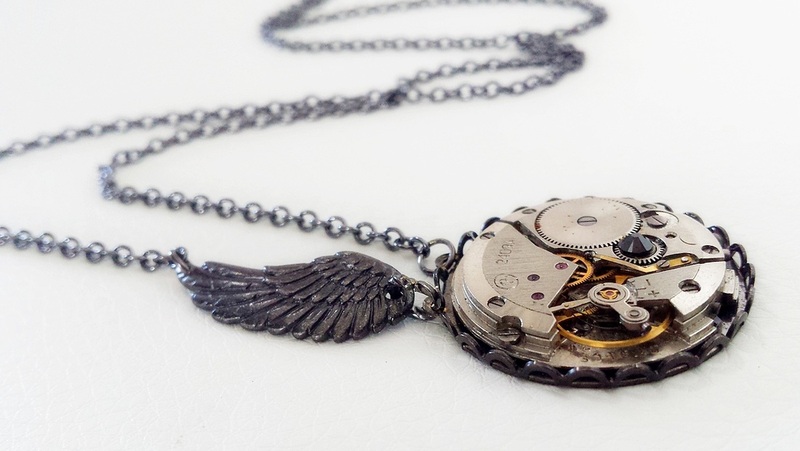 I have strung this from 2 gorgeous detailed Angel wings and about 60cm of lead and nickel free matching chain. This length can be altered on request. Just leave instruction at checkout or contact me. 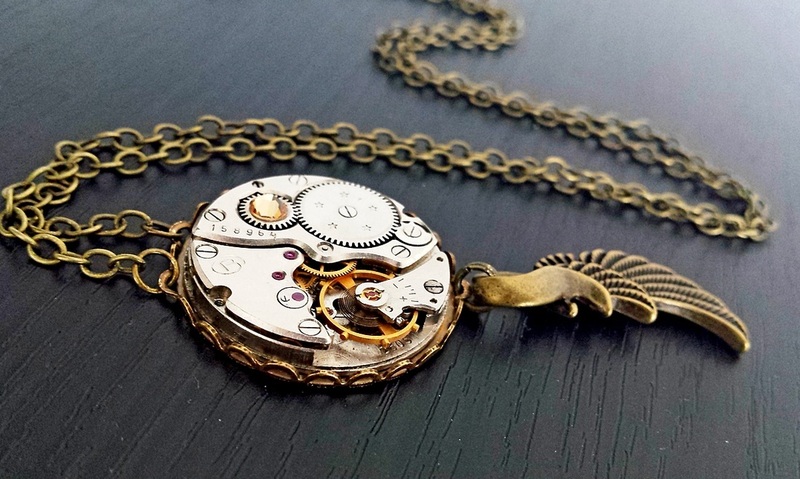 This fabulous vintage watch movement now shows off its intricate gears and cogs. These old brass beauties are hard to find and becoming even more rare as the digital age takes over. Each piece I make will be unique in some way. 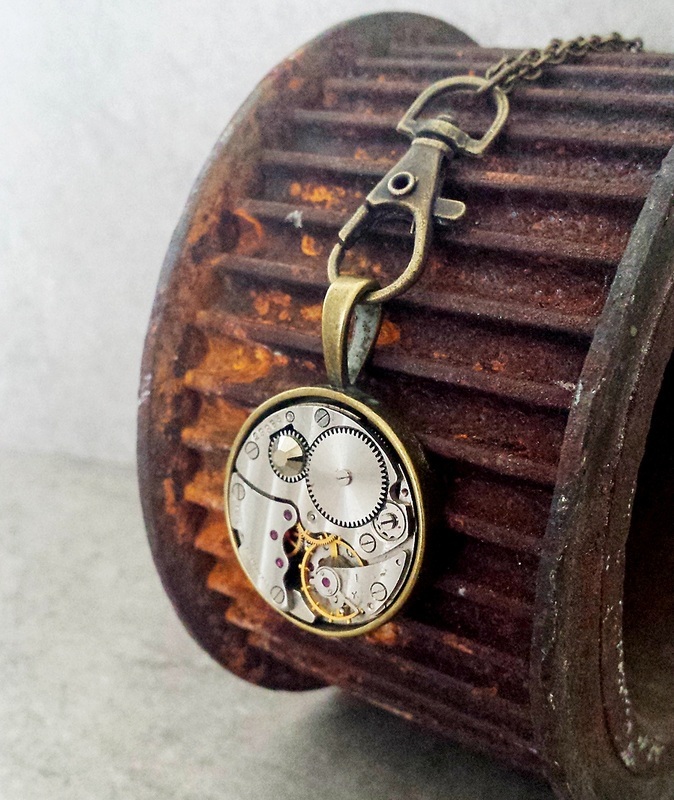 This Vintage Watch movement is set into a 3cm wide Antiqued Brass Bezel. 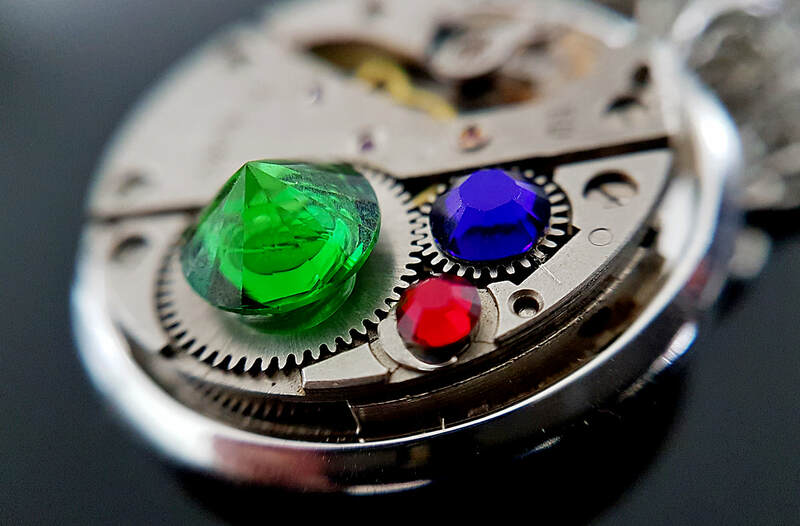 The fascinating cogs, gears and red ruby jewel pivot points are now exposed. 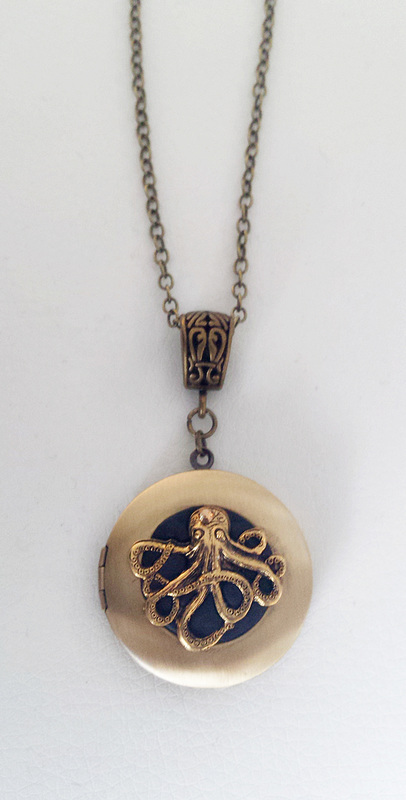 I have embellished this with a gorgeous metallic look Swarovski crystal and a detail octopus hangs below. Strung from 60cm matching lead and nickel free cable Chain. Contact me if you want something altered or Custom made. 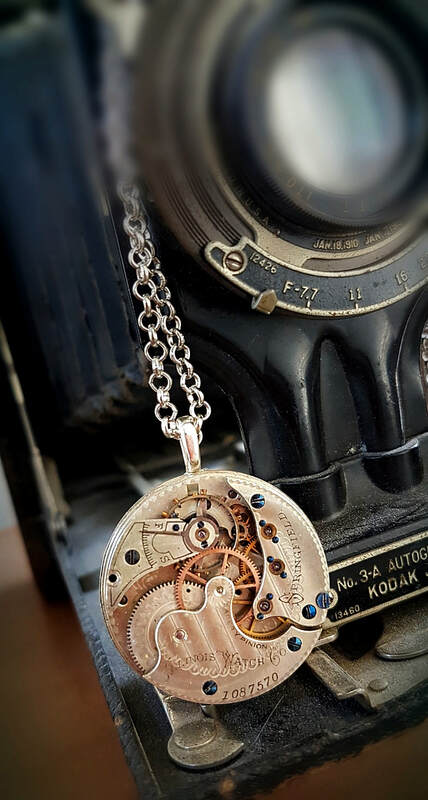 This vintage 25mm watch movement adorned with a golden Swarovski Crystal now exposes all its intricate cogs, gears and industrial ruby jewels. 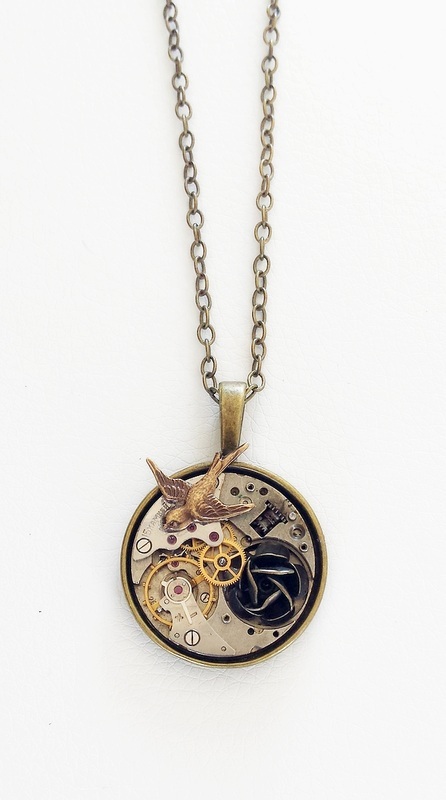 It sits recessed into a lace edged bezel setting with a stunning antiqued Brass 3D owl above. 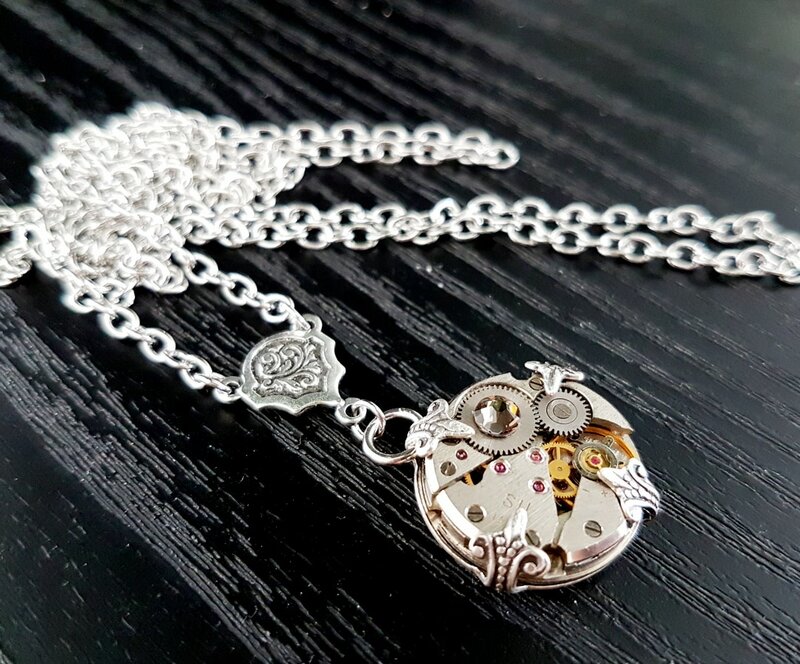 The combined pendant has a total drop of about 6cm. Strung with 80cm of matching lead and nickle free chain. A Unique Statement piece. Be Funky, Be Different! Contact me if you would like a shorter or longer chain length. 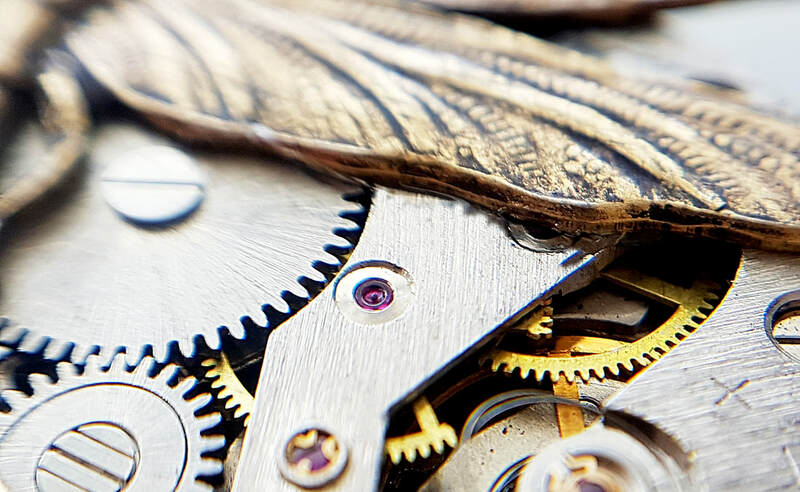 This vintage watch movement now exposes all its intricate cogs, gears and red ruby jewels. 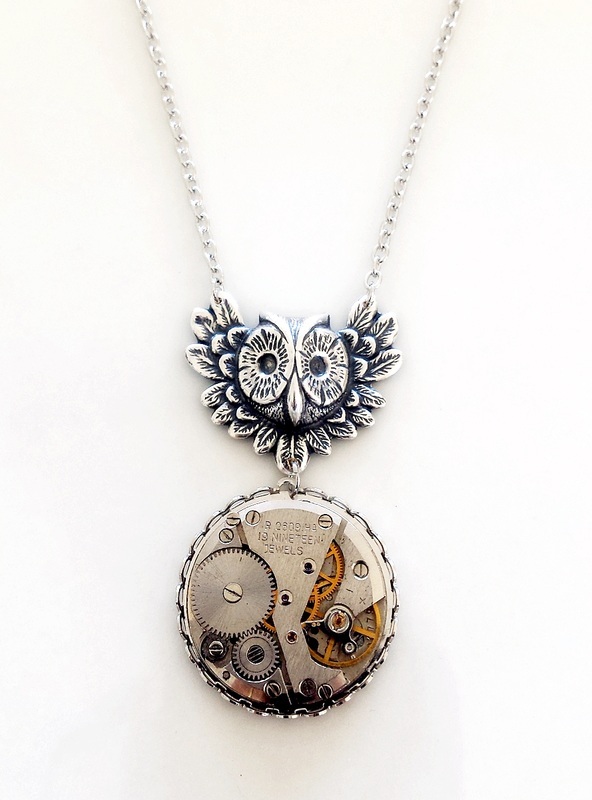 It sits recessed into a 30mm lace edged bezel setting with a stunning antiqued Silver 3D owl above. 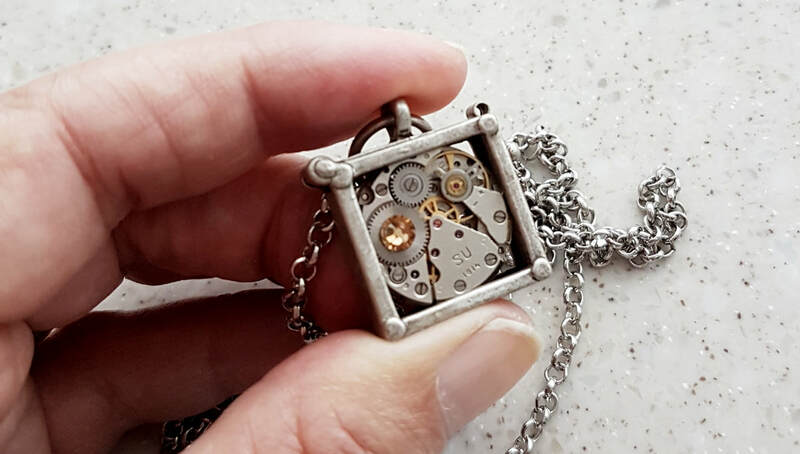 The combined pendant has a total drop of about 6cm. Strung with 80cm of matching cable chain. 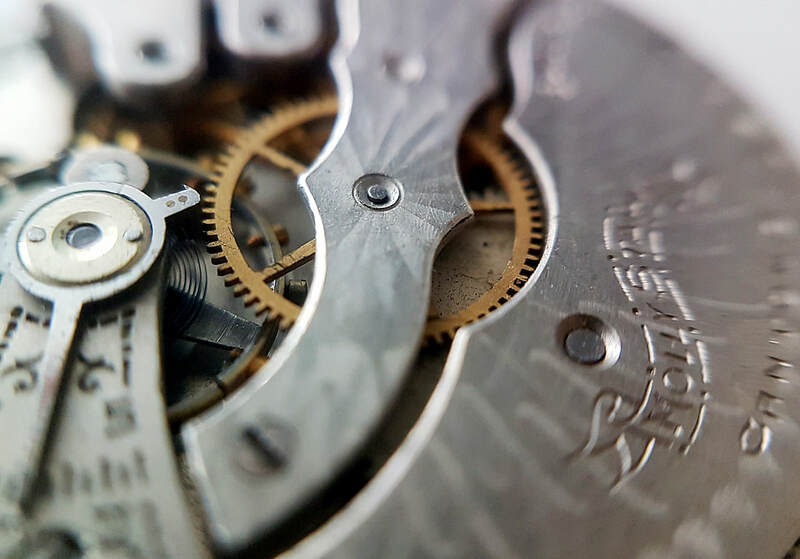 This fascinating vintage watch movement now has lots of its cogs, gears and red ruby jewel pivot points clearly visible. 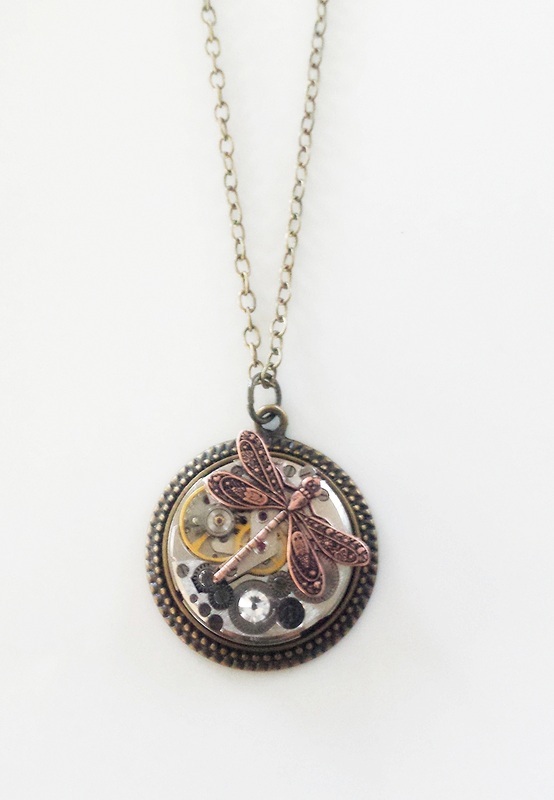 I have added gorgeous Golden Swarovski crystal and a detailed Antiqued Copper Dragonfly. It all sits snugly recessed into a 3cm wide setting. Strung on approx. 60cm of antiqued Silver cable chain. Contact me if you have any questions or would like something altered or custom made. 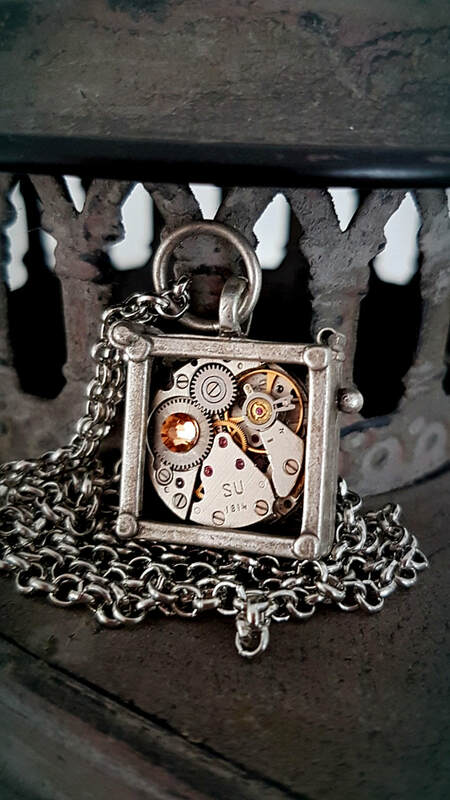 This small vintage ruby jewelled watch movement is nestled into a dark silver, side hinged metal locket with a stunning gold coloured Swarovski crystal that catches the light. I have strung it from a gorgeous 3 point filigree connector and 60cm of matching belcher (rolo) chain. Contact me if you have any questions or want the length altered. 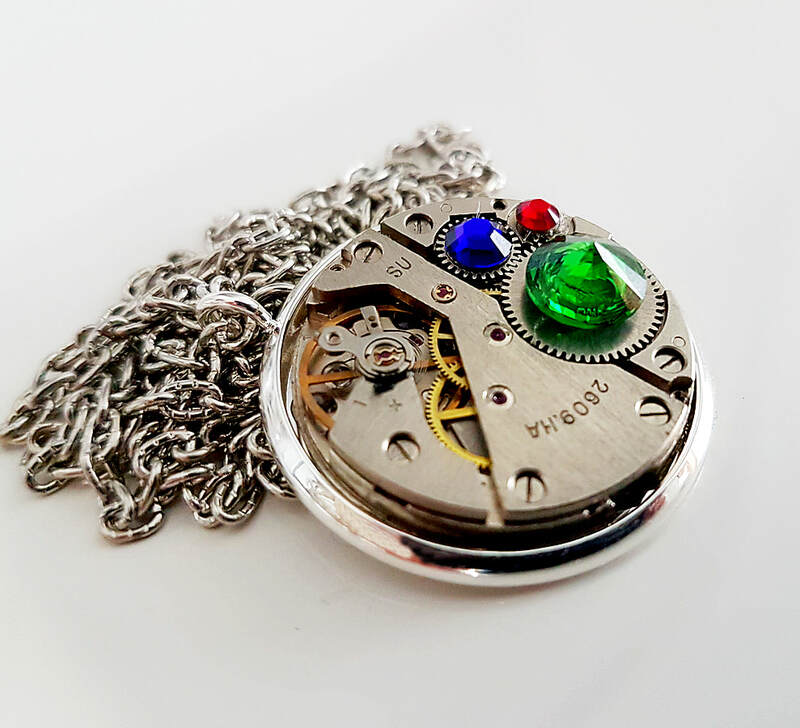 This small vintage ruby jewelled watch movement is nestled into a 3cm polished brass locket with a Peridot Green Swarovski crystal. Lots of the Intricate wee cogs and gears are now clearly visible. Perfect for storing a vintage family photo, lock of hair or some other small memento. I have strung it from a gorgeous fleur-de-lis connector and 60cm of antiqued lead and nickel free chain. 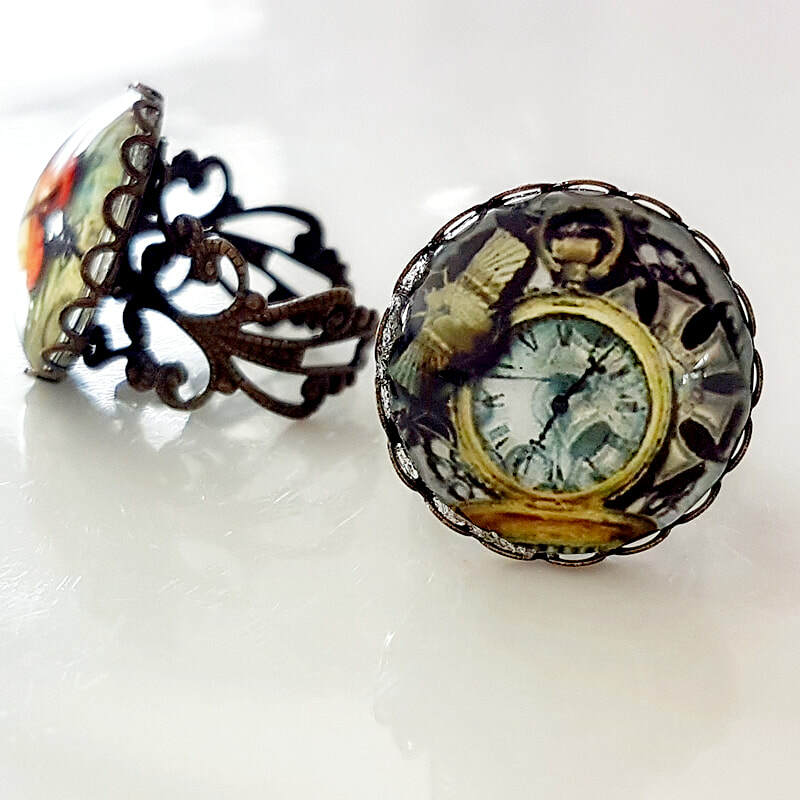 This vintage ruby jeweled watch movement is nestled into a 3cm antiqued silver locket with a small clear Swarovski crystal adding to its unique fascinating detail. 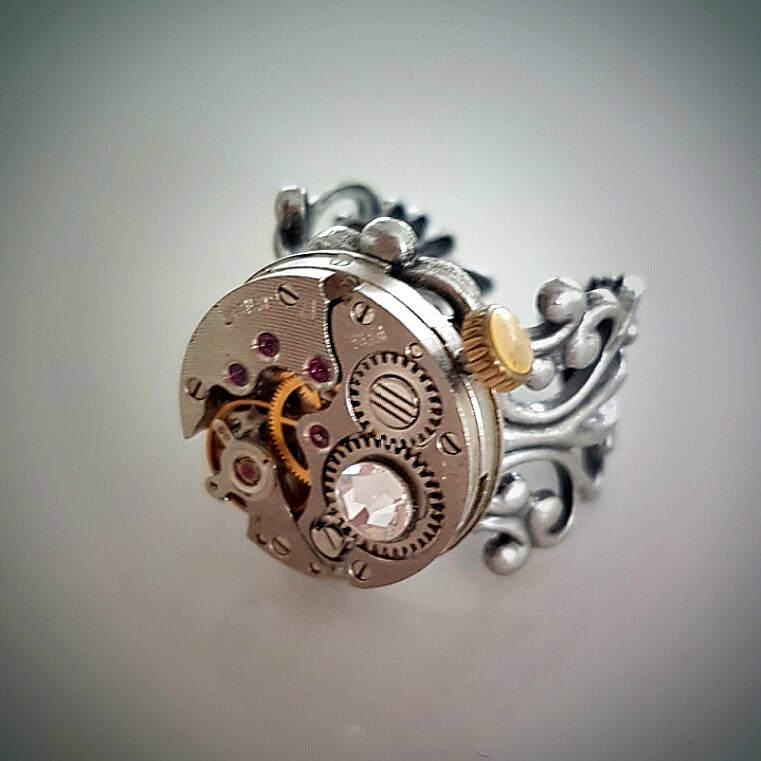 Intricate wee cogs, gears and red ruby jewels are now clearly visible. Perfect for storing a vintage family photo, a lock of hair or some other wee treasured memento. I have strung it from an antiqued 3 point connector and 60cm of cable chain. Contact me if you want the length altered or a different coloured crystal. Bespoke orders welcomed. 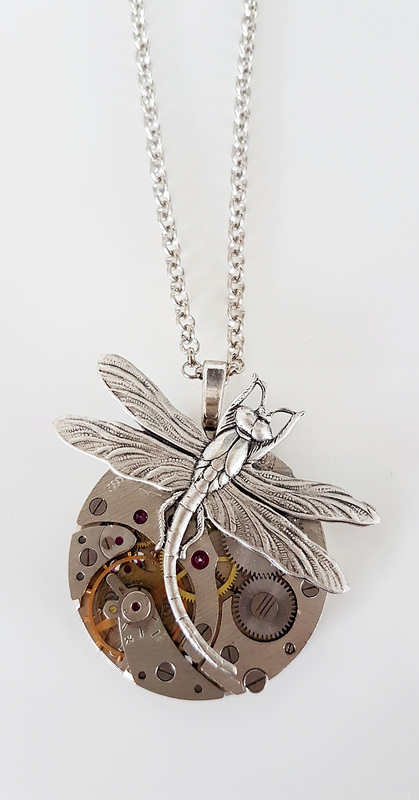 This vintage ruby jewelled watch movement is nestled into a 3cm antiqued brass side hinged locket with a detailed dragonfly adding to its unique beauty. Intricate wee cogs and gears are now clearly visible. Perfect for storing a vintage family photo or lock of hair. I have strung it from an antiqued 3 point connector and 60cm of matching lead and nickel free chain. 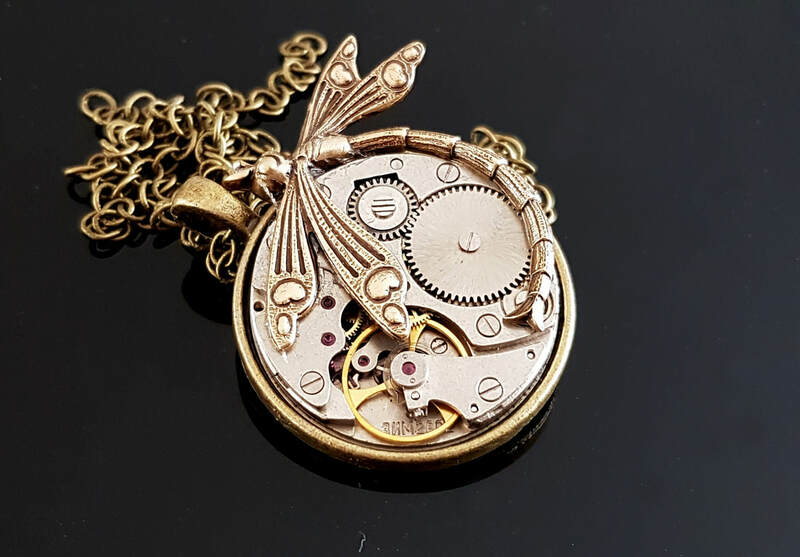 This vintage ruby jewelled watch movement is nestled into a 3cm polished brass side hinged locket with a detailed dragonfly and a soft gold Swarovski crystal adding to its unique beauty. Intricate wee cogs and gears are now clearly visible. Perfect for storing a vintage family photo or lock of hair. I have strung it from an antiqued scrolled connector and 60cm of matching lead and nickel free chain. 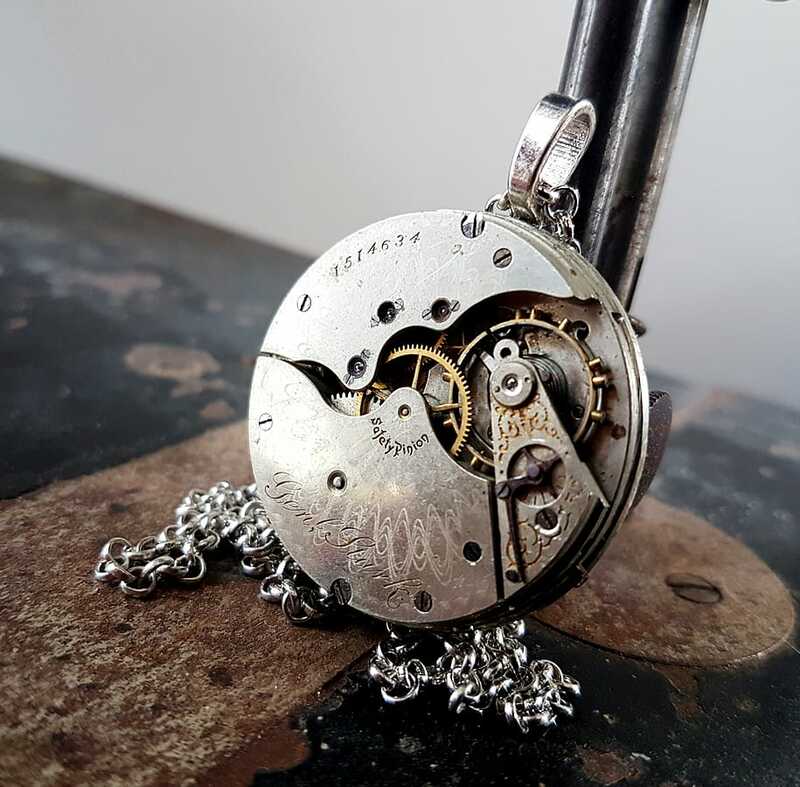 This vintage watch movement is set in a 3cm wide dark silver bezel setting, The internal cogs, gears and deep red ruby jewel pivot points are now exposed. Two stunning Austrian crystals along with a Deep Red peaked CZ look gorgeous amongst the industrial detail. The cable chain is approx 60cm long. Contact me if you have any questions or want the chain at a different length. Bespoke orders welcomed. 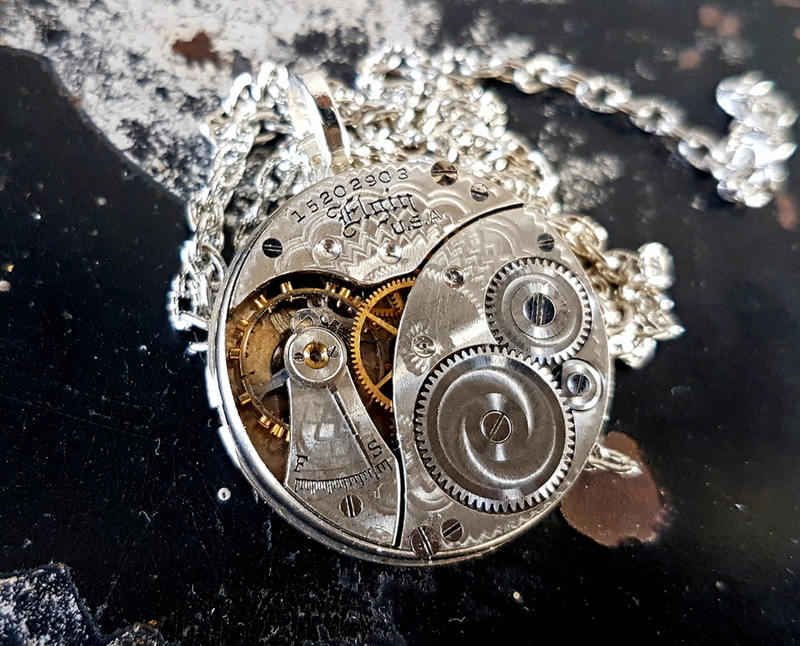 This vintage watch movement is set in a 3cm wide silver tone bezel setting, The internal cogs, gears and deep red ruby jewel pivot points are now exposed. Two stunning Austrian crystals along with a larger peaked Cubic Zirconia look gorgeous among the industrial detail. The matching cable chain is approx 60cm long. Contact me if you have any questions or want the chain at a different length. 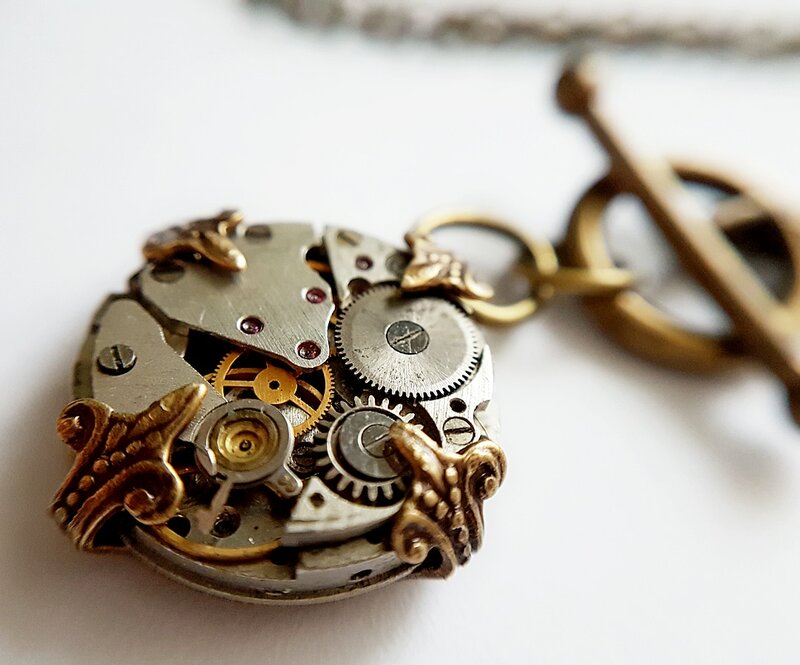 This vintage watch movement is set in a 3cm wide antiqued brass bezel setting, The internal cogs, gears and deep red ruby jewel pivot points are now exposed. Two stunning Austrian crystals along with a Spinel Blue peaked CZ look gorgeous amongst the industrial detail. The cable chain is approx 60cm long. 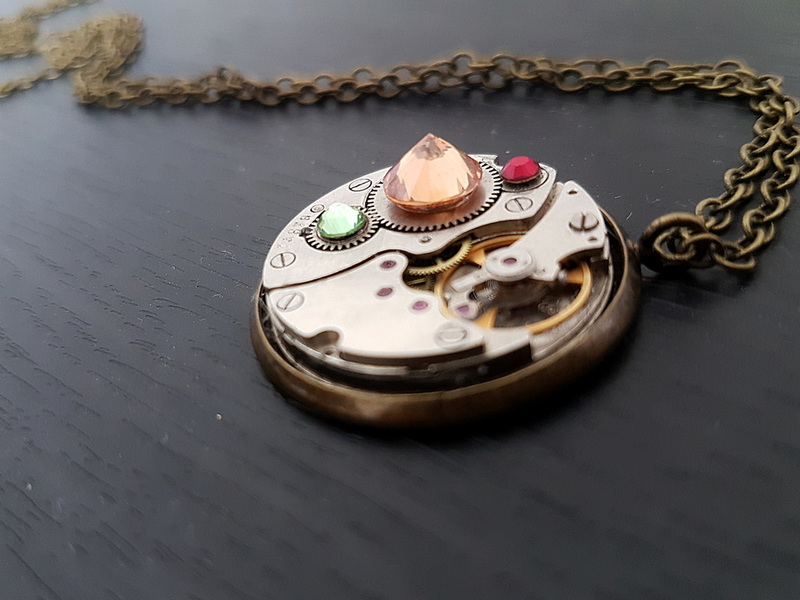 This vintage watch movement is set in a 3cm wide dark antiqued brass bezel setting, The internal cogs, gears and deep red ruby jewel pivot points are now exposed. Two stunning Austrian crystals and a Champagne Gold peaked CZ look amazing with the industrial detail. The cable chain is approx 60cm long. 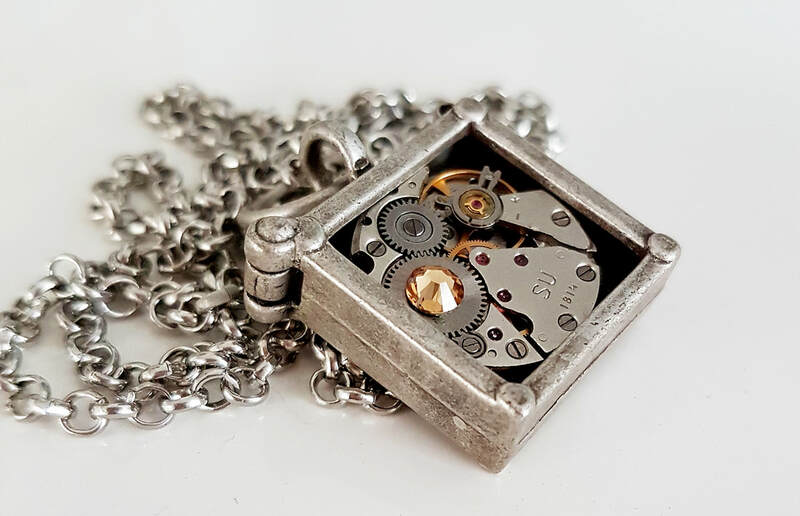 This vintage watch movement is set in a 3cm wide bright silver bezel setting, The internal cogs, gears and deep red ruby jewel pivot points are now exposed. 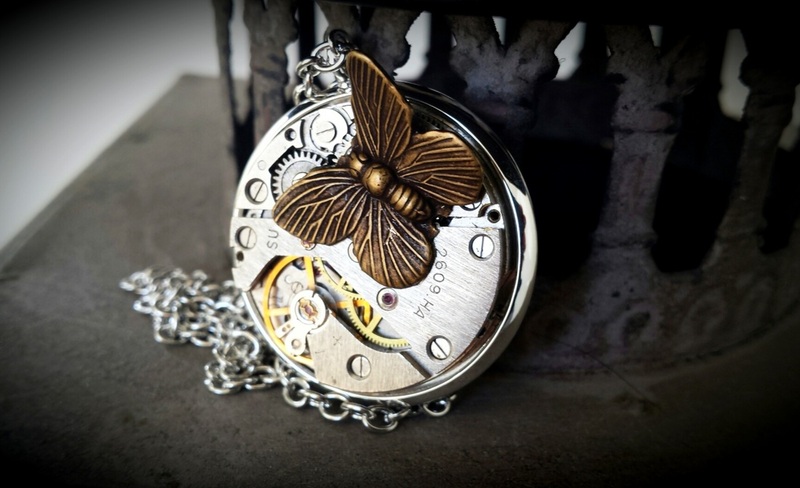 A beautifully detailed Antiqued Brass Butterfly sits ready for flight.. The cable chain is approx 60cm long. 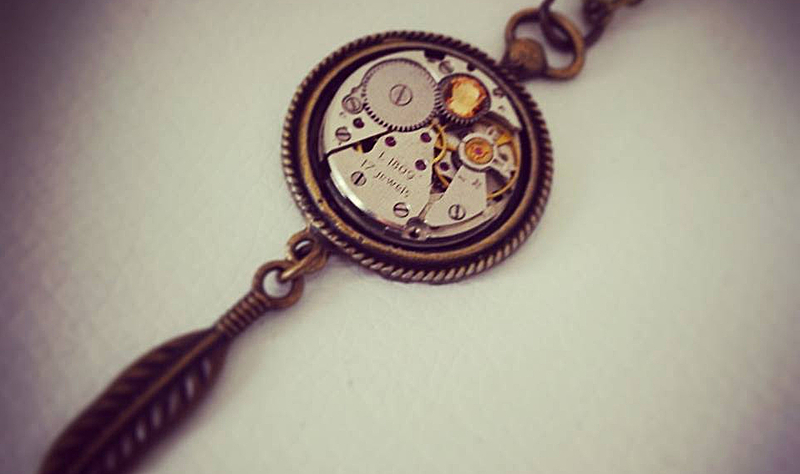 This intricate vintage watch movement is set into a 3cm wide Antiqued Brass bezel. The fascinating cogs and gears are now visible. 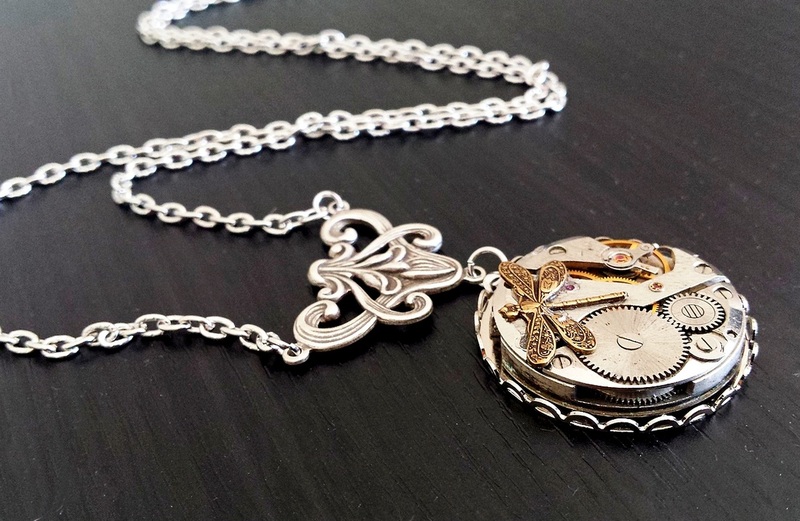 A wonderfully detailed Art Deco Dragonfly wraps himself around. The matching lead & nickle free cable chain is about 60cm, I can adjust this on request at no extra cost. Contact me if you have any questions or would like it altered in some way. 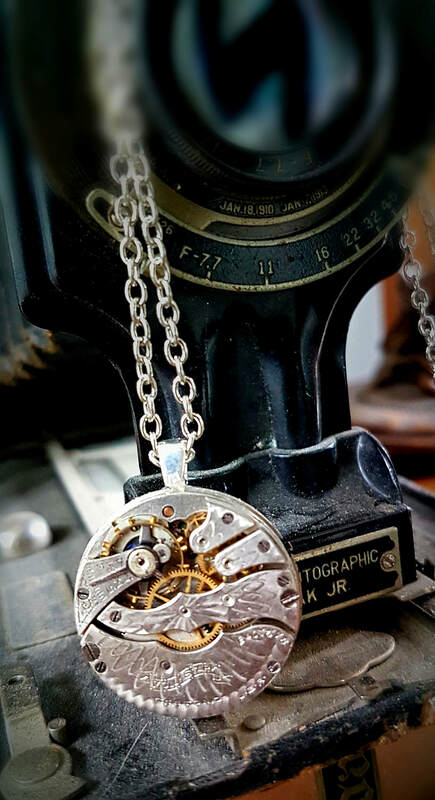 This intricate vintage watch movement is set into a 30mm chunky silver tone bezel. The fascinating cogs, gears and red ruby jewel pivot points are now exposed. 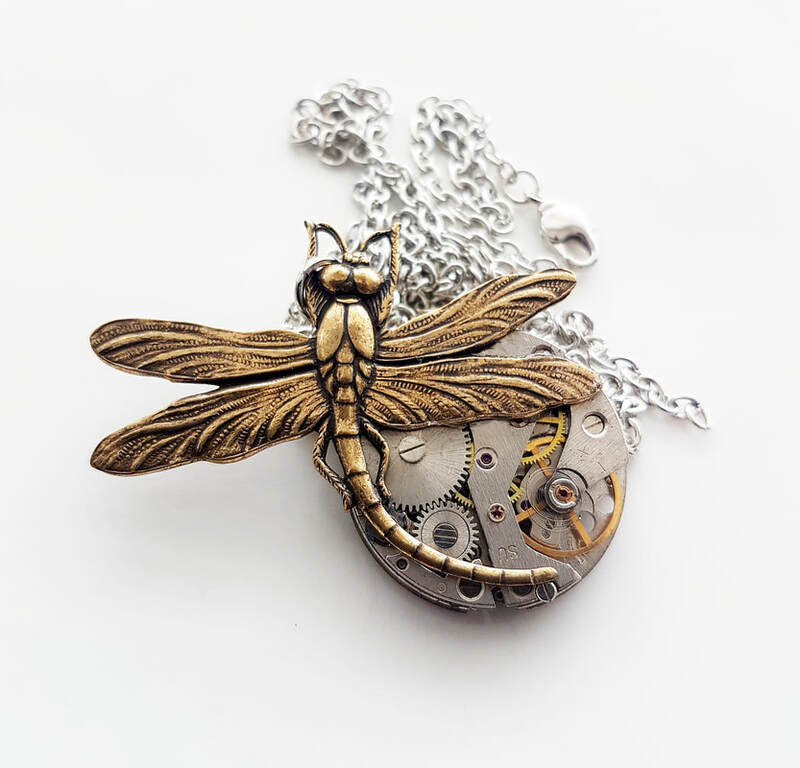 A detailed antiqued Art Deco dragonfly wraps himself around. The cable chain is about 60cm, I can adjust this on request. Contact me if you have any questions, would like a crystal added or something bespoke & unique made. 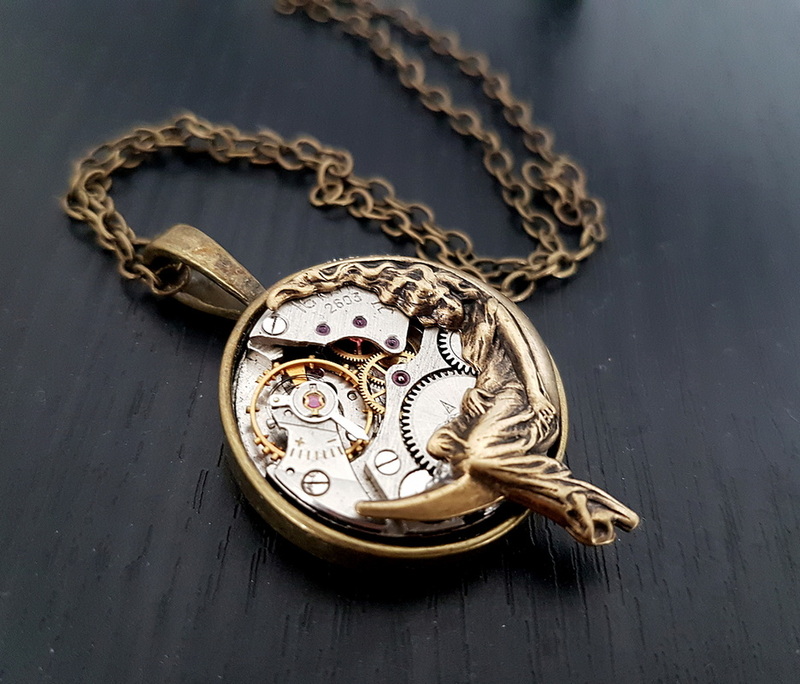 This intricate vintage watch movement is set into a 30mm antiqued brass bezel. 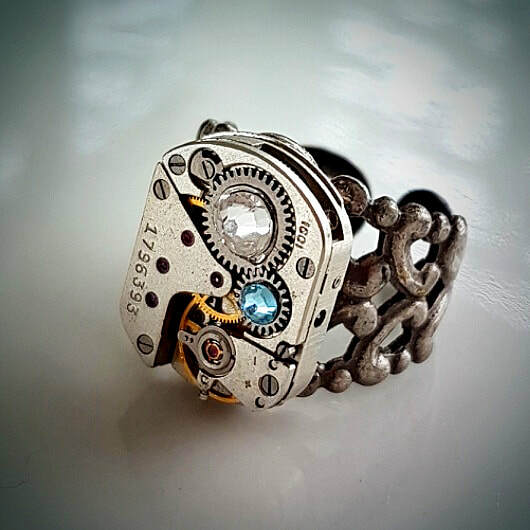 The fascinating cogs, gears and red ruby jewels are now exposed. 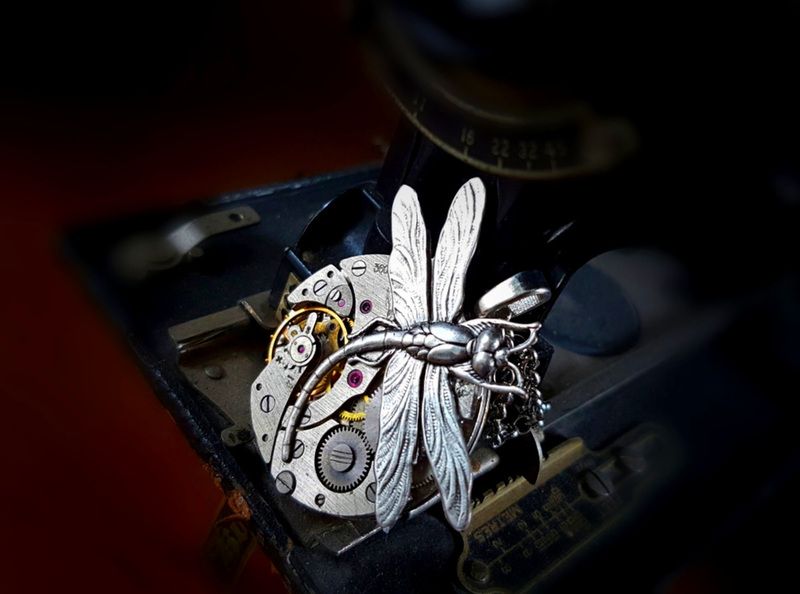 A detailed antiqued silver art deco dragonfly wraps himself around it and a genuine greige coloured Swarovski crystal. The lead and nickle free matching cable chain is about 60cm, I can adjust this on request. 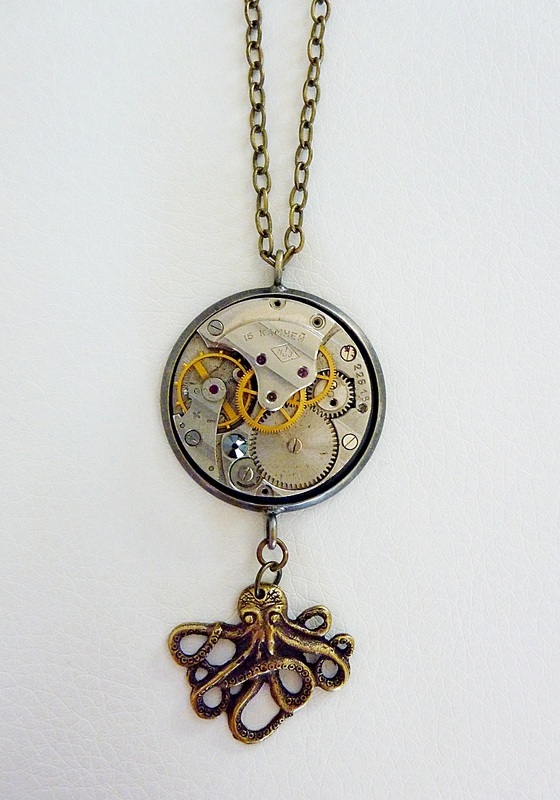 This lovely ruby jewelled movement is set in a 3cm wide lace edged antiqued brass setting. 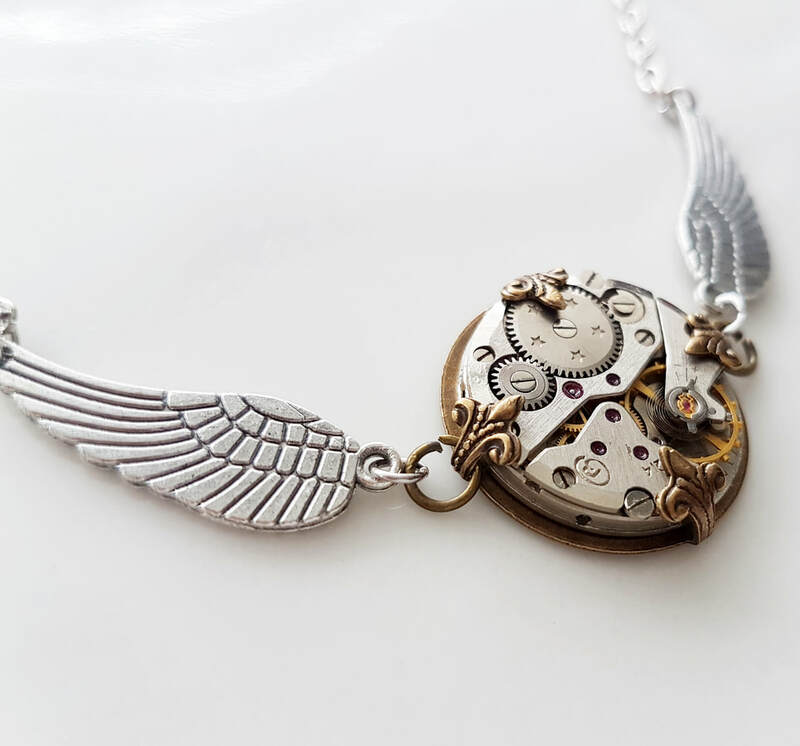 It is adorned with a gorgeous golden Austrian crystal and a detailed wing swings below. The matching lead & nickle free chain is about 60cm long. Length adjusted on request, leave instruction at checkout or contact me with any questions. 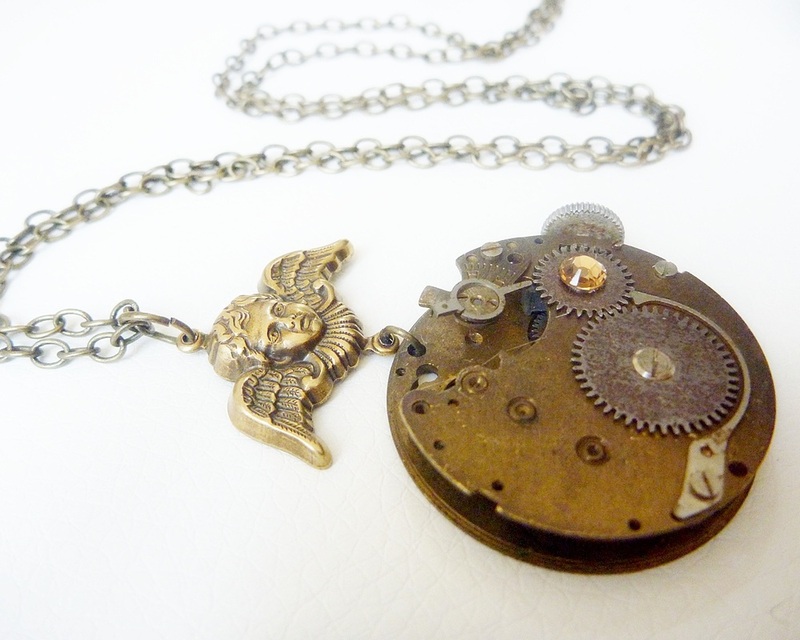 This funky wee vintage jeweled watch movement looks gorgeous with the detail angel wing swinging below. 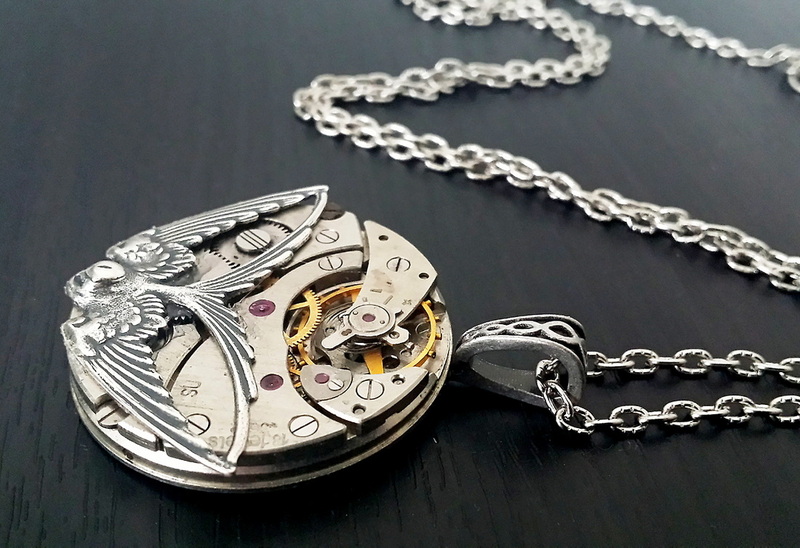 The movement is about 22mm wide and the total drop of the pendant including the top loop and wing is approx 6cm. I have strung it from 60cm of cable chain. leave instruction at checkout if you would like this length altered. 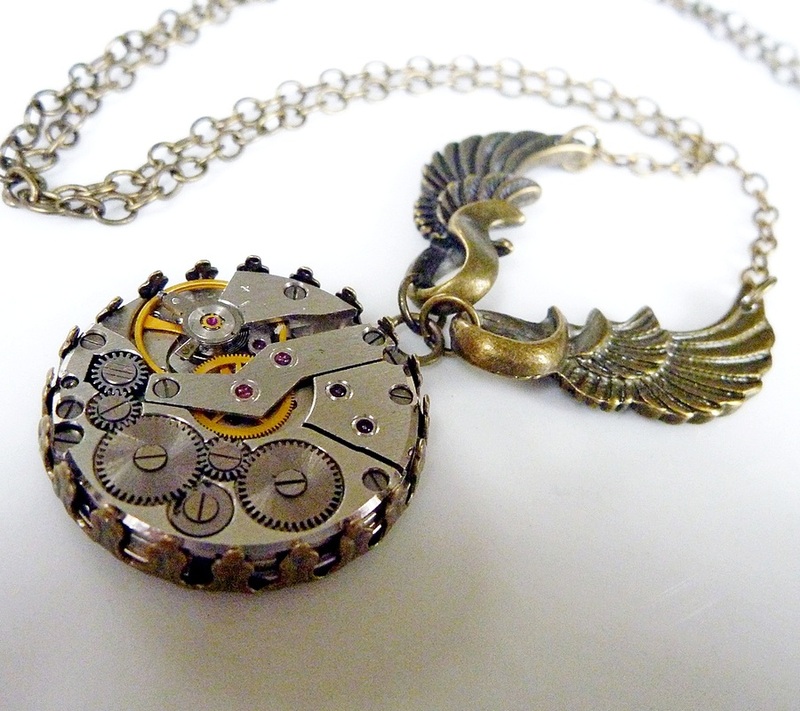 This is a fabulous vintage watch movement is full of cogs, gears and deep red industrial ruby jewels. 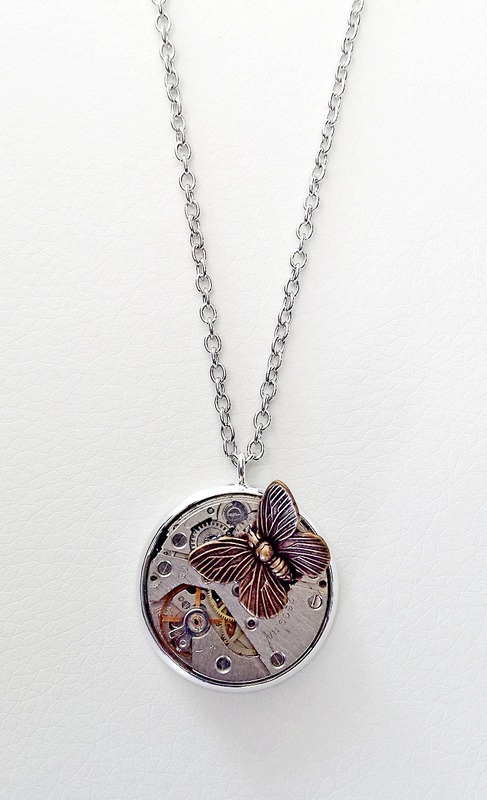 It is now recessed into a 30mm wide antiqued brass bezel and adorned with two stunning Austrian Swarovski Crystals. 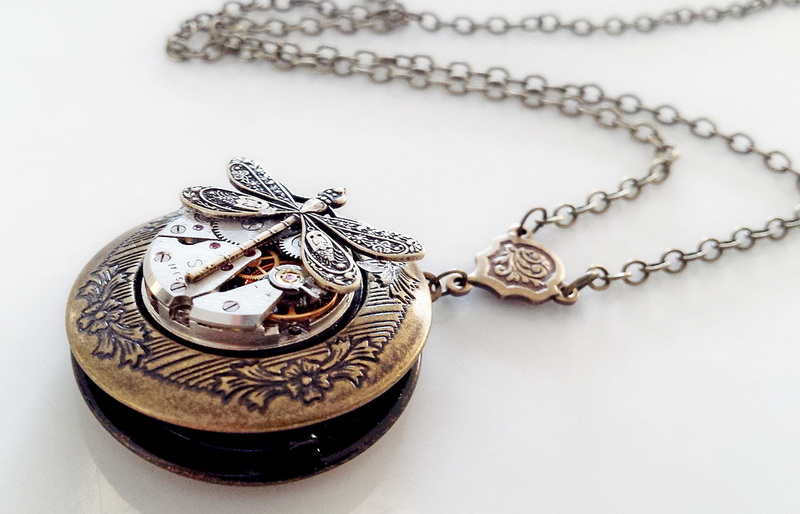 Swinging below is a wonderfully detailed antiqued dragonfly. This is all strung on about 60cm of matching lead and nickle free chain. This length can be altered on request. Just leave me a message at checkout or contact me. 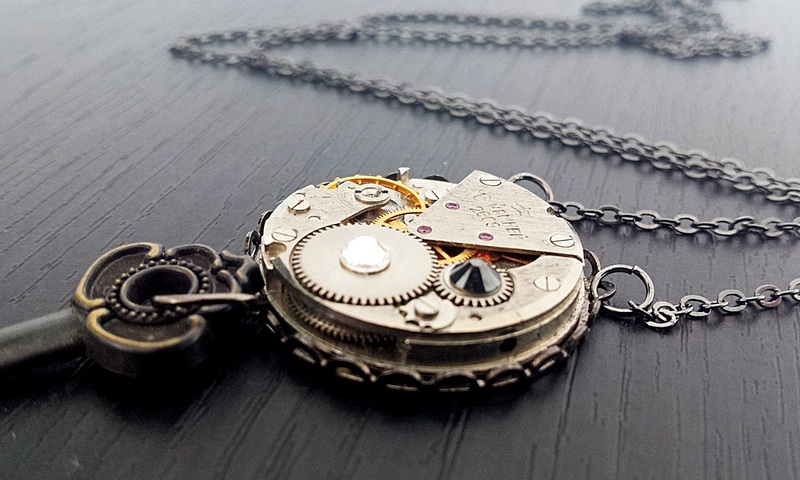 This vintage watch movement exposes cogs, gears and industrial red ruby jewels. 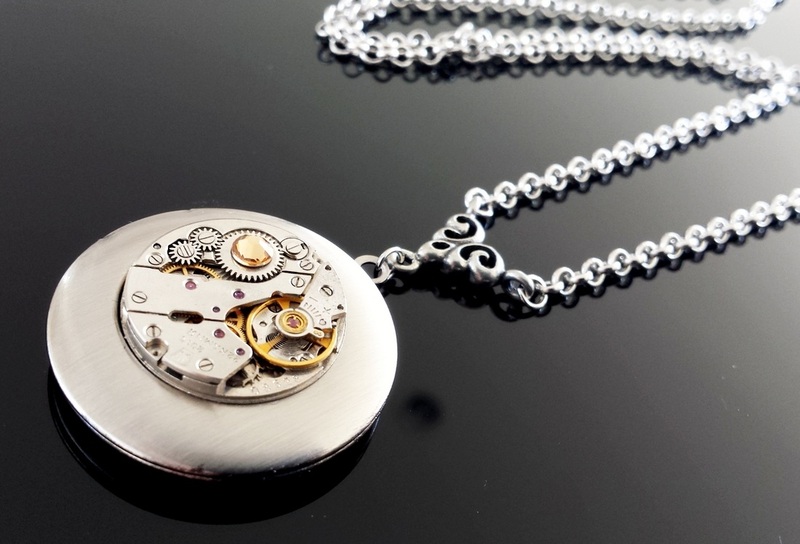 It is recessed into a 3cm wide lace edged gunmetal bezel. 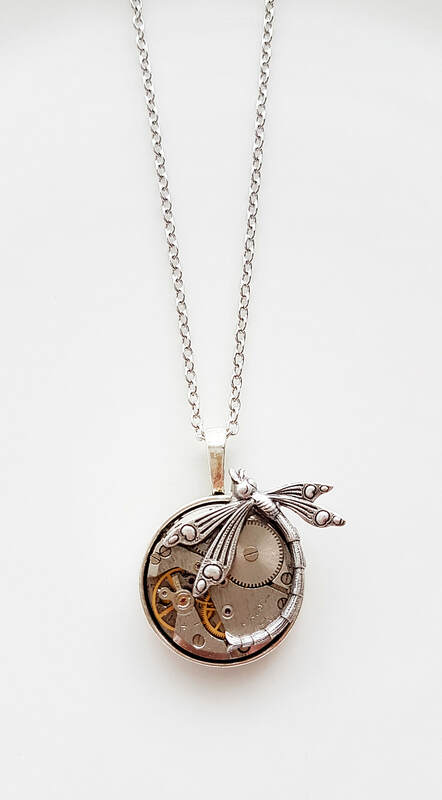 The matching Swarovski crystal, detailed wing and 60cm cable chain make for a gorgeous unique piece. Leave instruction if you would like this length altered. Contact me if you have any questions, custom orders welcome. 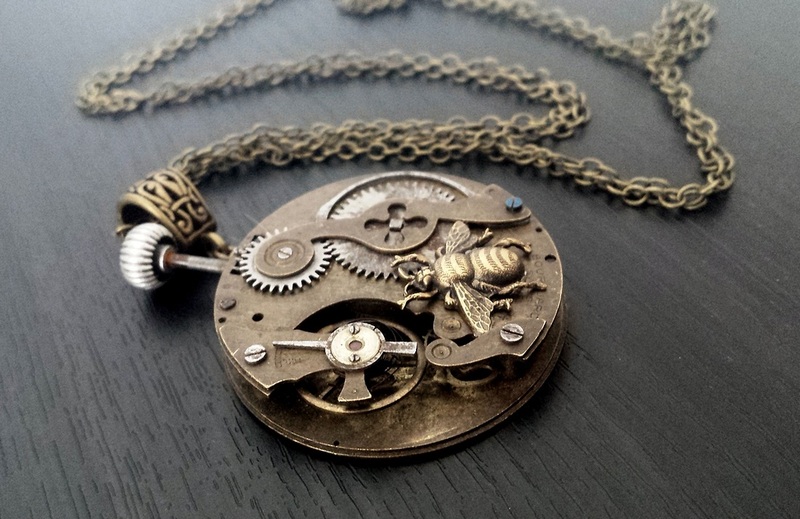 This vintage watch movement sits enclosed within a 25mm wide detailed antiqued brass setting. 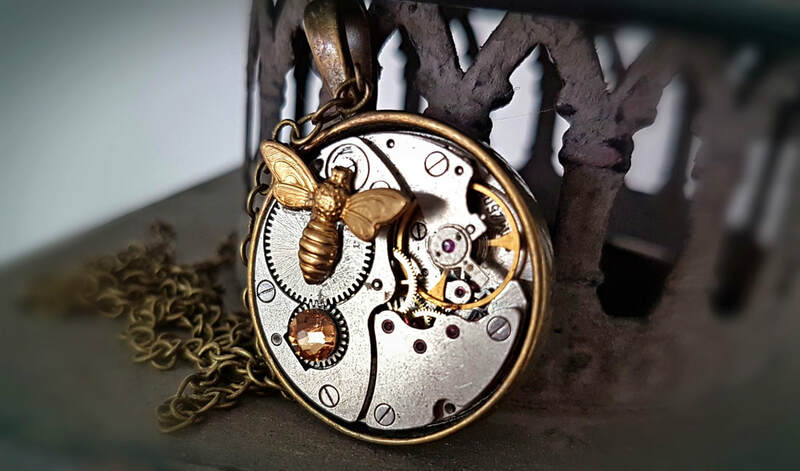 I have tucked a stunning Golden crystal in amongst the cogs, gears and deep red ruby jewels. 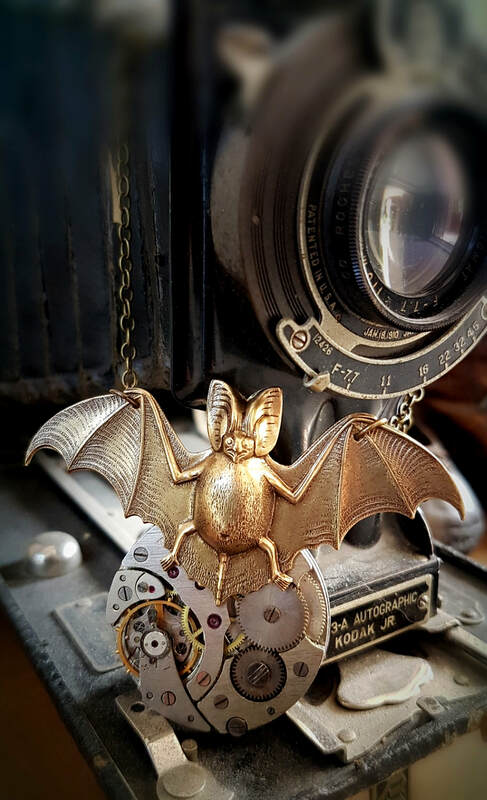 It hangs from a gorgeous filigree connector and about 60cm of lead & nickle free antiqued brass cable chain. Leave instruction if you would like this length altered. Contact me if you have any questions, custom orders welcomed. 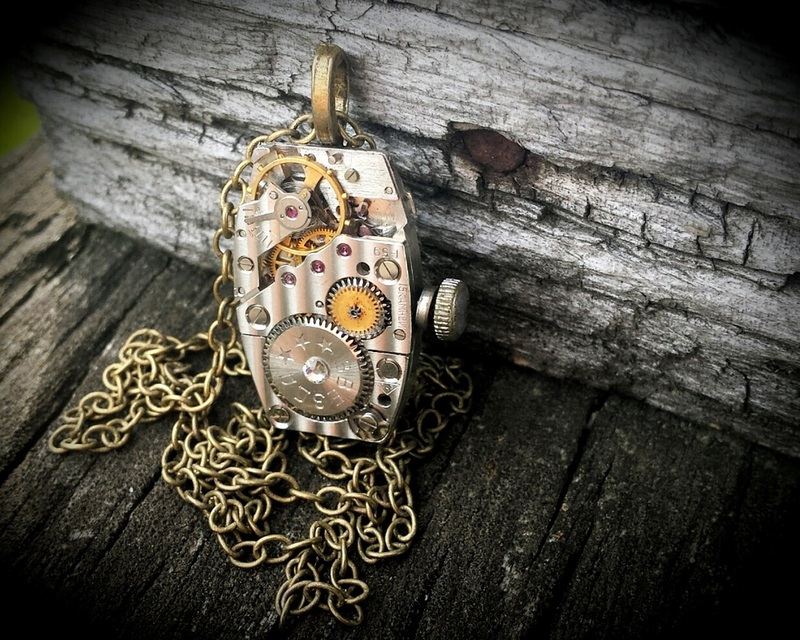 This vintage watch movement now exposes its cogs, gears and various red ruby jewel pivot points. 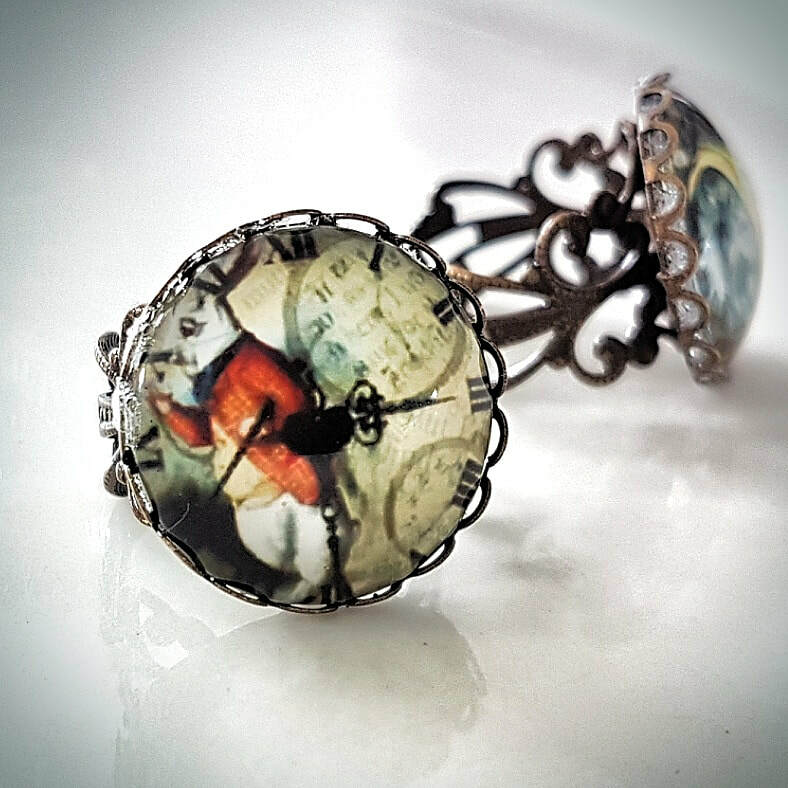 I have recessed it into an 3cm wide Silver tone Setting and adorned it with a gorgeous greige Swarovski crystal and an Antiqued Silver Ladybug. Strung from about 60cm of matching nickel and lead free cable chain. Leave a message at checkout if you would like this length altered. 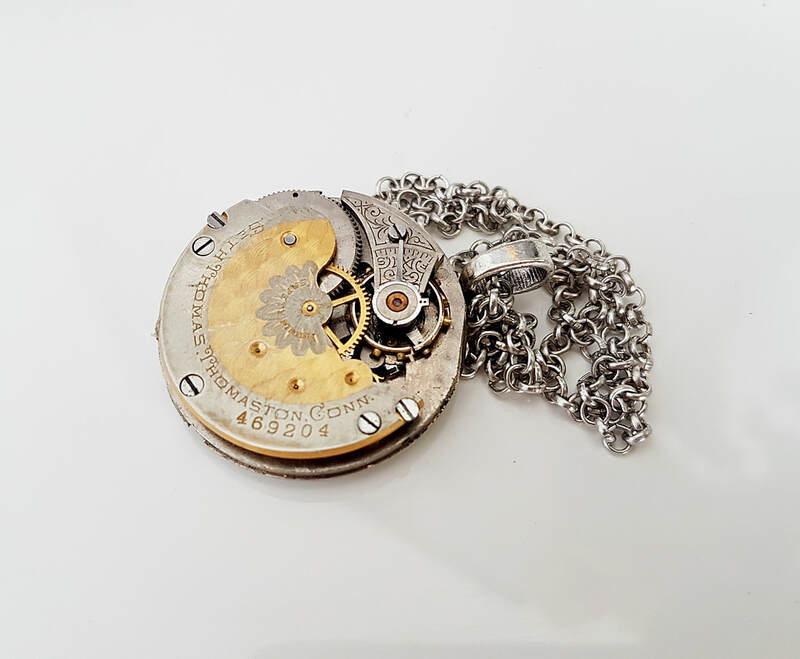 This fabulous vintage mechanical watch movement is recessed into a 28mm wide antiqued loop framed bezel. 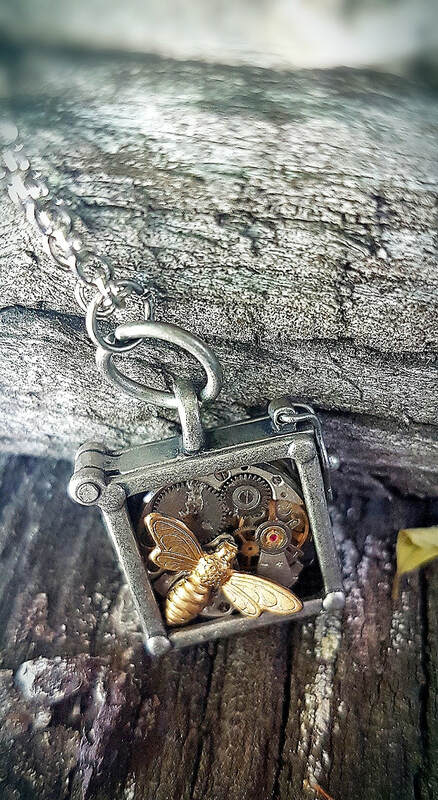 I have adorned it with a gorgeous wee metallic Swarovski crystal and hung a cute key stamping from the bottom. Strung from about 70cm of dark silver tone cable Chain. 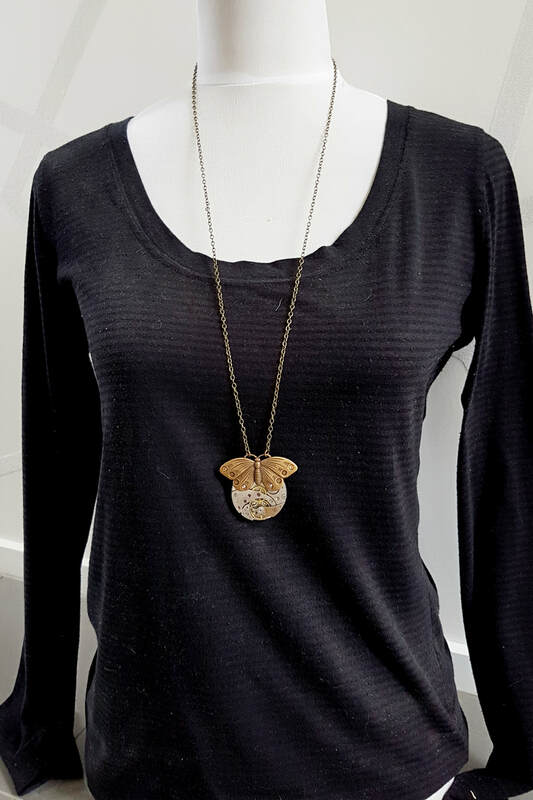 A unique statement piece that will attract attention. Contact me if you have any questions or want something altered. 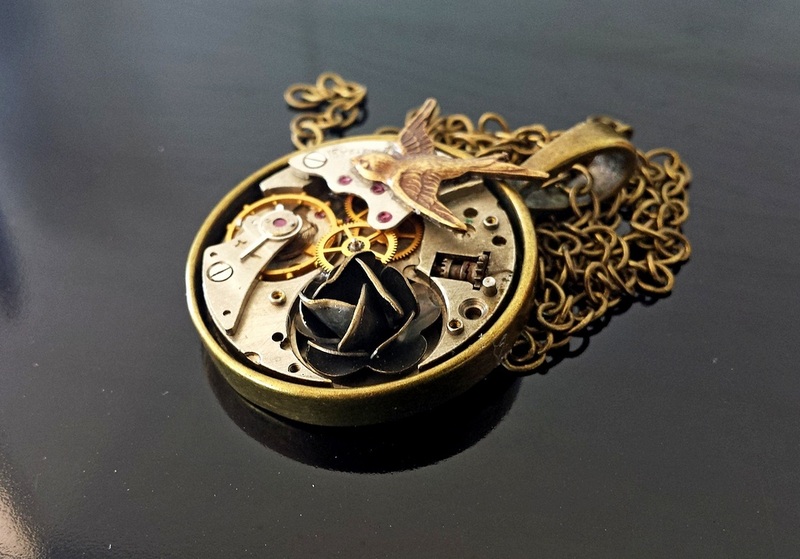 This funky ruby jewelled watch movement is set in a 3cm wide gunmetal black lace edged setting. 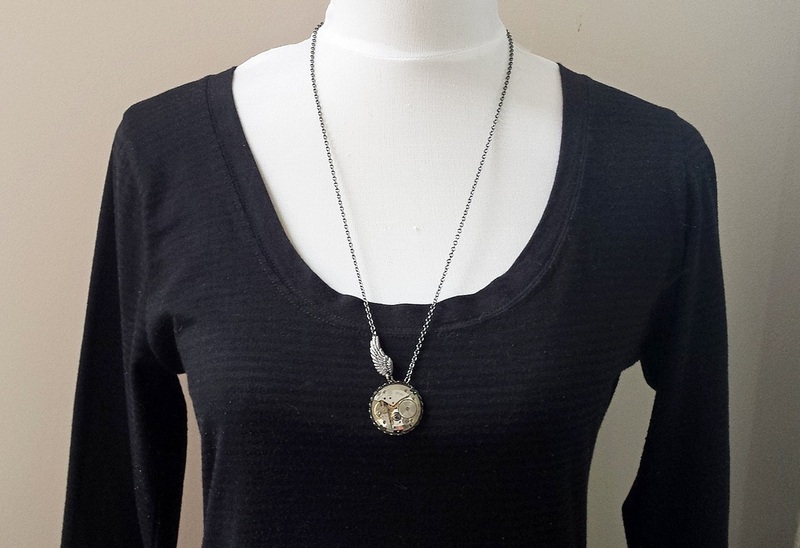 A stunning metalic black and clear Swarovski crystal adds a bit of bling. 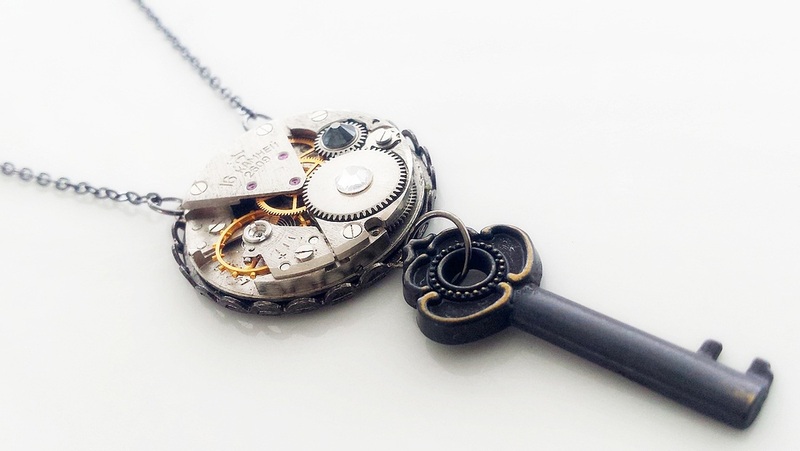 The antiqued black key that swings below makes this a piece to spark conversation. 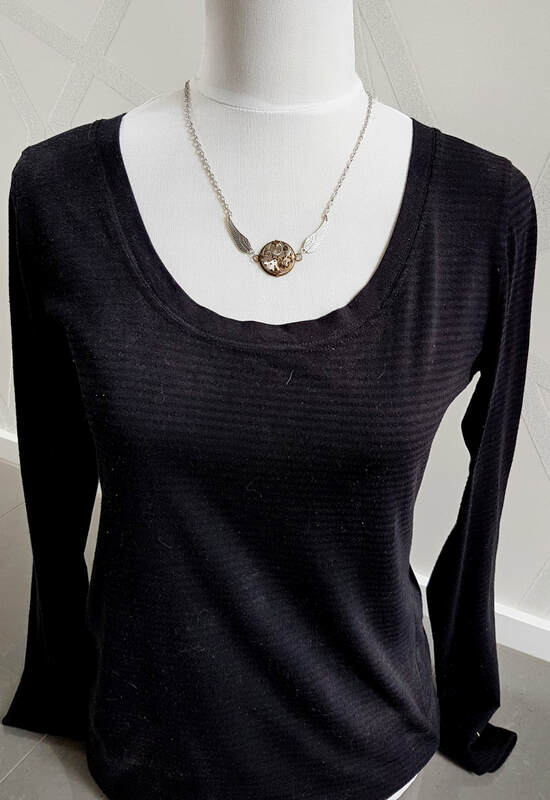 The gorgeous matching gunmetal black cable chain is about 80cm long. I can make shorten the chain to a different length on request. 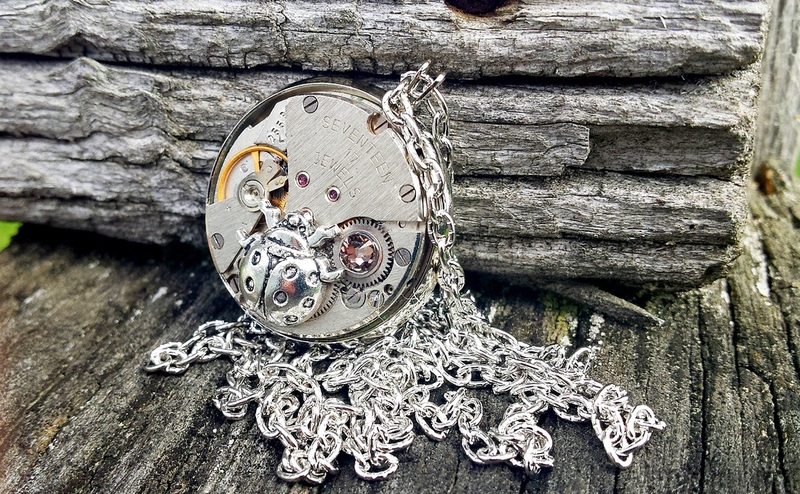 This vintage watch movement now exposes its cogs, gears and a red ruby jewel pivot point. 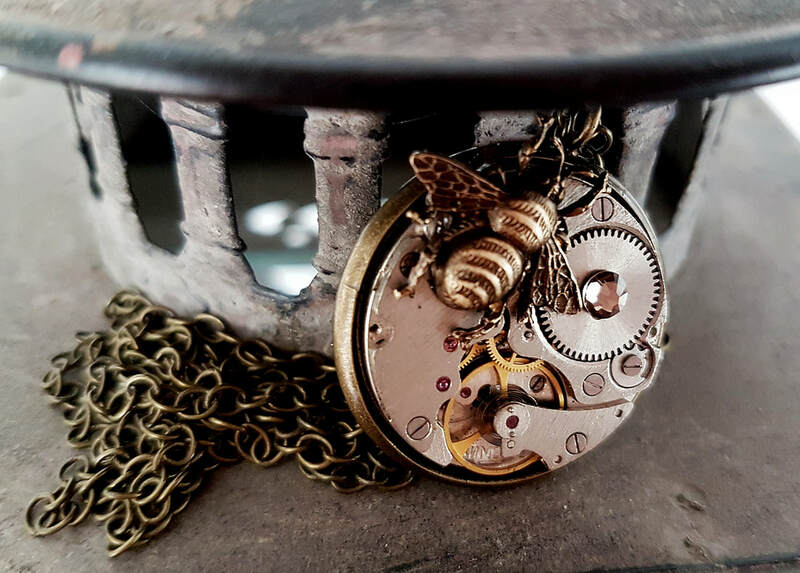 I have recessed it into an 3cm wide Setting and adorned it with a gorgeous detailed Antiqued Brass Bumble Bee and a small Swarovski Crystal. Strung from about 60cm of matching cable chain. 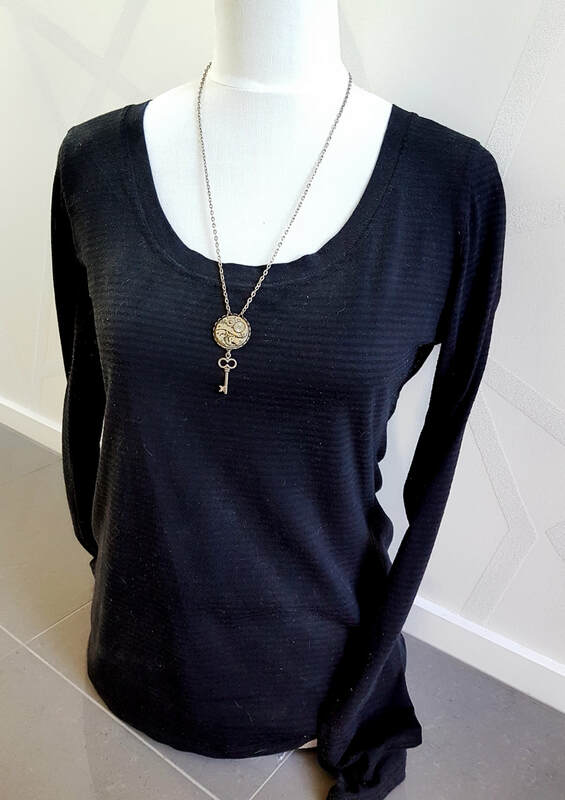 Leave a message at checkout if you would like this chain length altered. Contact me if you have any questions. 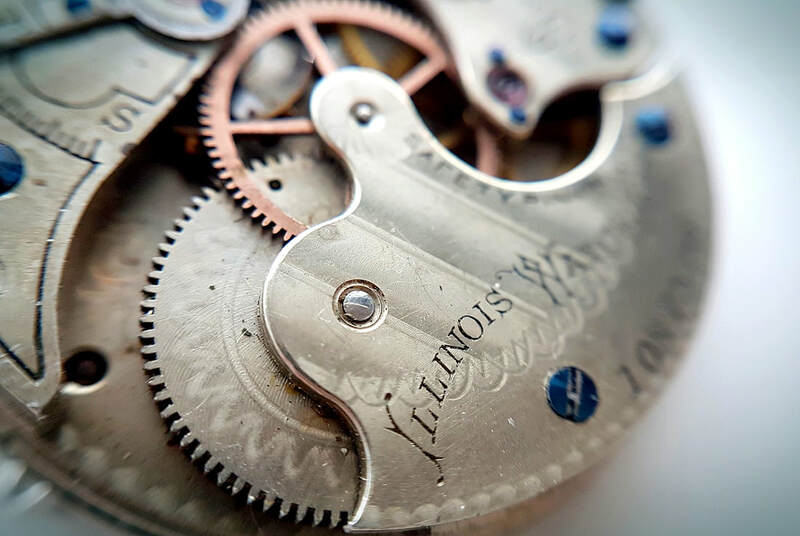 This vintage watch movement now exposed its cogs, gears and various red ruby jewel pivot points. 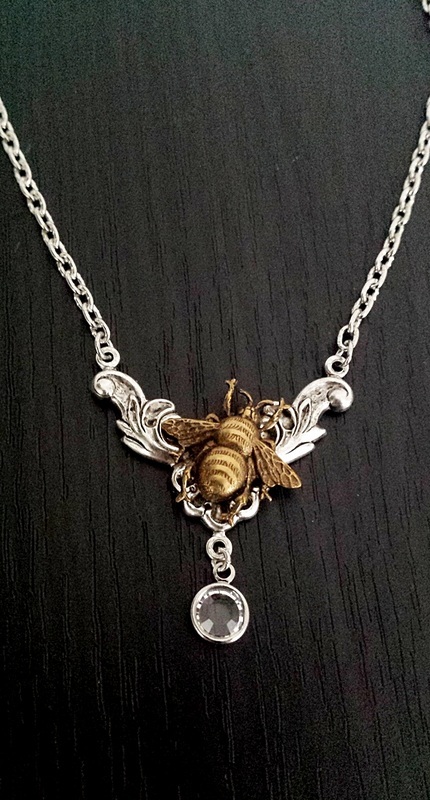 I have recessed it into an 3cm wide Silver Setting and adorned it with a gorgeous detailed Antiqued Silver Bumble Bee & clear Austrian crystal. Strung from about 60cm of antiqued silver cable chain. 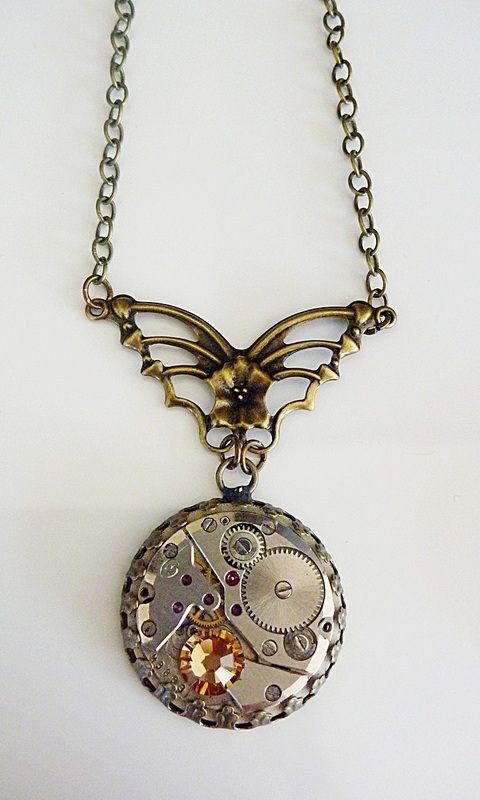 Contact me if you would like this with an Antiqued Brass setting and chain. 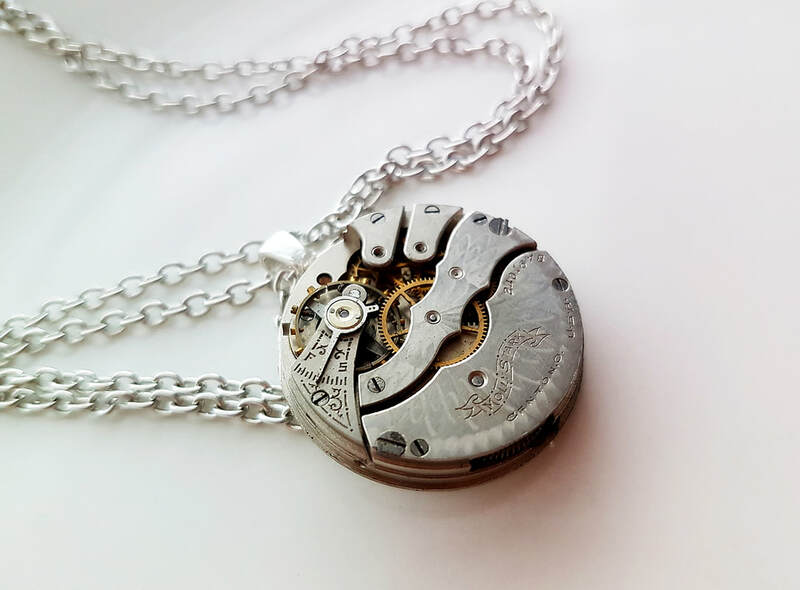 This Vintage watch movement with its cog, gears and ruby jewels now exposed, is recessed into a lace edged antiqued silver setting. 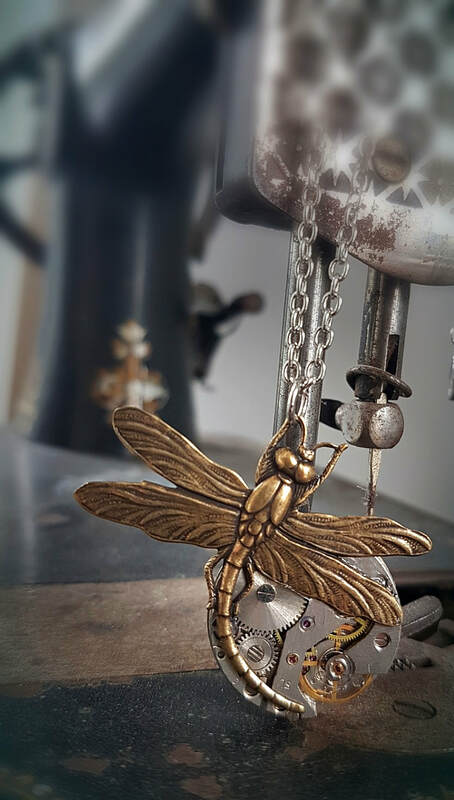 A stunningly detailed darkened Brass Dragonfly sits across the face and it all hangs from a gorgeous scrolled antiqued connector. Strung from approx 60cm of cable chain. Leave instruction at checkout if you want this length altered. 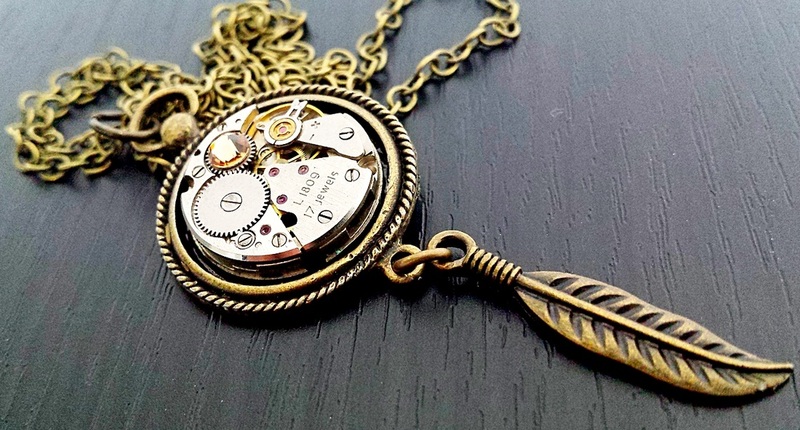 This Vintage watch movement now has its cog, gears and ruby jewels exposed. It is layered onto a flat 25mm wide setting. 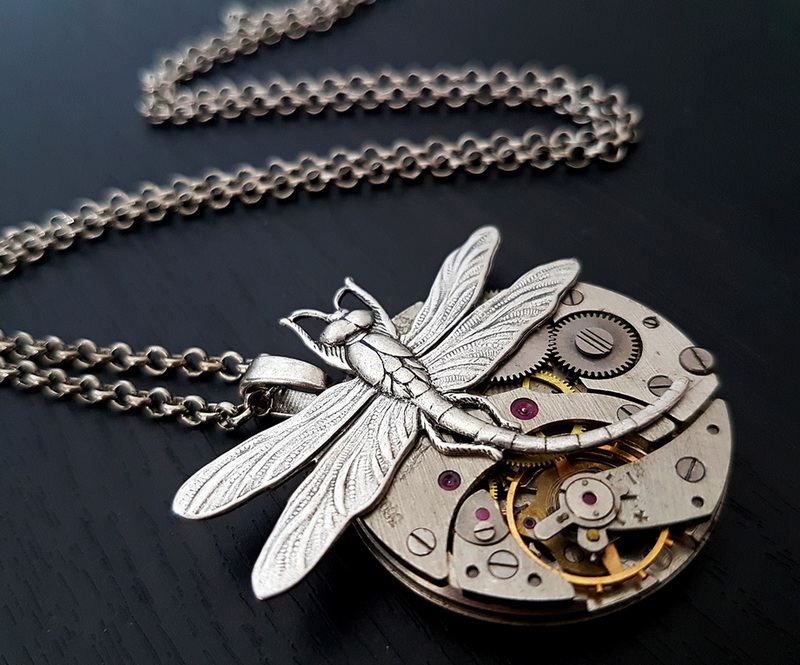 A stunningly detailed darkened Dragonfly sits across the face and it all hangs from a gorgeous scrolled antiqued connector. Strung from approx 60cm of cable chain. Leave instruction at checkout if you want this length altered. 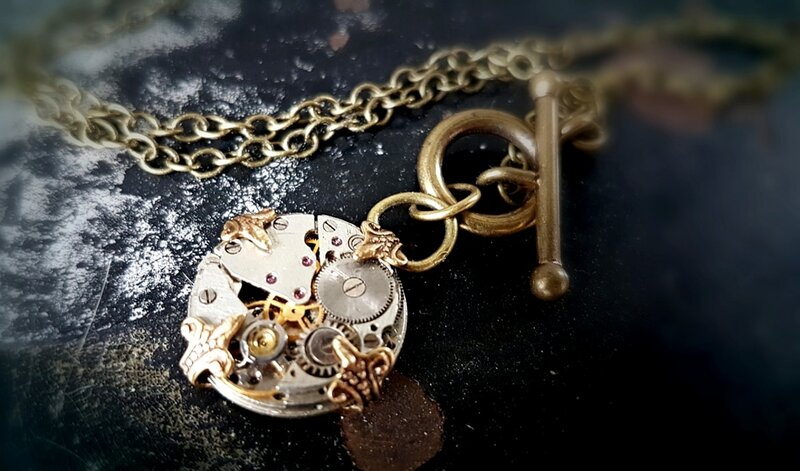 This gorgeous wee vintage watch movement now shows off its intricate cogs, gears and red ruby jewels. I have recessed it into a 3cm wide antiqued style setting with a copper and brass tangle from the bottom. The total drop is about 7cm. The matching lead & nickel free chain is 60cm long. If you want a different length chain, just leave me a message at checkout or contact me. 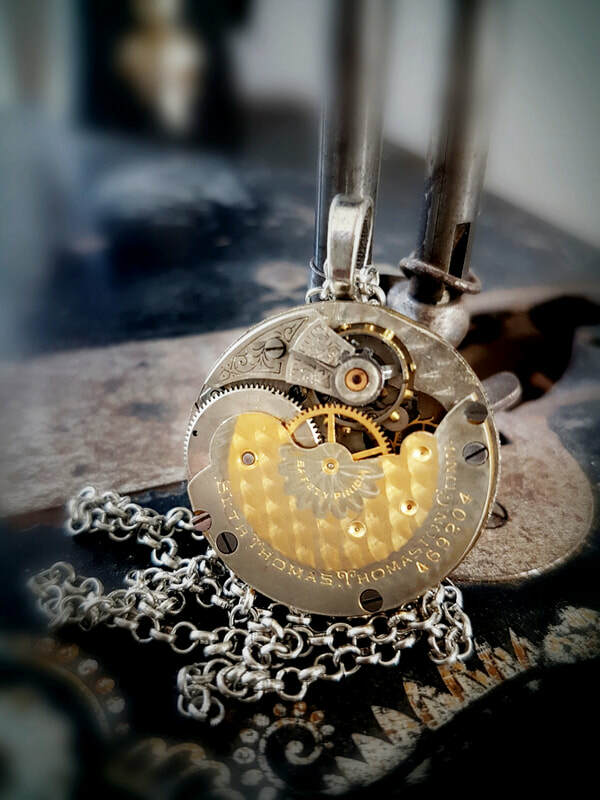 This gorgeous wee vintage watch movement now shows off its intricate cogs, gears and industrial red ruby jewel pivot points. 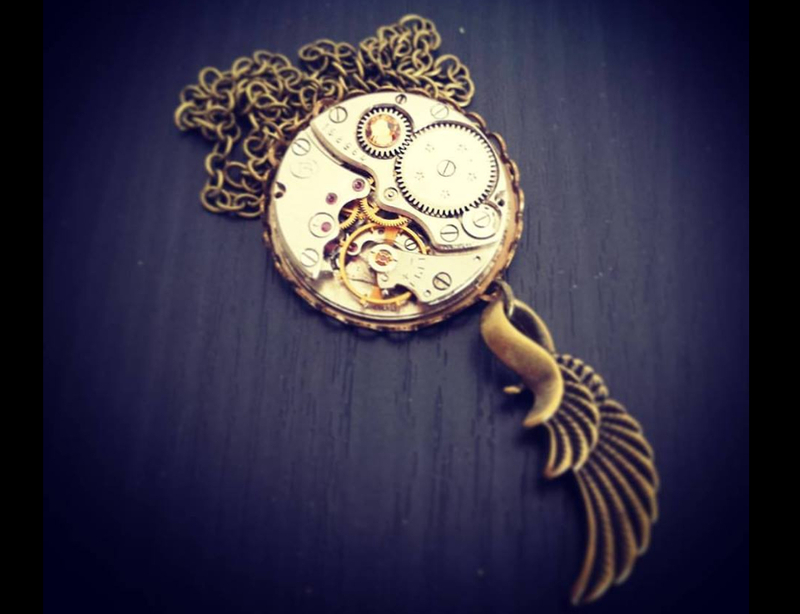 I have recessed it into a 2.5cm wide antiqued fob style setting with a wee golden Swarovski crystal and a stunning detailed feather swinging below. The total drop is about 6.5cm. The matching lead & nickel free chain is 60cm long. If you want a different length chain, just leave me a message at checkout or contact me. 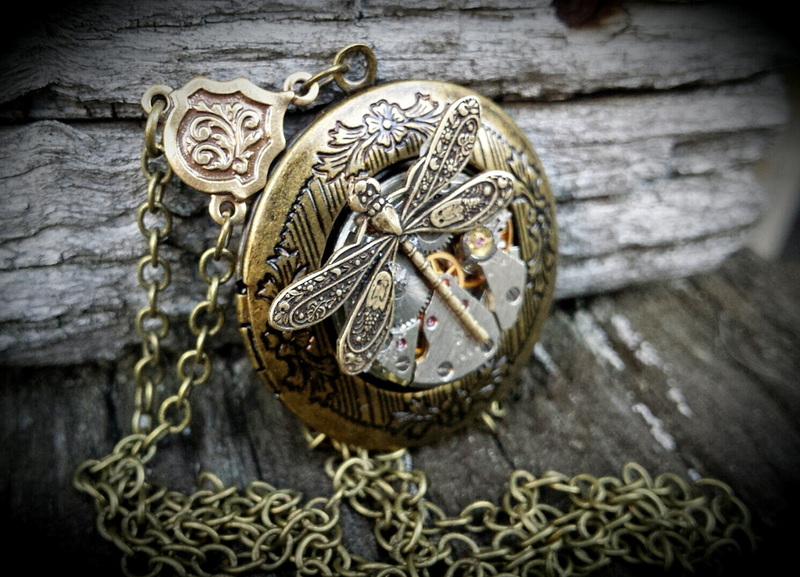 I have surrounded this funky vintage watch movement with chain and recessed it into a 33mm wide antiqued brass setting. The fascinating internal workings and various deep red industrial rubies are now visible. The "Geneva Waves" give a shimmery ripple effect even though smooth. Three gorgeous Swarovski Crystals add a hint of bling. The matching lead and nickel free chain is about 60cm long. Contact me if you need this length altered. 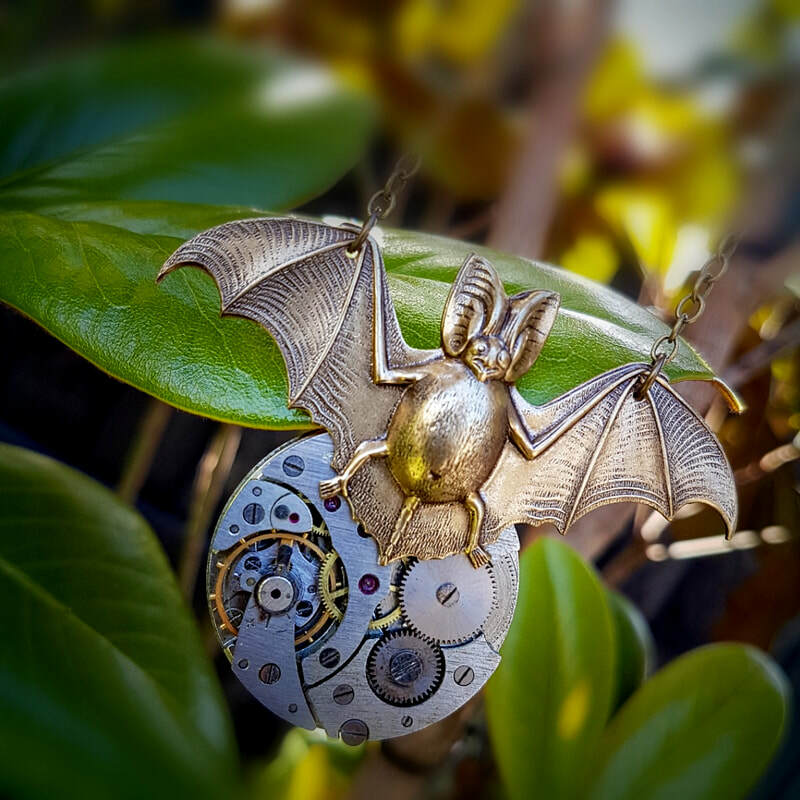 Each Steampunk Inspired piece I create will be Unique in some way. 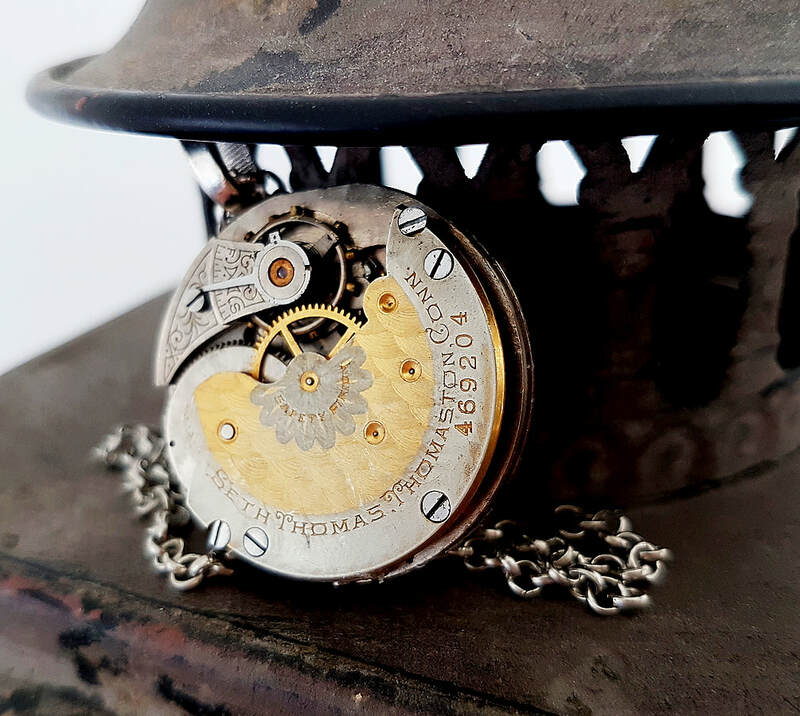 This funky vintage mans watch movement is set into a 3cm wide darkened brass bezel. 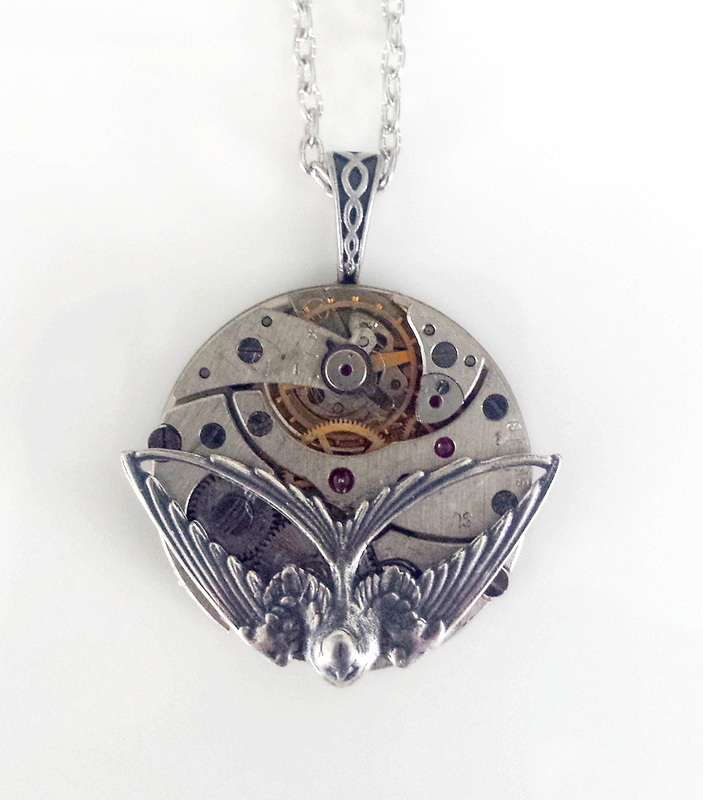 The fascinating cogs, gears and industrial red rubies are now exposed. Two swooping birds add to its unique intrigue. The matching nickel and lead free chain is about 60cm but I can adjust this length on request. Leave a message at checkout or contact me. 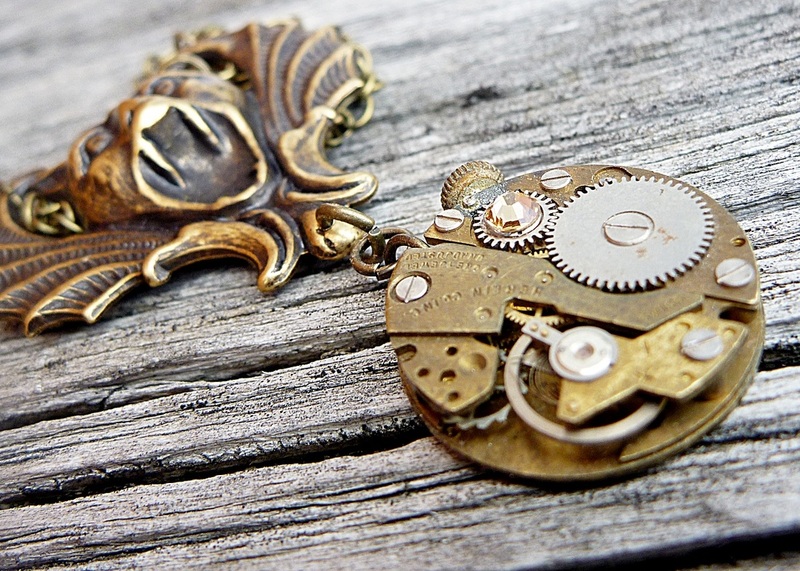 This intricate vintage watch movement is set into a 3cm wide antiqued brass bezel. 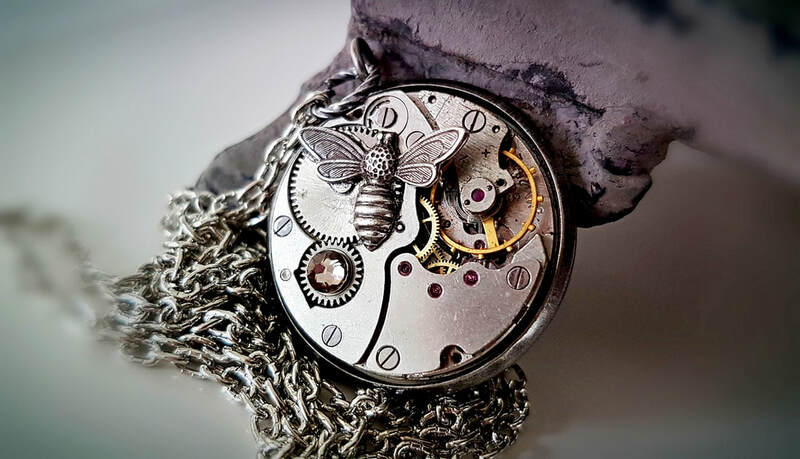 The fascinating cogs and industrial ruby jewel pivot points are now exposed. 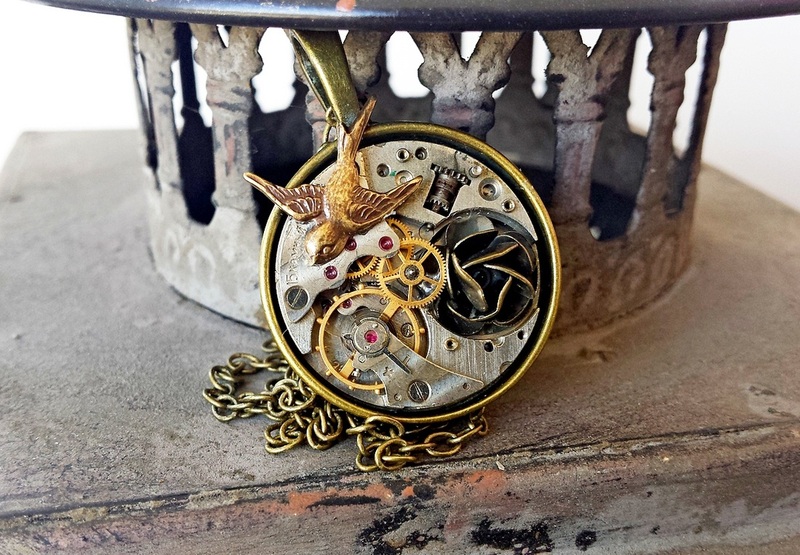 A lovely antiqued brass rose and a detailed wee swallow also adorn the face. The matching nickel and lead free chain is about 60cm but I can adjust this length on request. 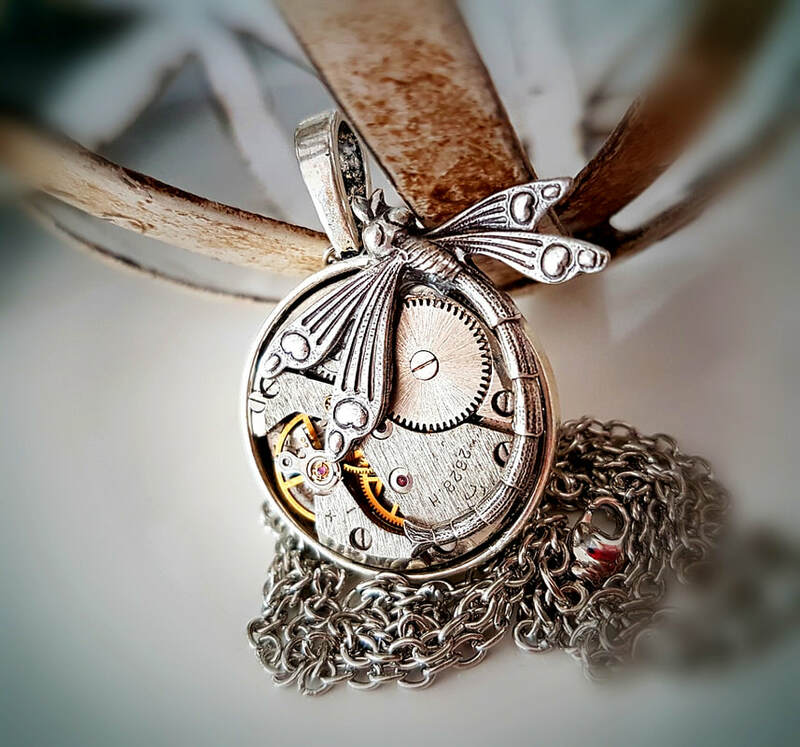 This repurposed altered art pendant is a piece of history frozen in time. Please contact me if you have any questions or would like something custom made. 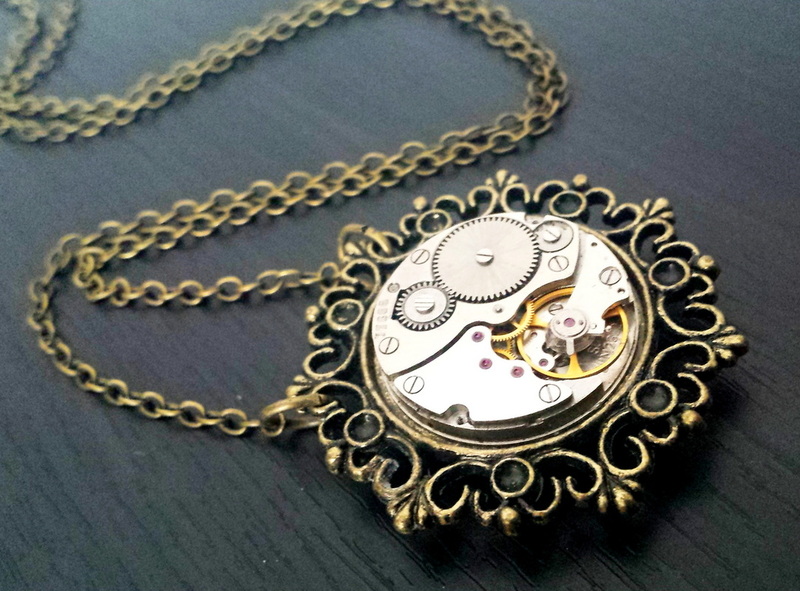 This intricate vintage watch movement is set into a 3cm wide darkened brass bezel. 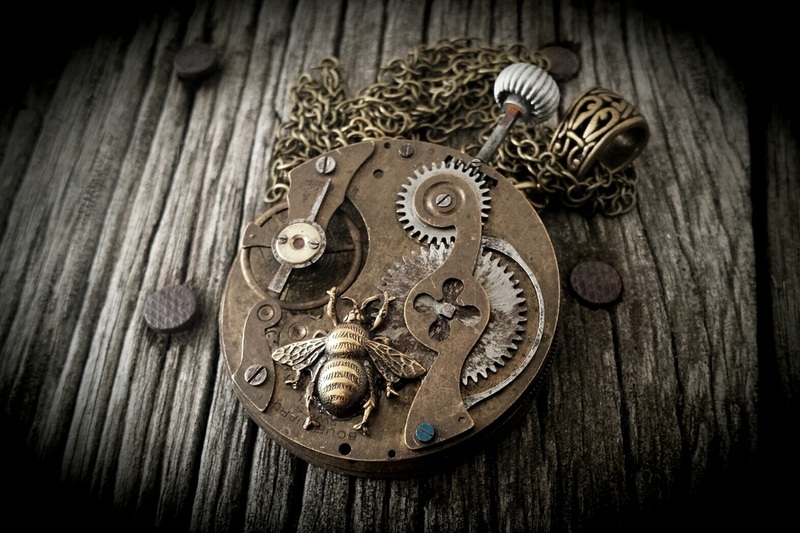 The fascinating cogs, gears and industrial ruby jewel pivot points are now exposed. 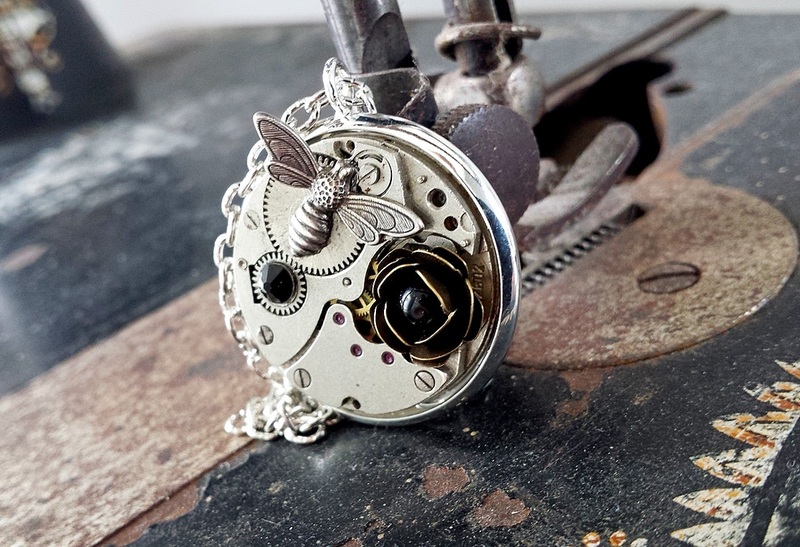 A lovely dark metal rose holds a small glass pearl and a detailed Dragonfly adorn the face. The matching nickel and lead free chain is about 60cm but I can adjust this length on request. 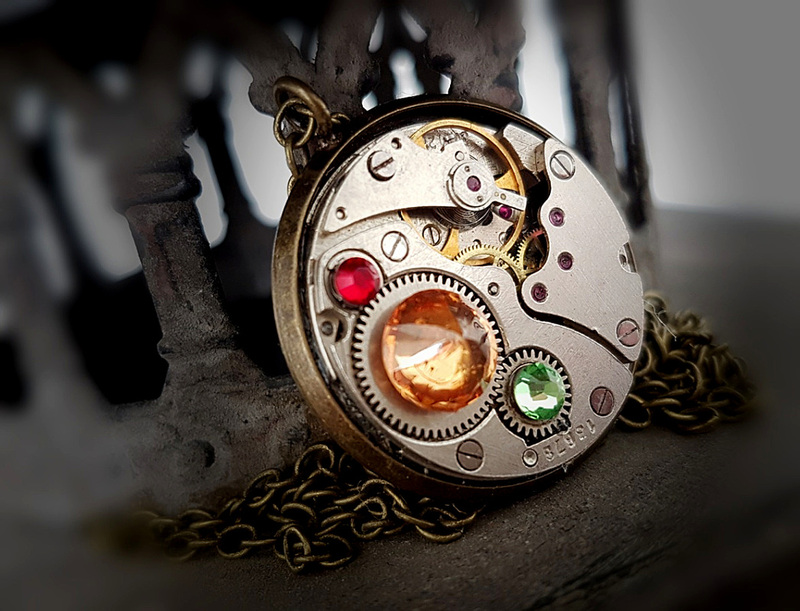 This fascinating jewelled vintage watch movement now has its cogs, gears and deep red ruby jewel pivot points on display. 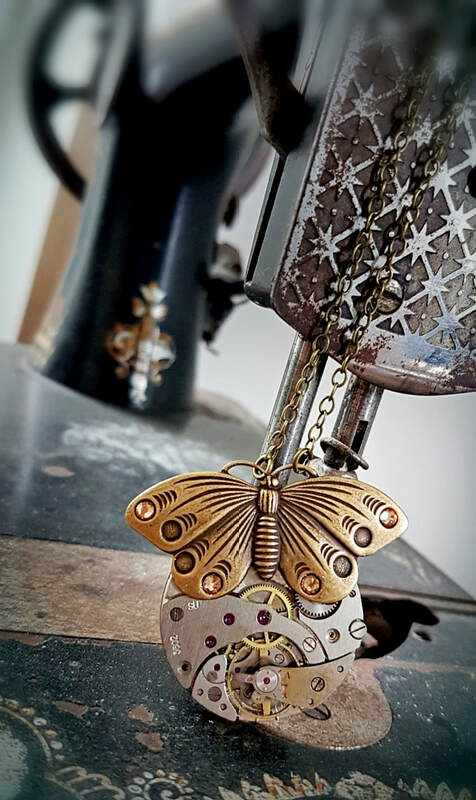 I have set it into a funky antiqued brass, lace edged setting and added a detailed key dangle and sparkly topaz & clear Austrian Swarovski crystals. The setting is about 3cm wide and the entire pendant hangs at about 6.5cm long. The matching lead and nickel free chain is approx 60cm long. Contact me if you want this length altered. 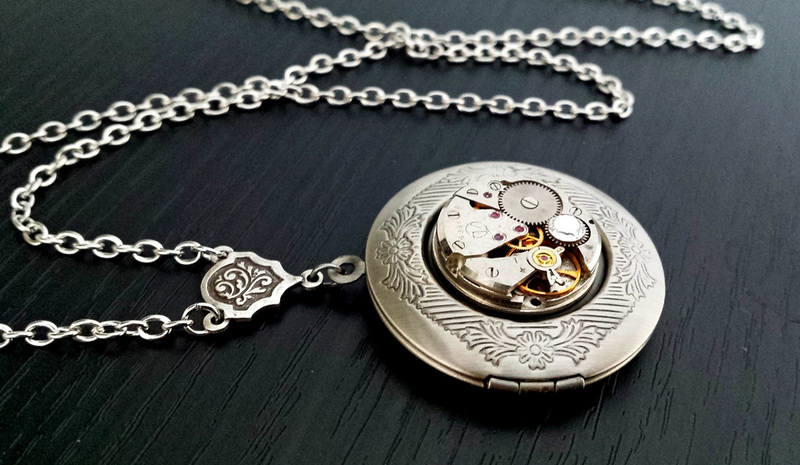 This intricate vintage watch movement is set into a 3cm lace edged bezel. 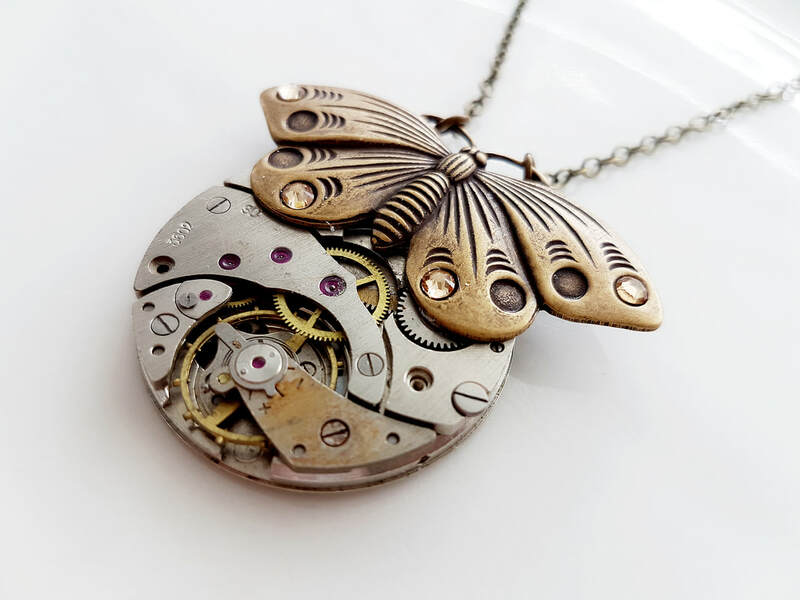 The fascinating cogs and industrial ruby jewel pivot points are now exposed. 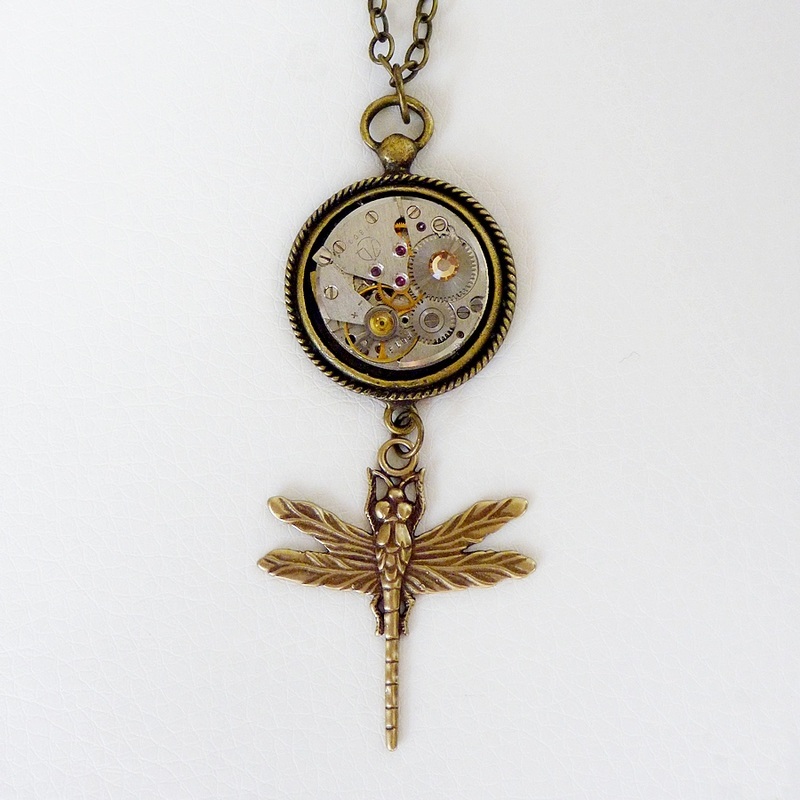 A funky antiqued brass Dragonfly swings below. The matching lead & nickle free chain is about 60cm, but I can adjust this length on request. 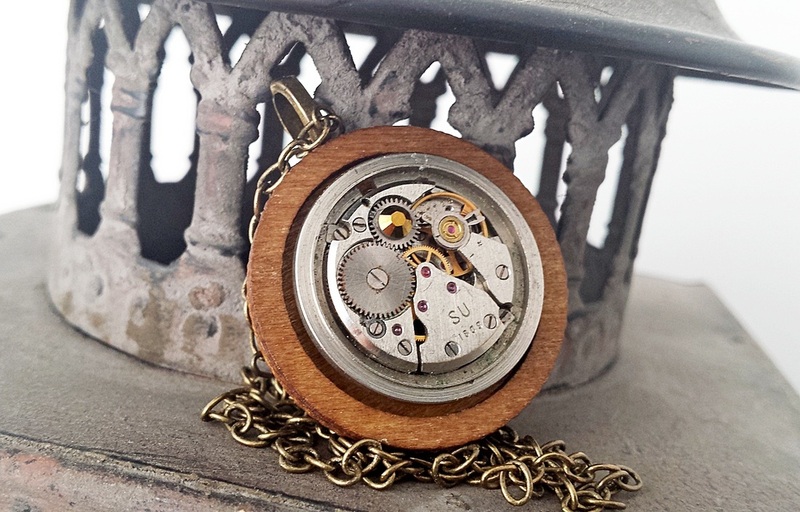 This 2.5cm wide vintage watch movement is recessed into a lace edged Antiqued Brass Setting. Two Swarovski crystals are affixed to the face and the larger red one brings out the red in the industrial ruby jewels. 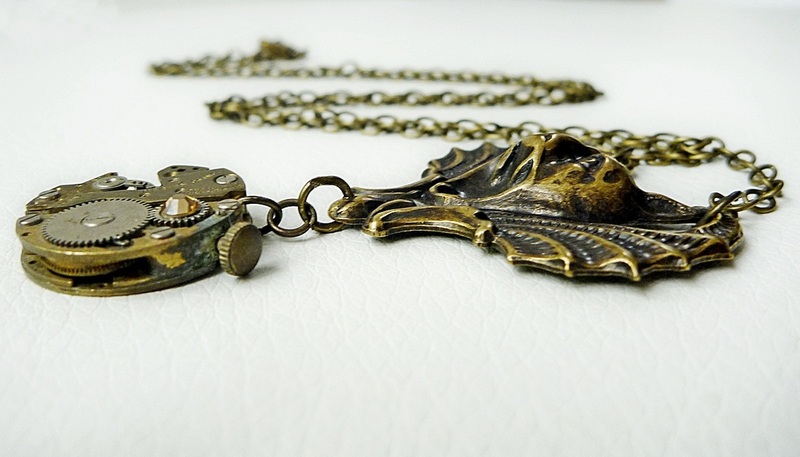 It hangs from about 60cm of antiqued brass chain with a beautifully detailed butterfly attached between. 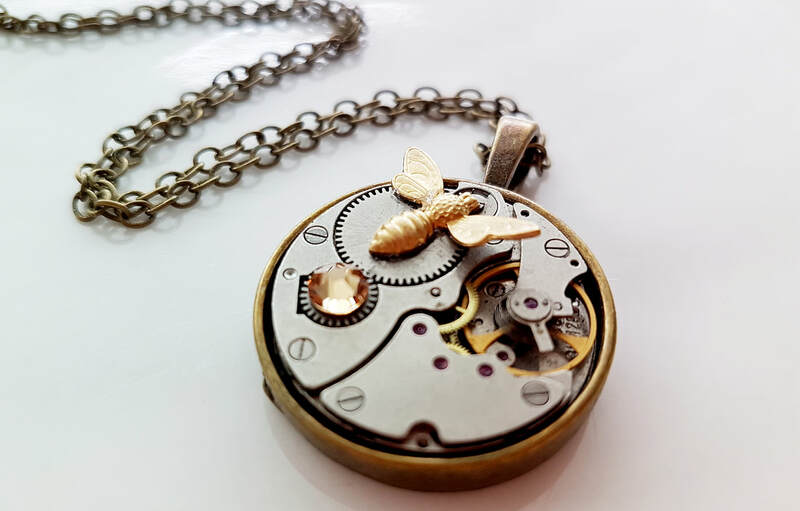 The total drop of the pendant is about 6cm. 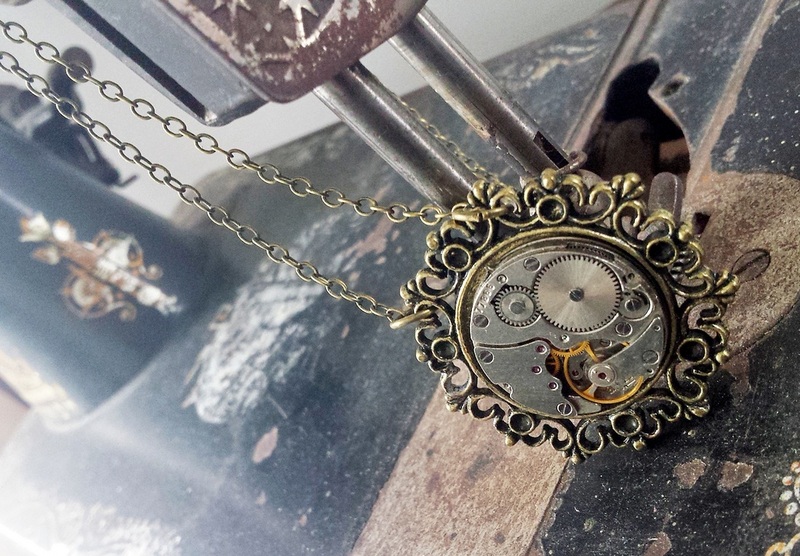 This gorgeous wee vintage watch movement is full of wonderful cogs, gears and tiny red ruby jewels. Fascinating in its detail. 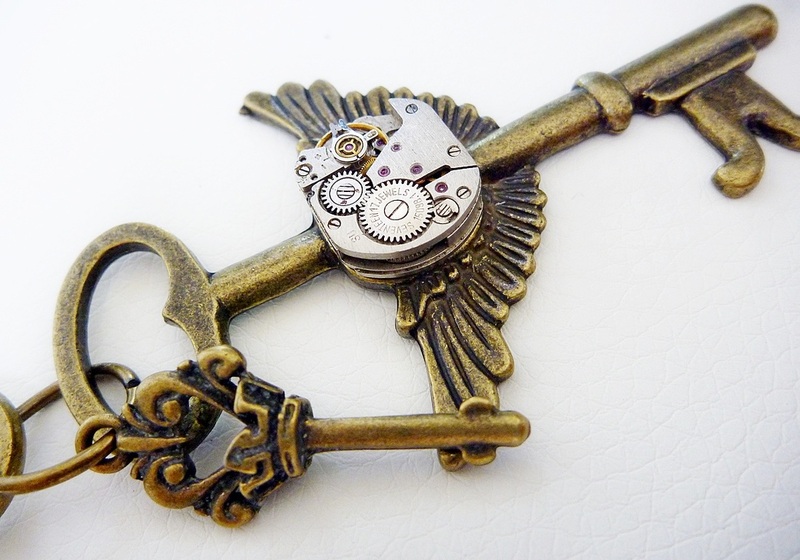 I have set this into an antiqued brass fob style setting. 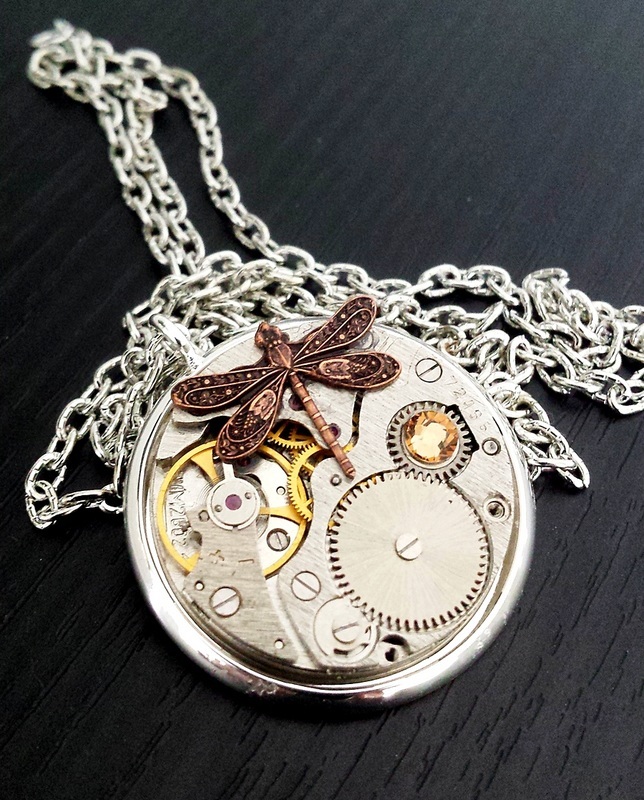 A stunning dragonfly with a 29mm wing span swings below. Strung on about 60cm of matching lead & nickle free chain. 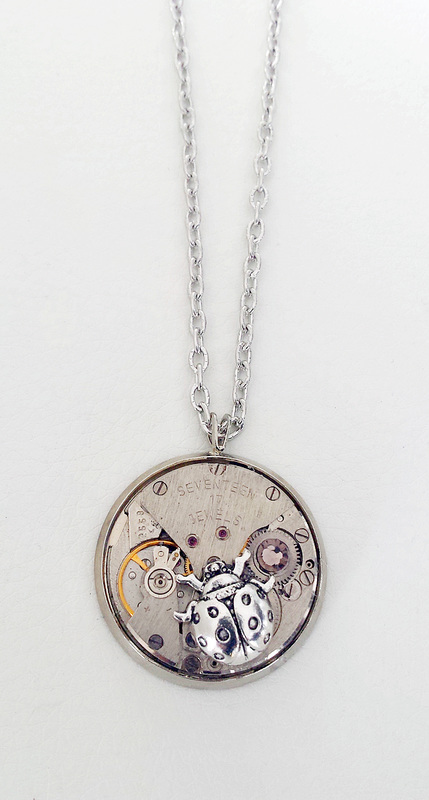 The total drop of the pendant is about 7cm. I can adjust the length of the chain on request, just leave instruction at check out or contact me. 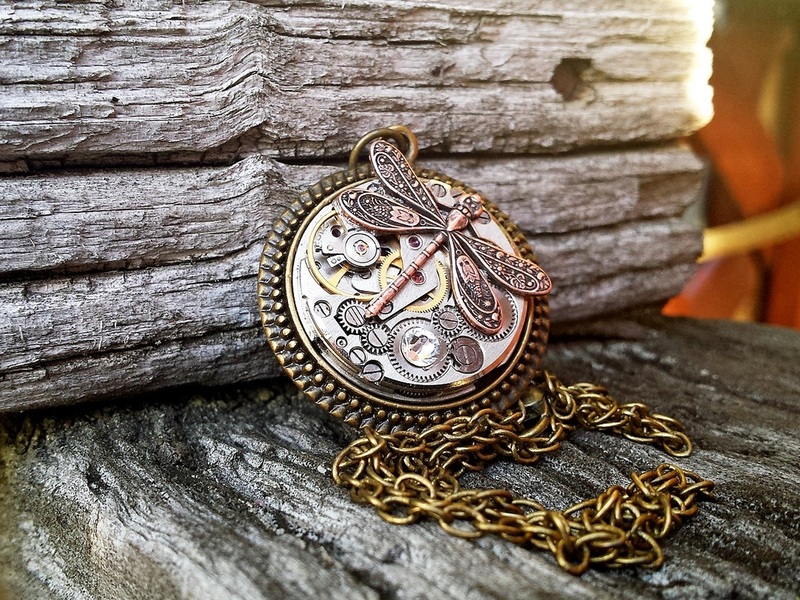 The antiqued brass setting is 2.5cm wide with a gorgeous detailed edging. 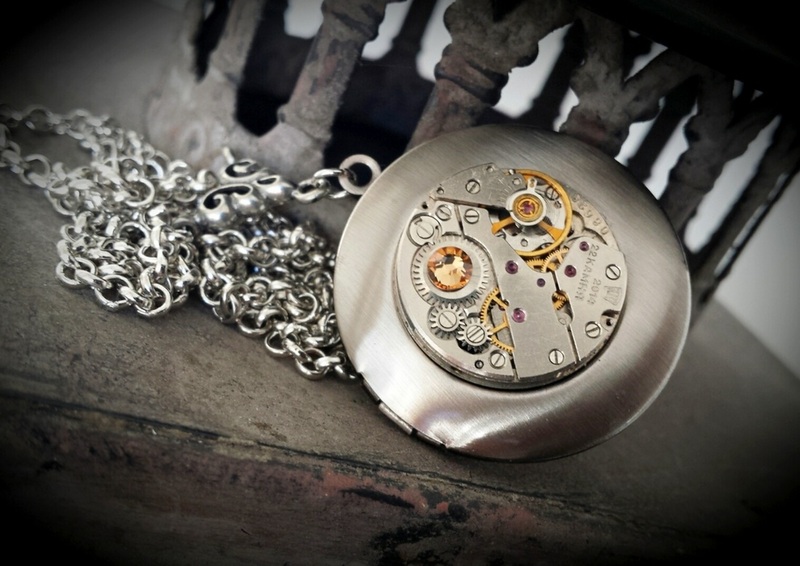 The vintage watch movement that is recessed into it is full of intricate cogs, gears and deep red industrial rubies. This dangles from a gorgeous wee bow brooch pin. The total drop is approx 4cm. I'm Happy to custom make, just contact me. 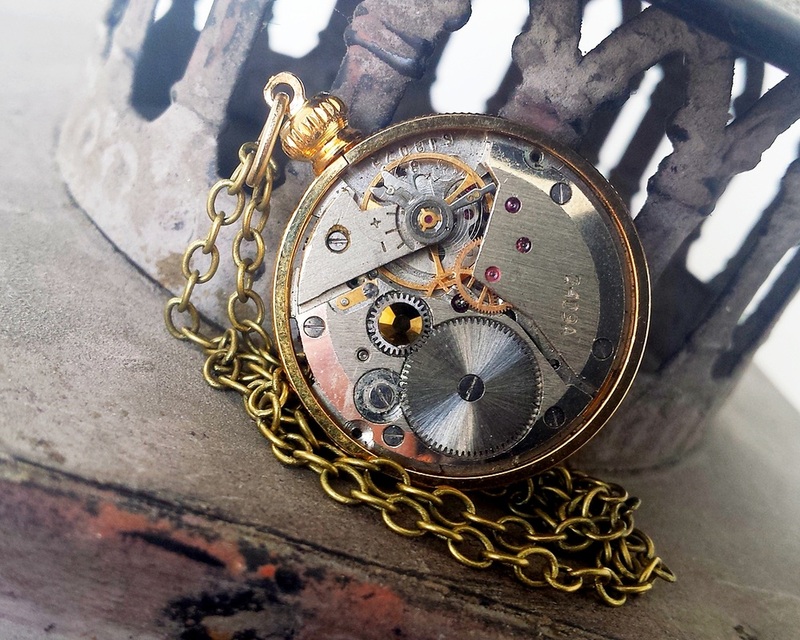 This fabulous vintage watch movement sits on a 3cm antiqued brass setting. 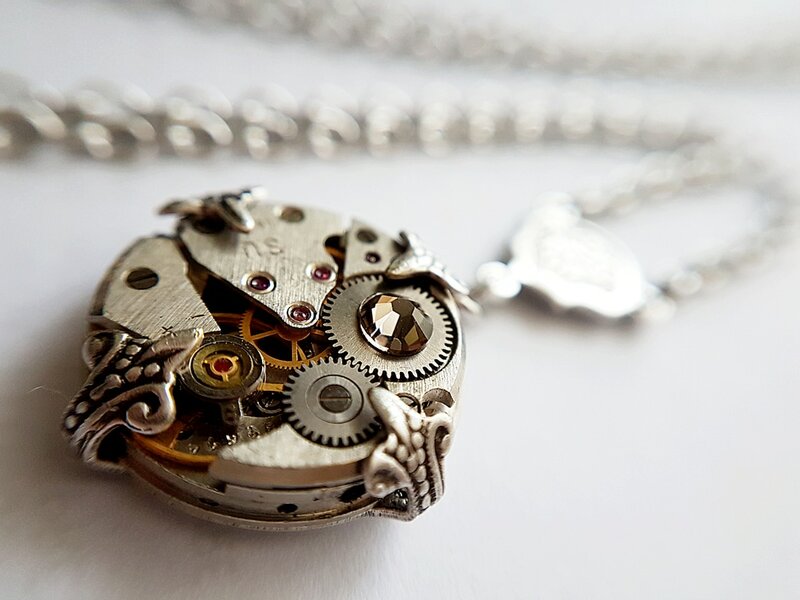 The gears, cogs and red ruby jewels are now exposed in all their fascinating detail. 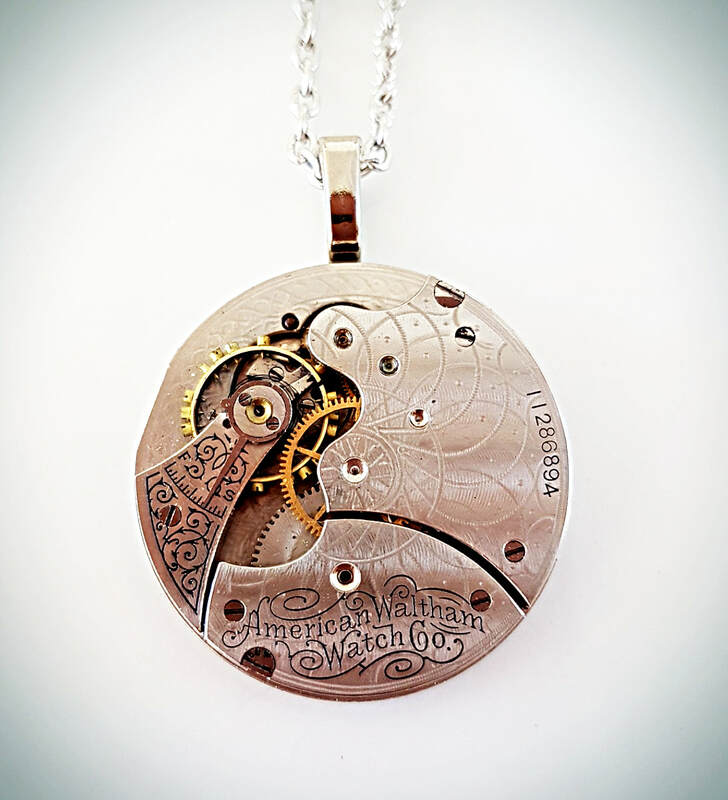 A gorgeous detailed antiqued brass goddess and moon curve perfectly around the top of the movement. The matching lead & nickel free cable chain is about 60cm long. I am happy to custom make, just contact me. Several items can be sent together for the one shipping cost. 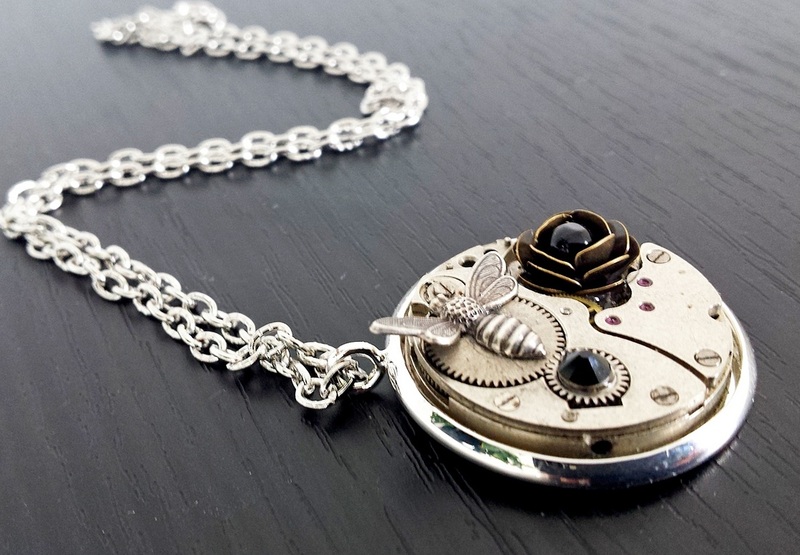 A Stunning detailed antiqued silver honey bee, Metal Rose with a central black bead and a sparkly Jet Black Swarovski crystal adorn this intricate vintage watch movement. 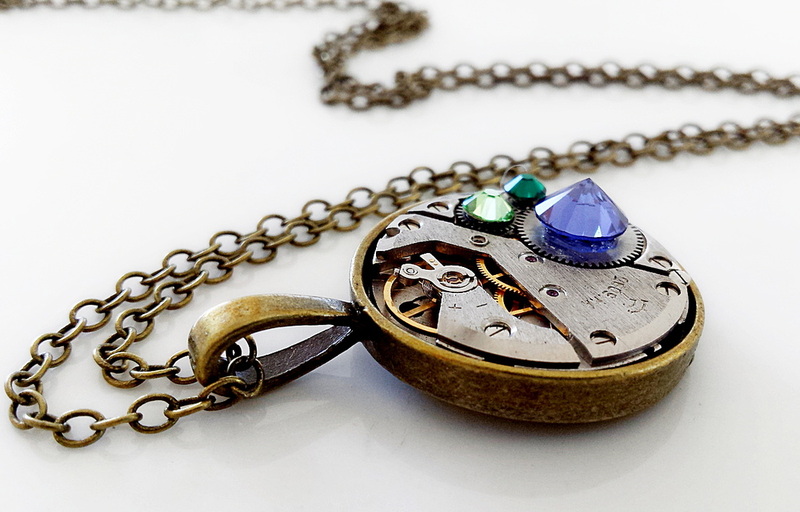 The intriguing cogs, gears and red ruby jewels are now on show. 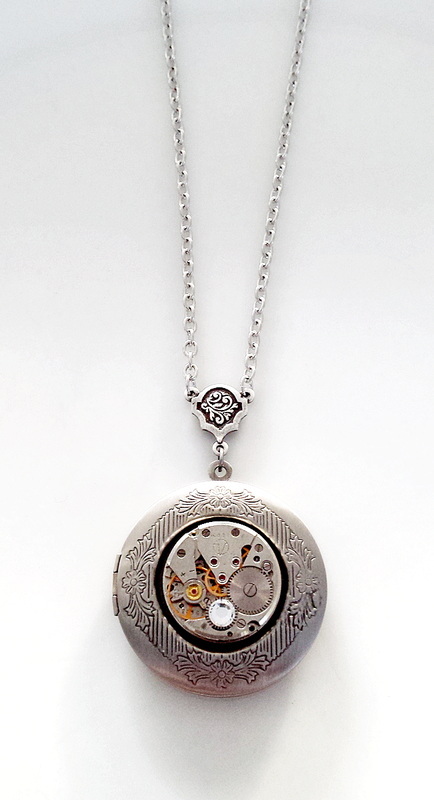 I have recessed the movement into a 3cm wide silver bezel setting & hung it from 60cm of matching cable chain. Contact me if you like this, but want it changed some way. 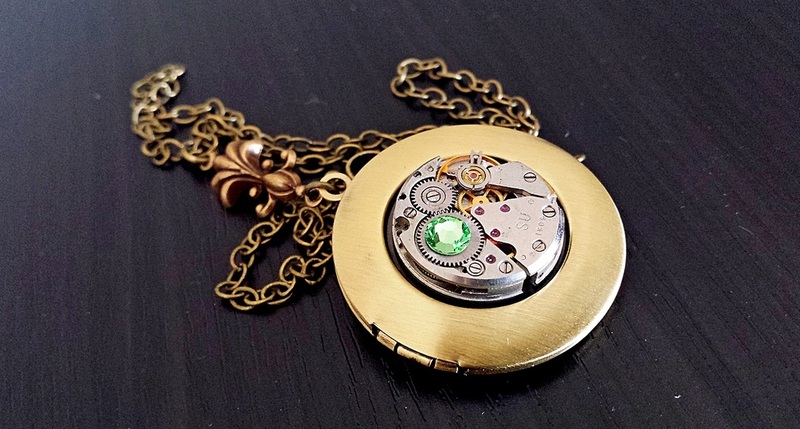 This 26mm vintage watch movement is recessed into a sturdy 45mm filigree brass setting. 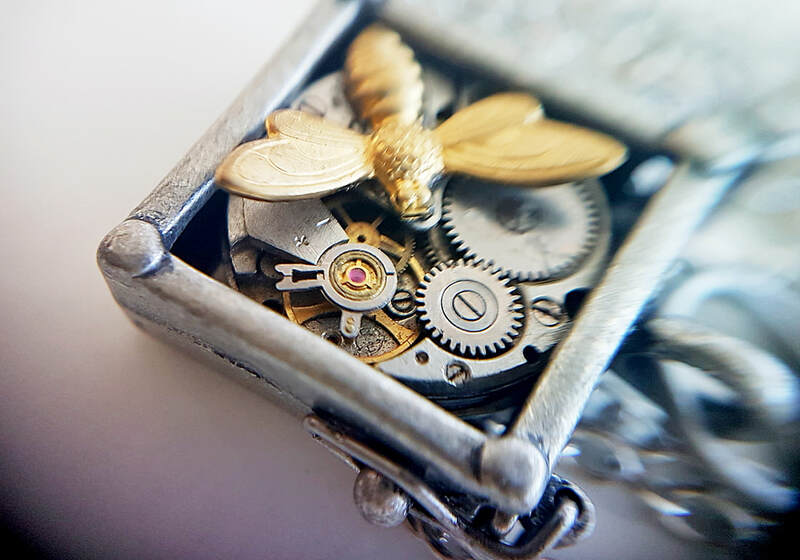 The intricate detail of the movement and watch are fascinating. I have strung this from 80cm of matching antiqued brass chain. This can be adjusted at no extra cost, just leave instruction at check-out. 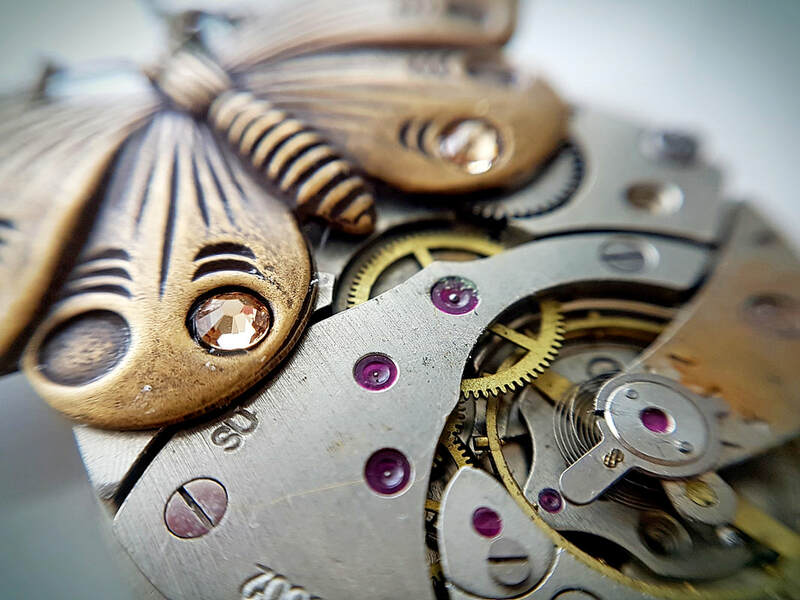 This intricate wee watch movement is from a ladies 17 jeweled wrist watch. Some of the red rubies are now exposed. 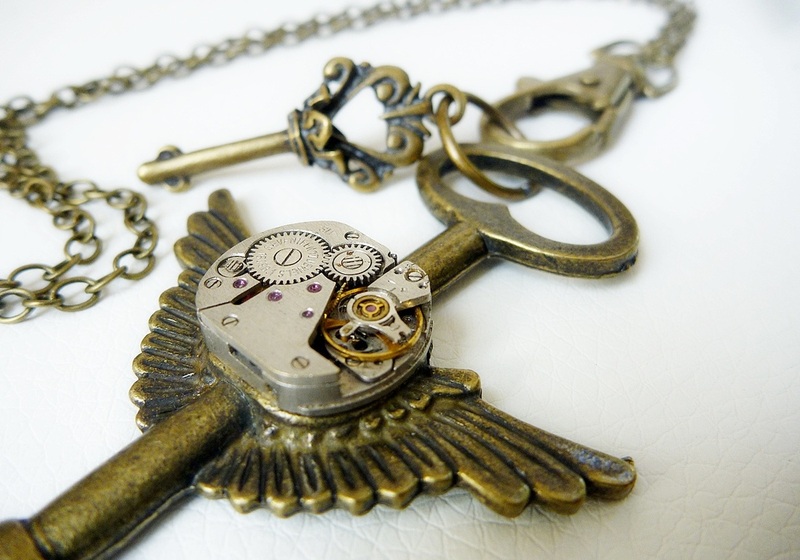 It sits on a winged Antiqued brass Key hanging from an over-sized clasp along with another funky detailed key. The matching lead & nickel free chain is about 60cm long, just leave a message at checkout if you want this length altered. This Gargoyle is fabulous with its raised detailing. 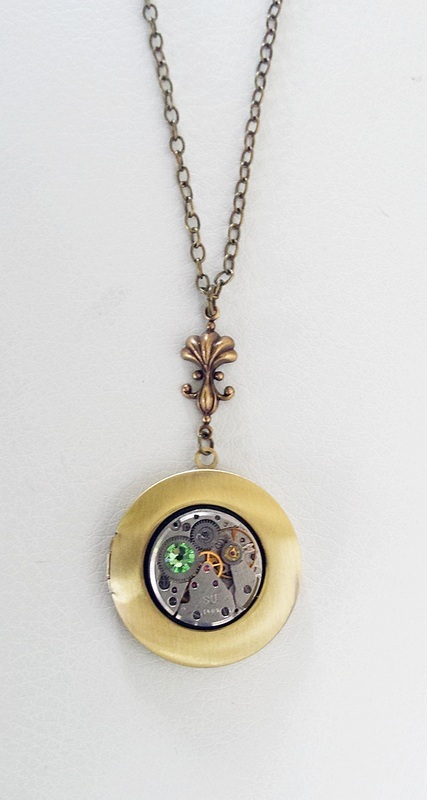 Below him hangs a 2 cm wide vintage brass watch movement with a golden topaz Swarovski crystal set in the centre of a cog. 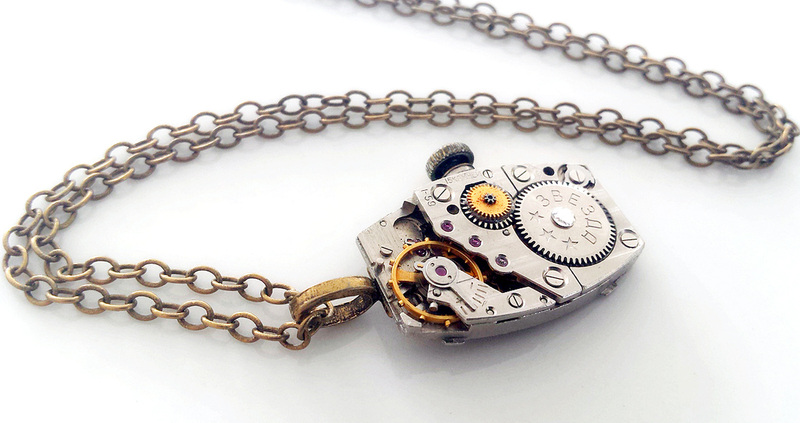 The matching antiqued brass chain is about 60cm long, lead & Nickel free. 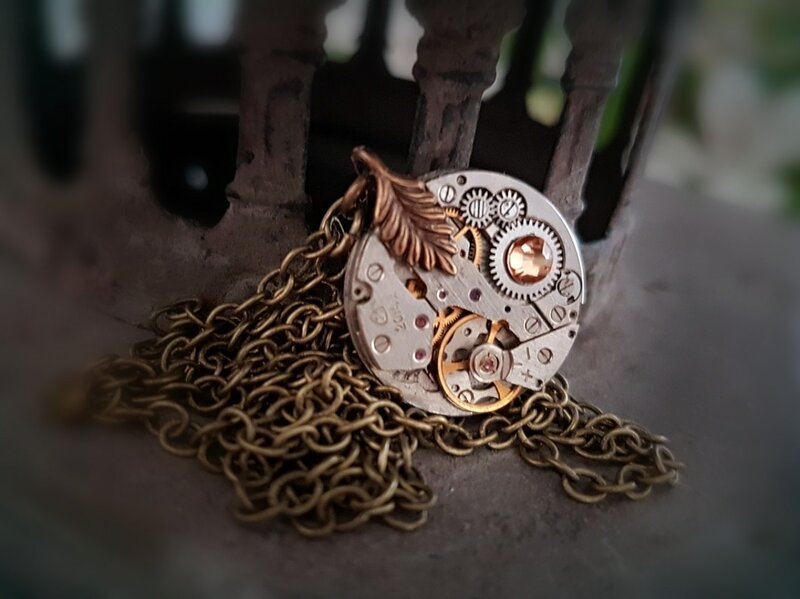 Each Steampunk inspired piece that I make will be unique in some way.